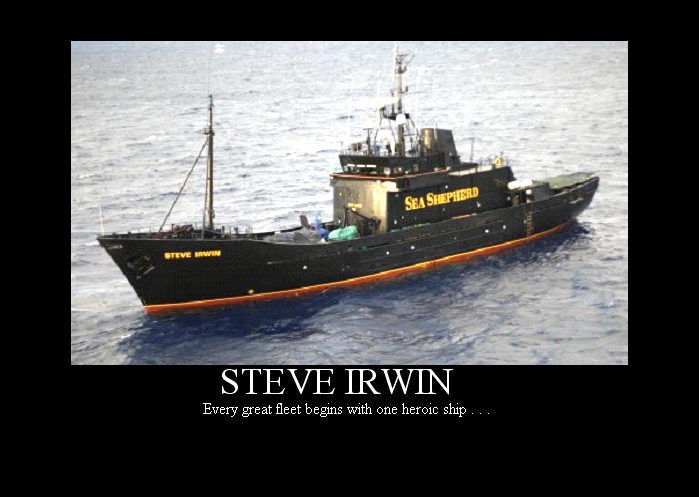 Marine Biology "HALL of FAME"
So you what to become a Marine Biologist! 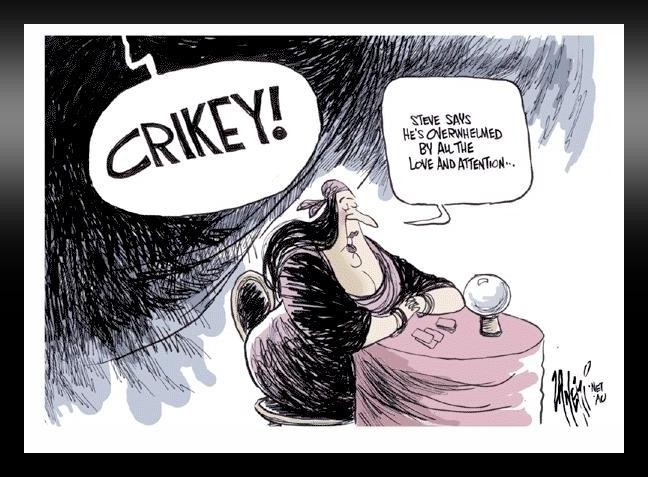 "Transient" Killer Whales a species? 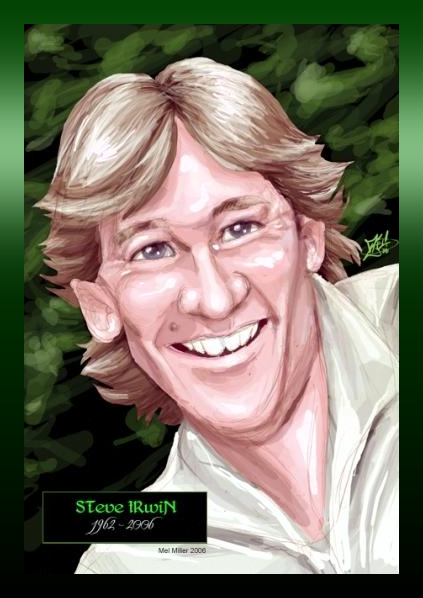 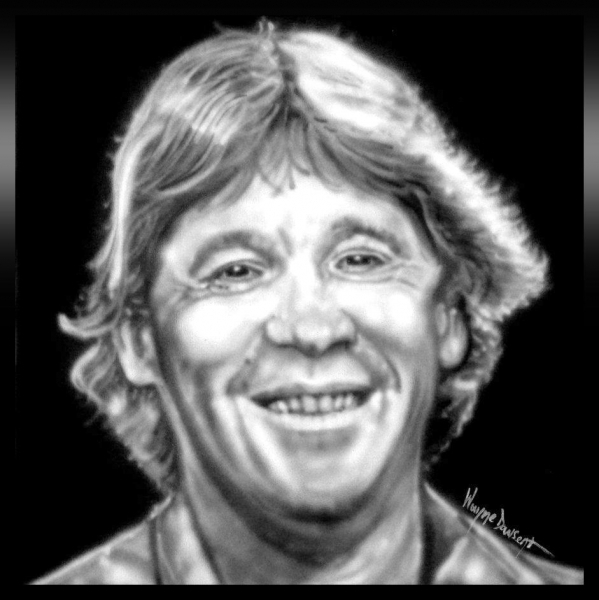 Another of Steve’s favorite songs, “I AM AUSTRALIAN” is a popular Australian folk song written in 1987 by Bruce Woodley of “The Seekers” and Dobe Newton of “The Bushwackers”. 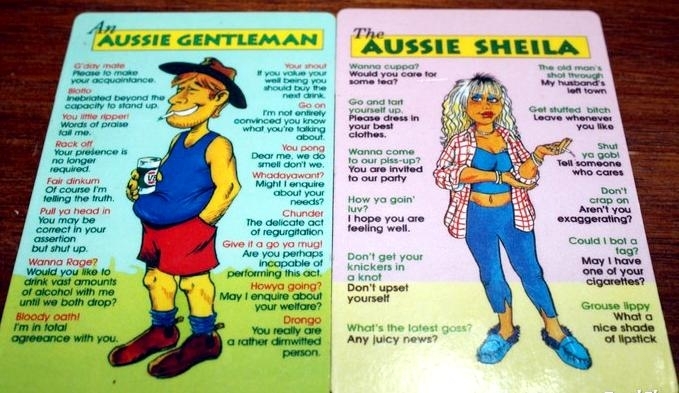 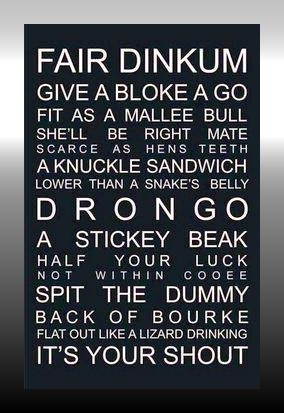 The song’s lyrics are filled with many historic and cultural references such as ”digger”, “Albert Namatjira”, “Clancy”, “battler”, “Ned Kelly”, “Waltz Matilda” and “bushy”. 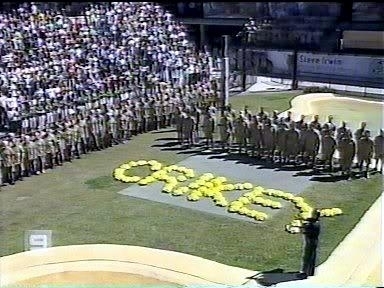 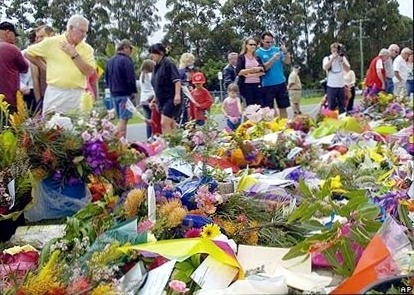 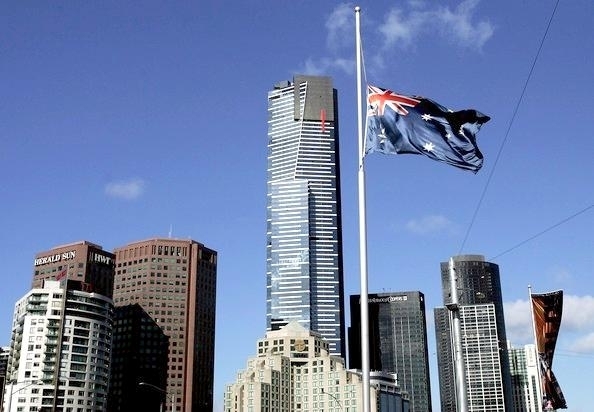 The song’s popularity has allowed it to join the ranks of other patriotic songs considered as alternatives to the current Australian National Anthem ”Advance Australia Fair”. 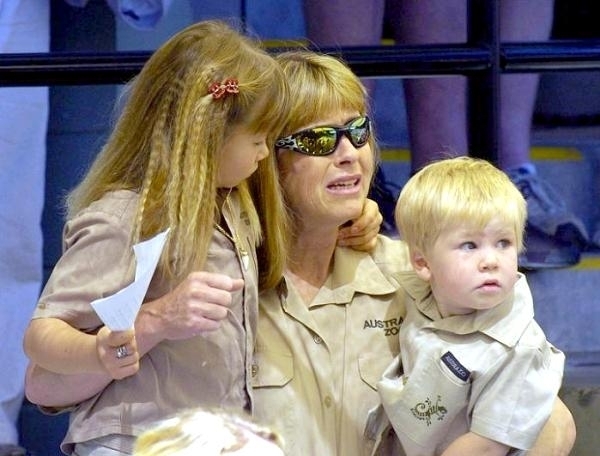 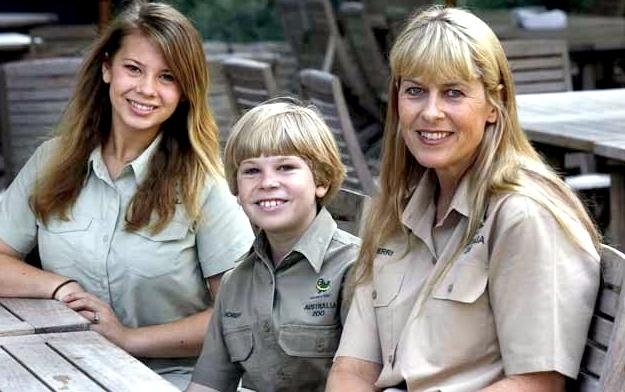 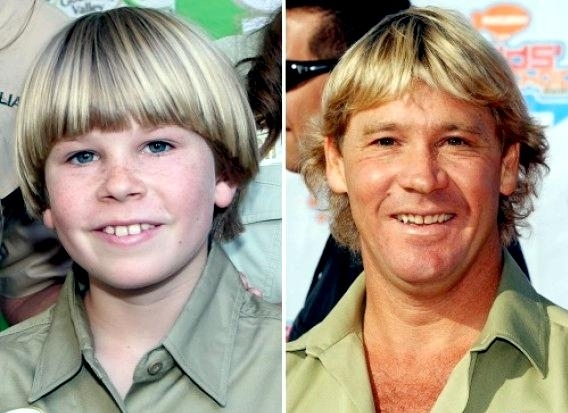 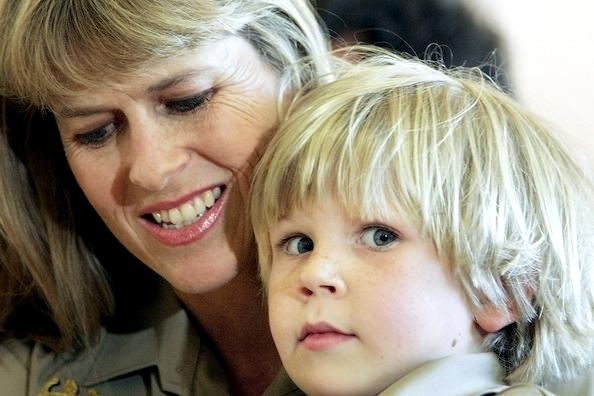 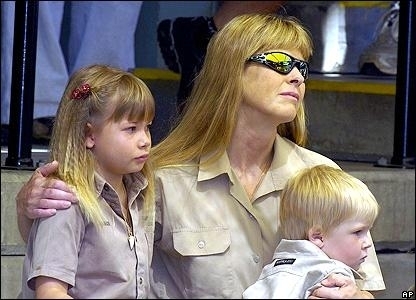 Stephen Robert Irwin was born to Lyn and Bob Irwin on February 22, 1962 in Essendon, near Melbourne, Australia. 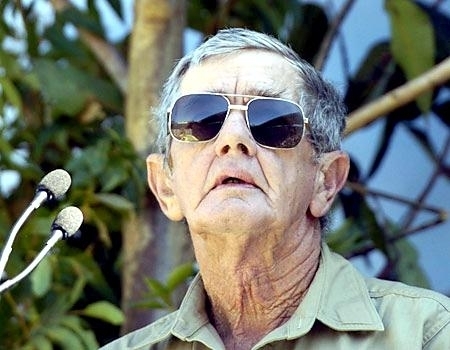 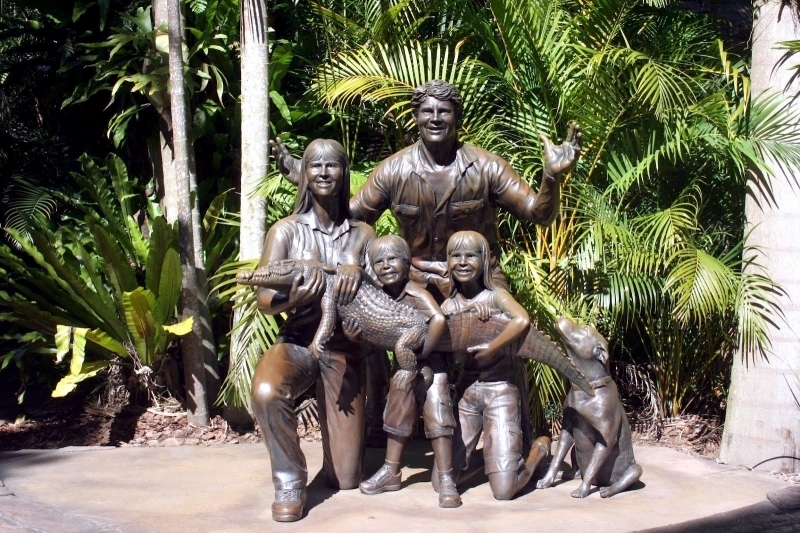 He moved with his parents and sisters Mandy & Joy to Beerwah, Queensland where his folks opened the Beerwah Reptile and Fauna Park in 1970. 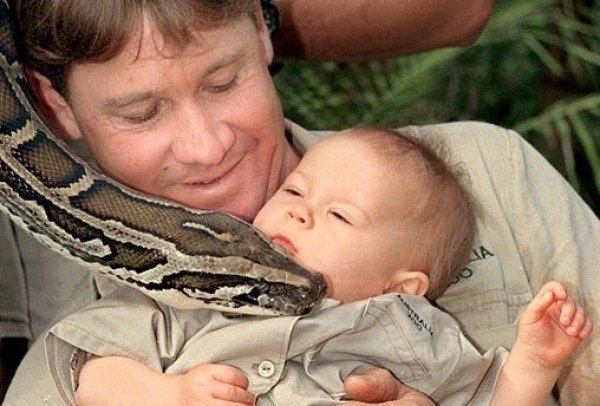 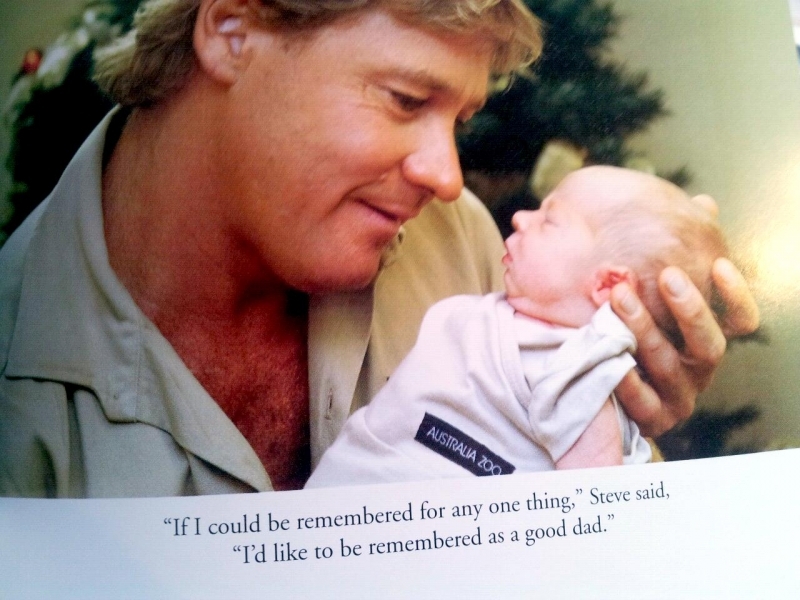 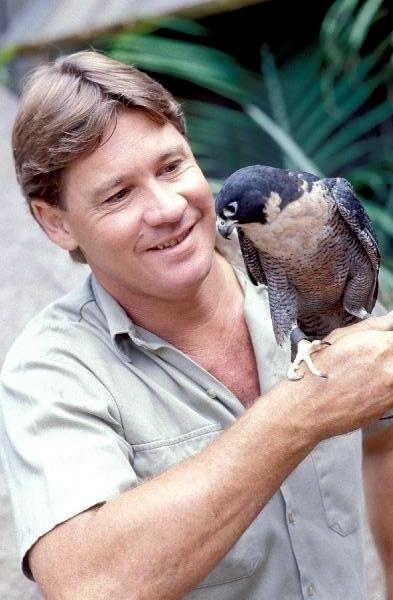 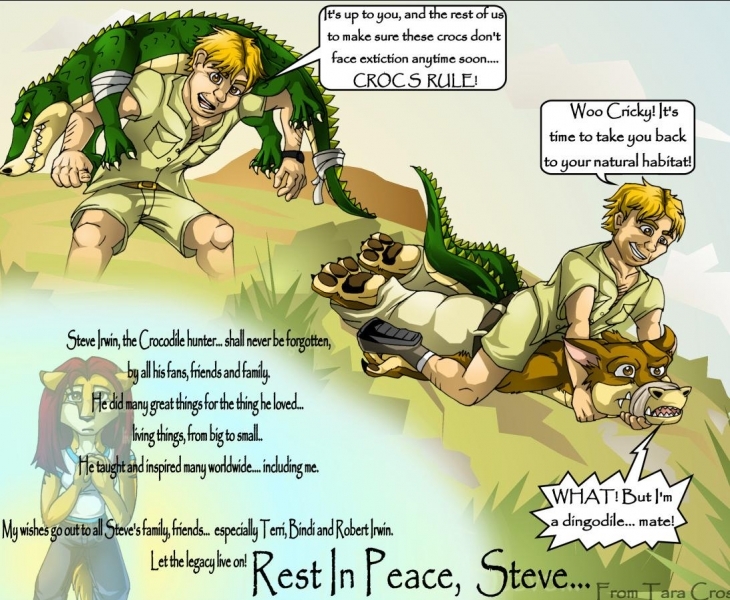 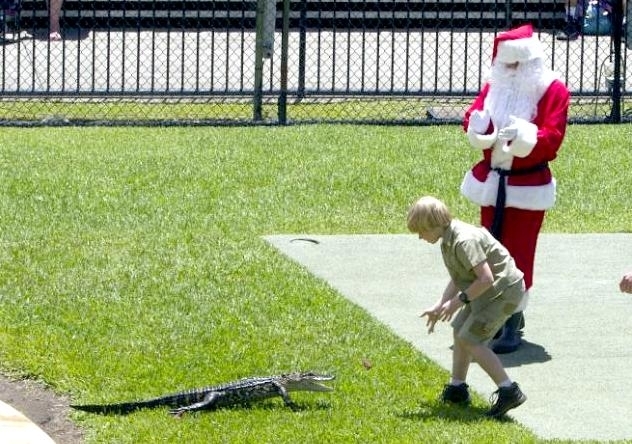 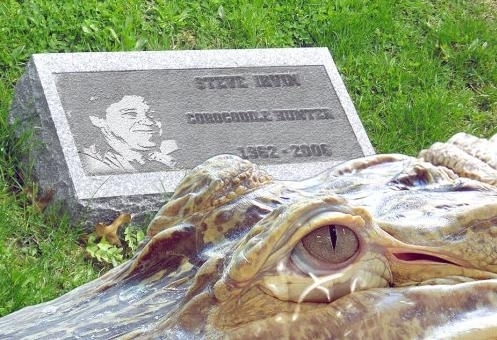 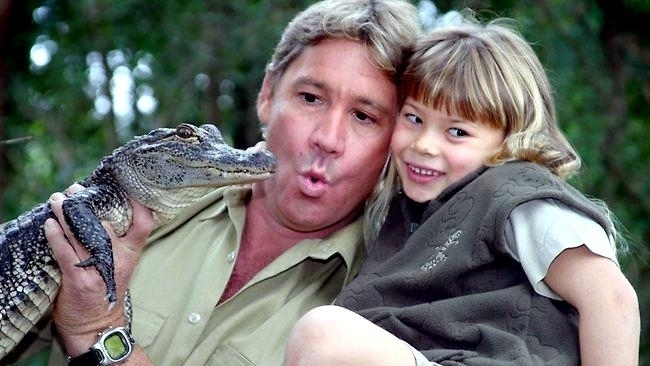 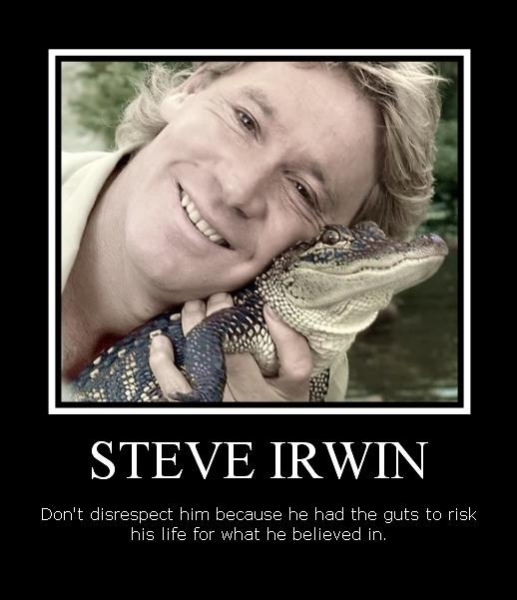 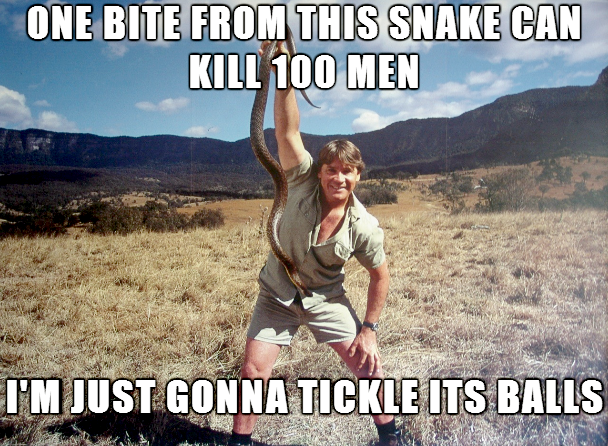 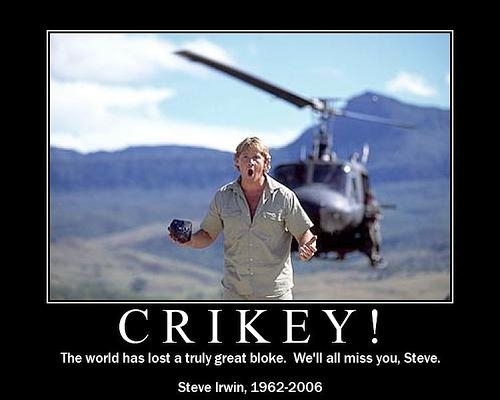 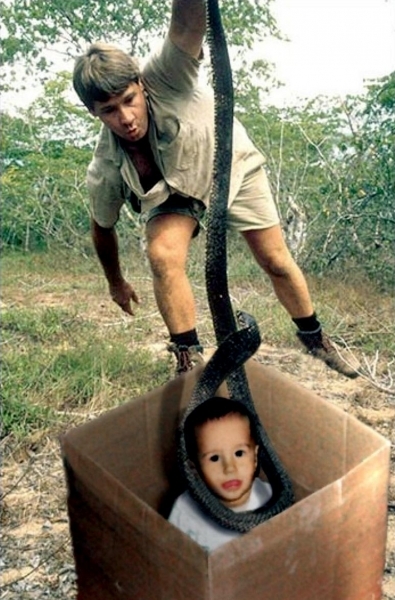 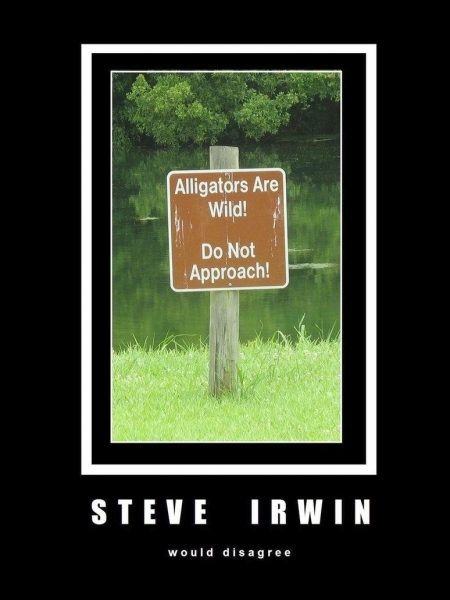 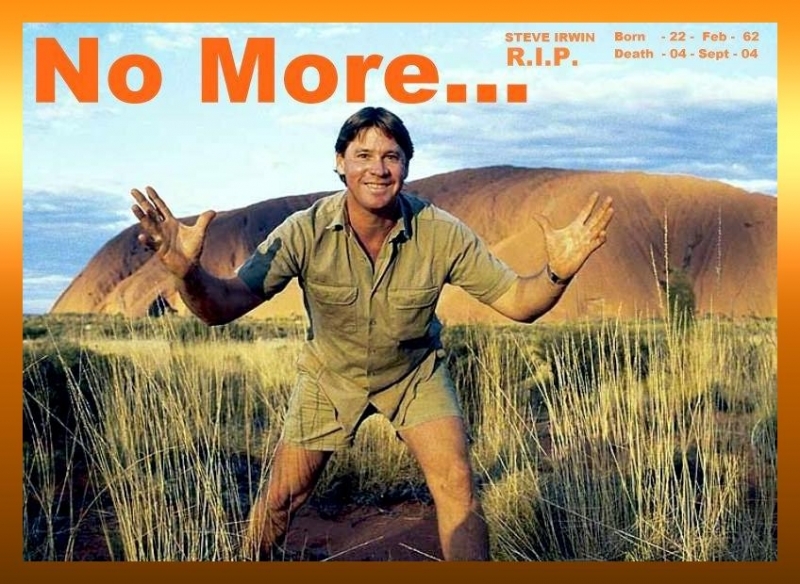 Steve grew up loving all wildlife especially reptiles. 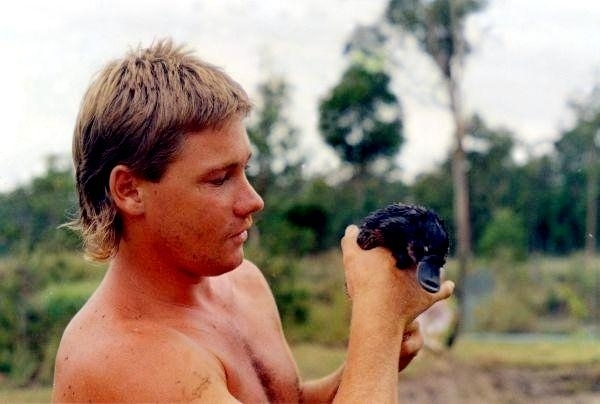 He caught his first venomous snake (a Common Brown) at the tender age of 6 and would often arrive late to school after convincing his mother to pull over so he could rescue a lizard off the road. 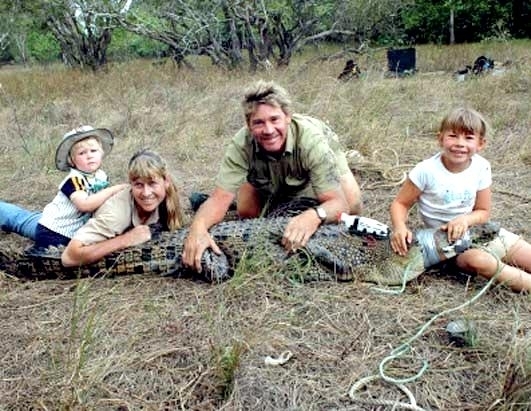 By the time he was 9, he was helping his dad catch small problem crocodiles hanging around boat ramps by jumping on them in the water and wrestling them back into the dinghy. 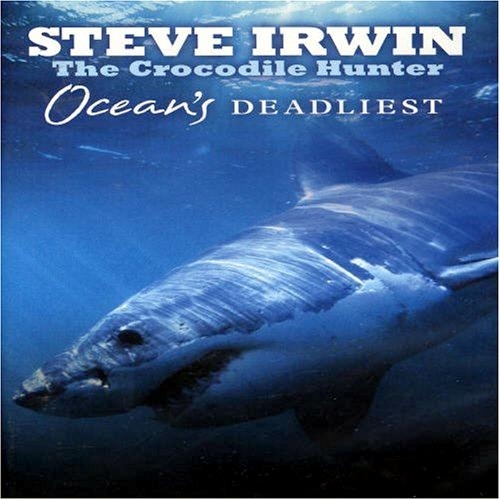 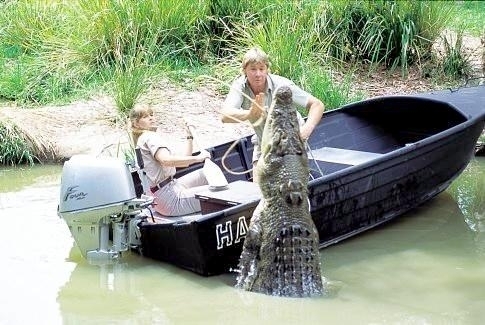 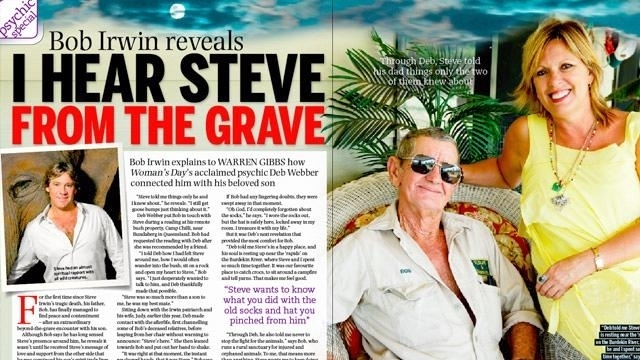 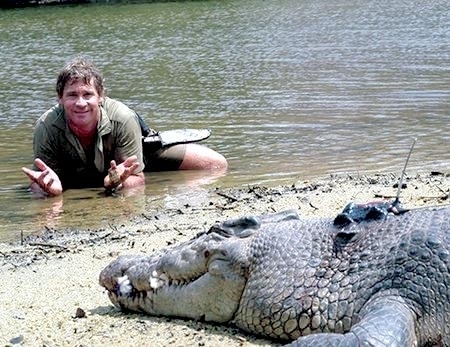 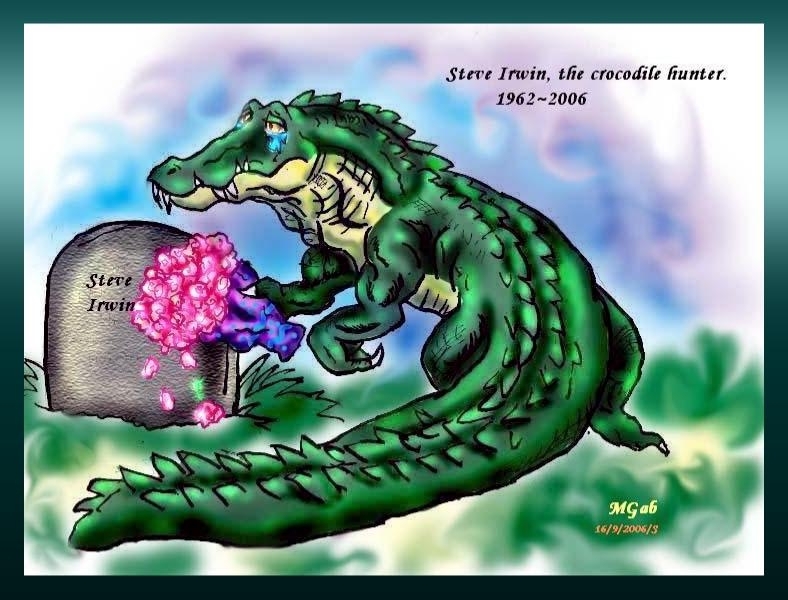 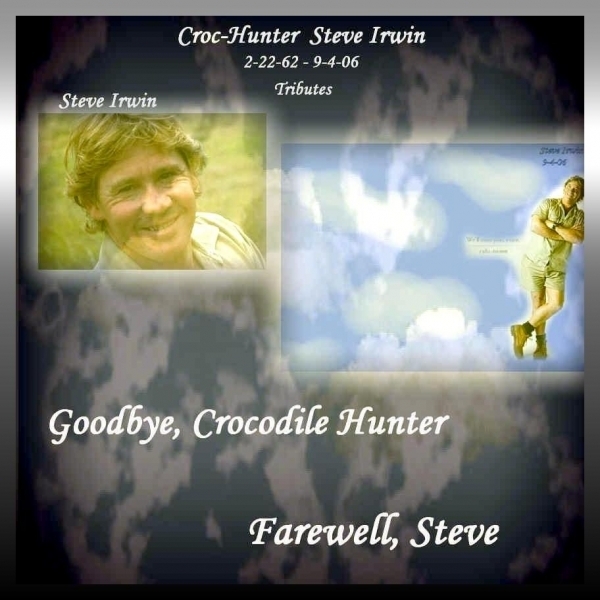 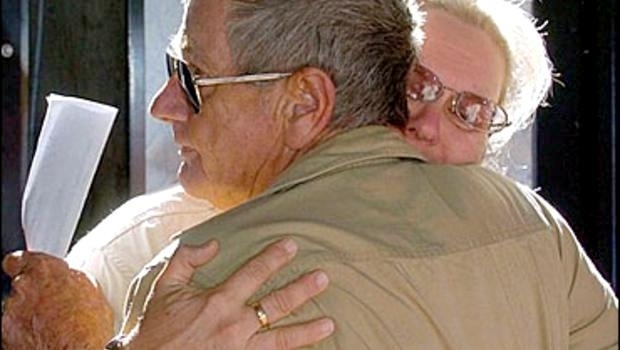 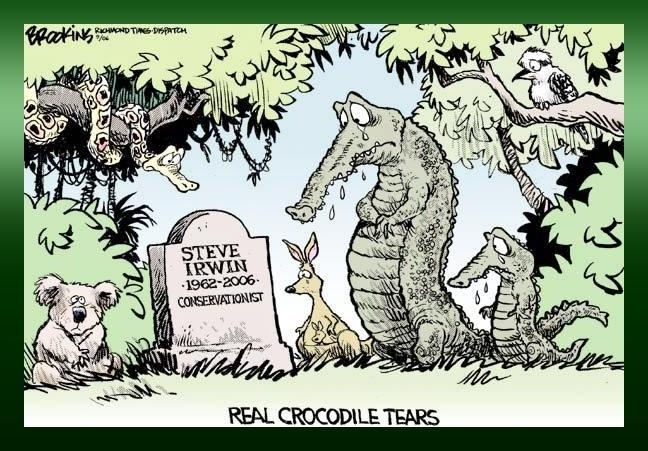 In the 1980’s, Steve spent months on end living in the most remote areas of far North Queensland catching problem crocodiles before they ended up shot by a poacher’s bullet. 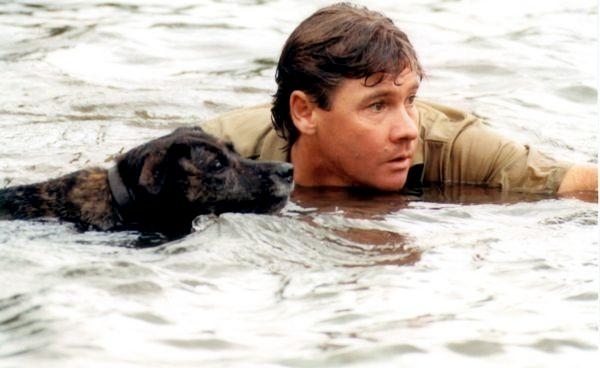 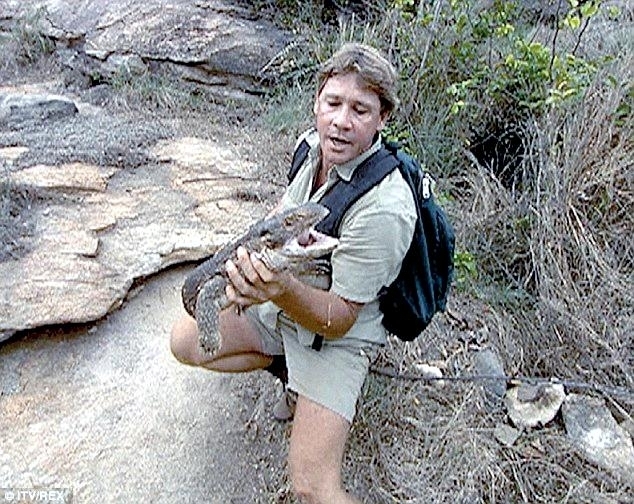 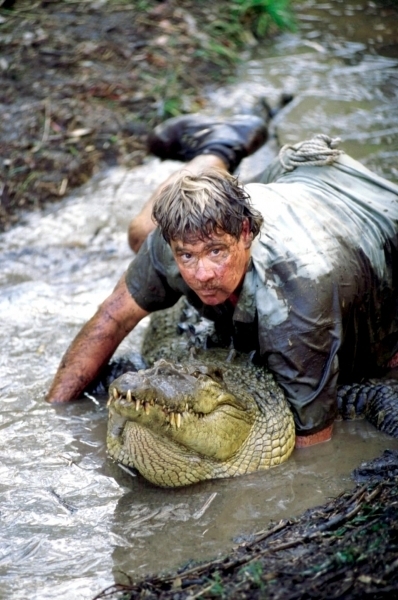 He worked with his little dog Sui and developed crocodile capture & management techniques that are now utilized with crocodilians around the world. 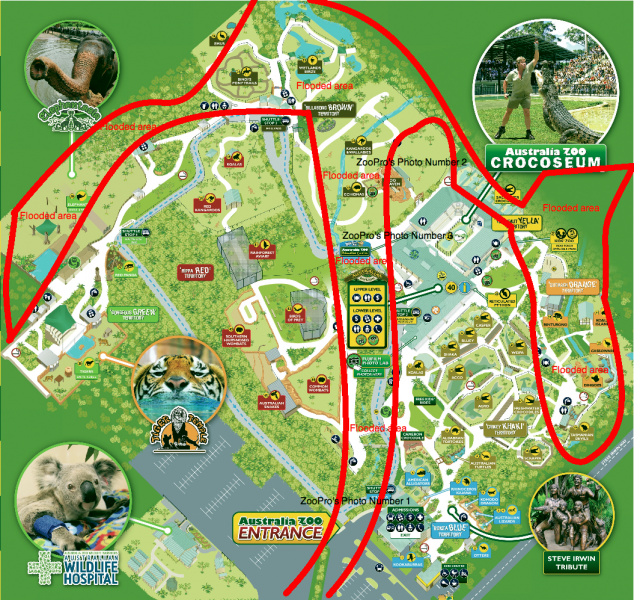 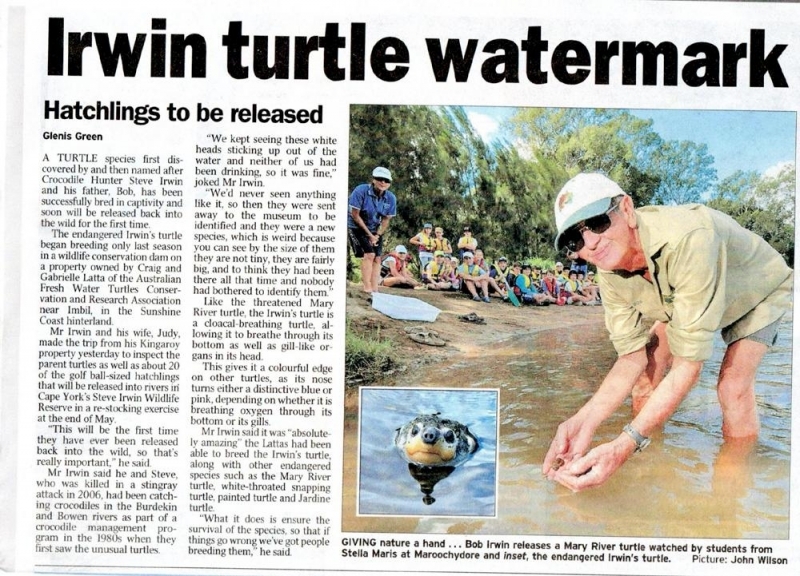 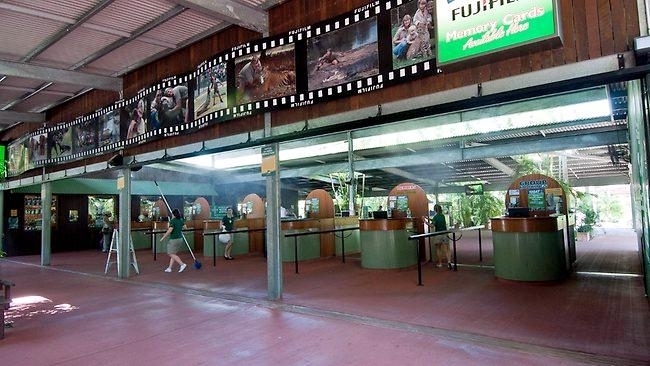 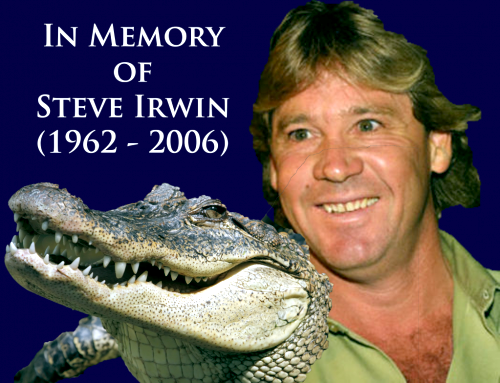 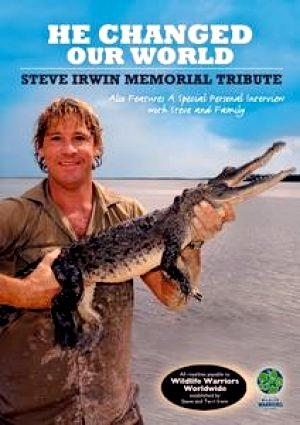 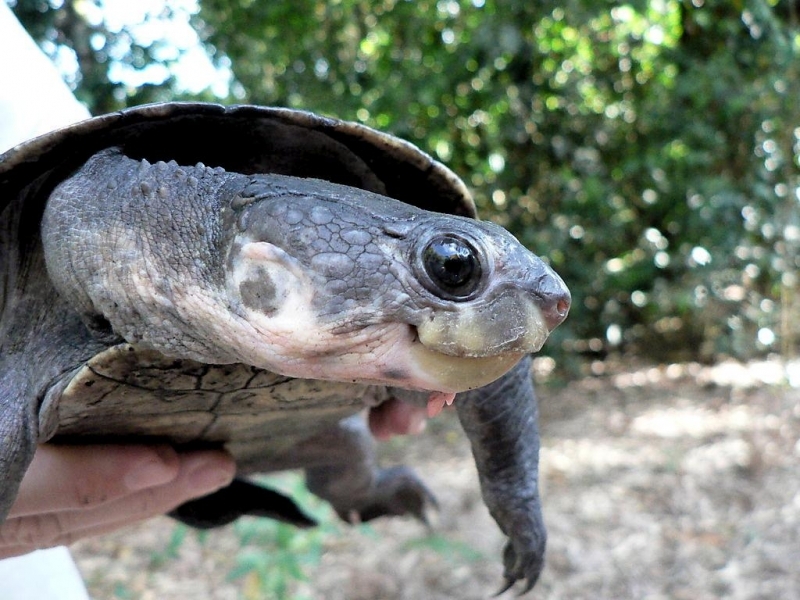 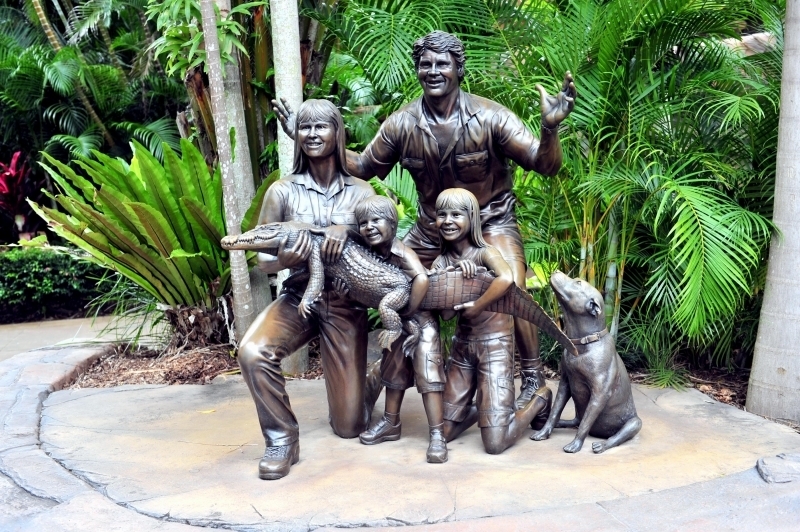 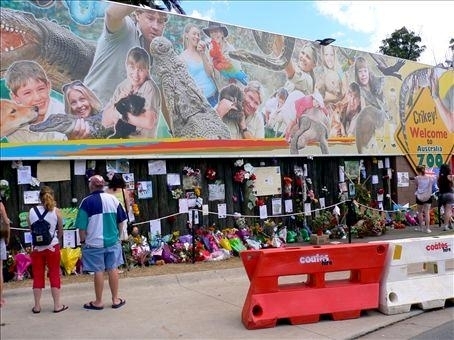 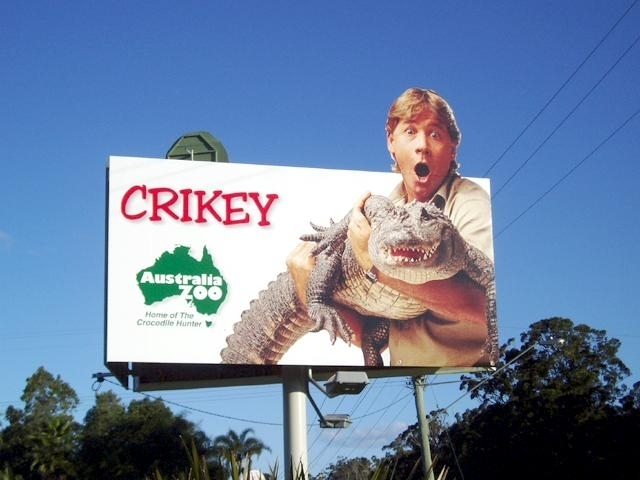 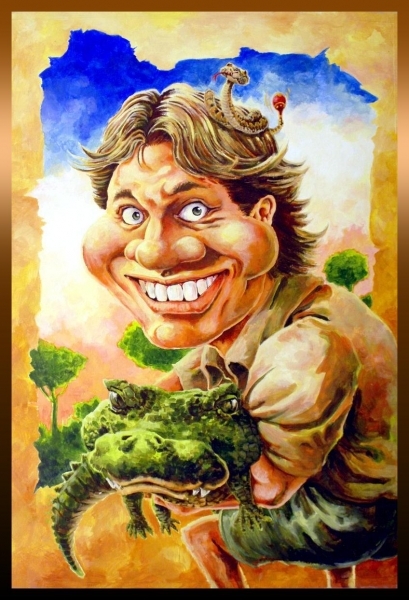 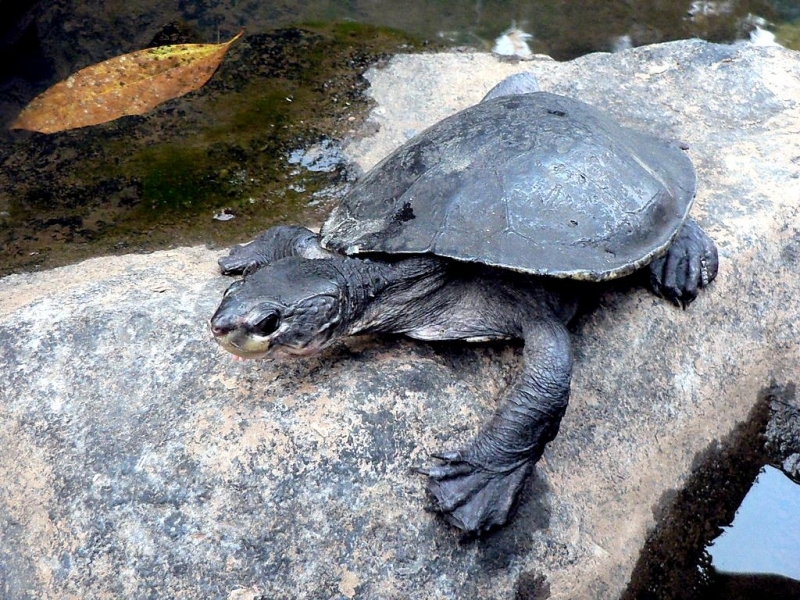 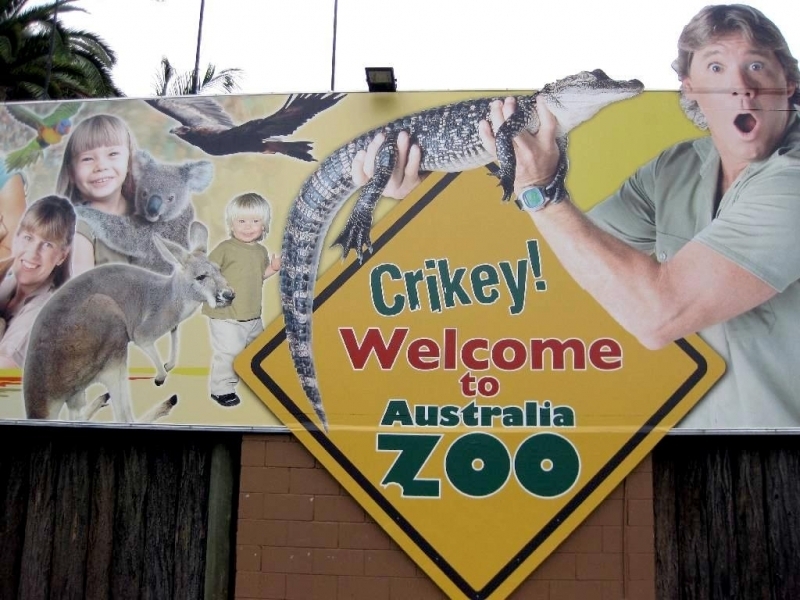 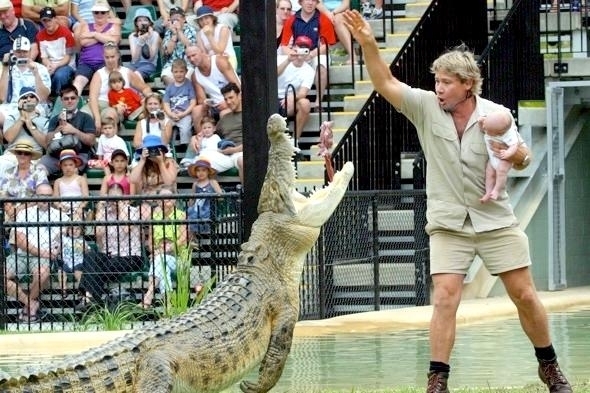 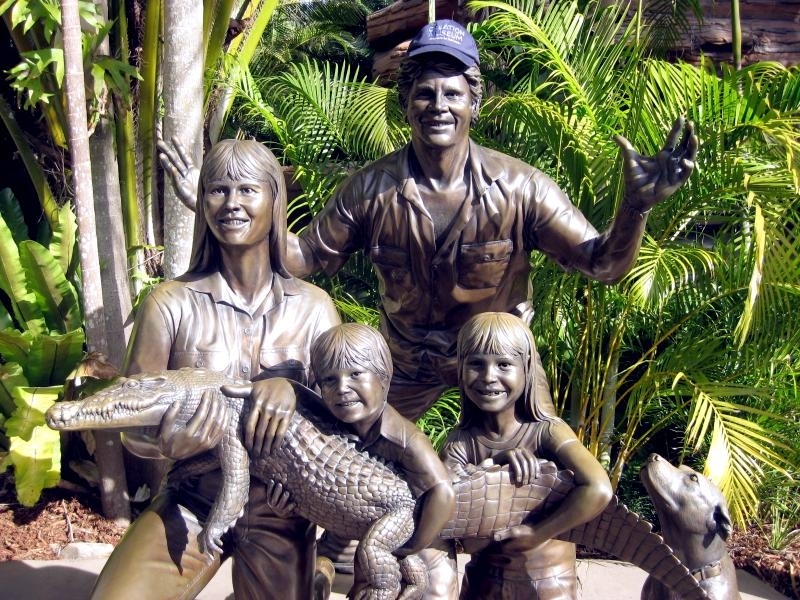 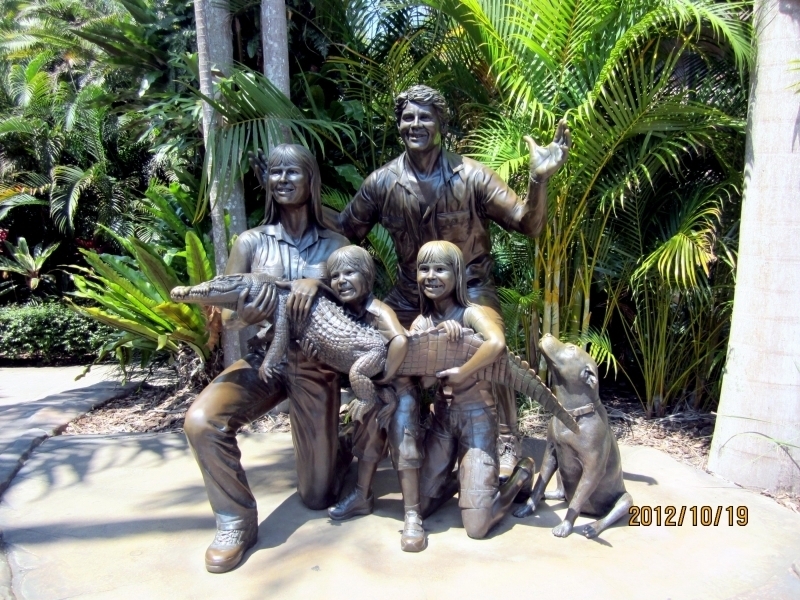 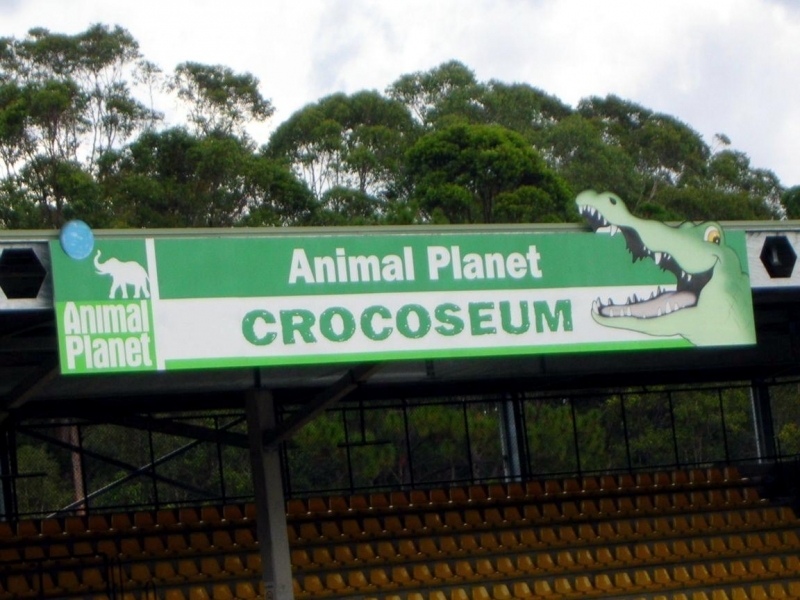 By 1980, the family wildlife park was called the “Queensland Reptile & Fauna Park” and where Steve called home. 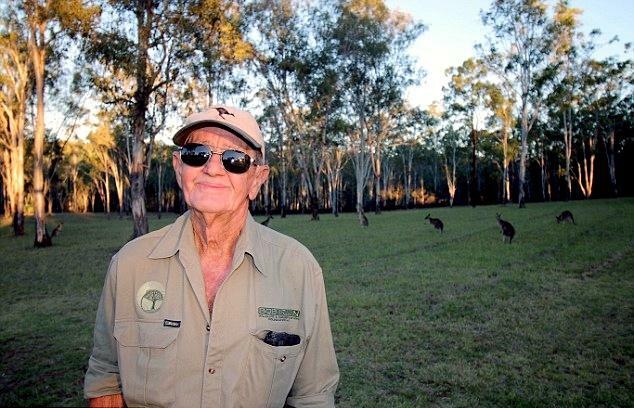 Steve and his best mate Wes Mannion, worked countless hours caring for the wildlife and maintaining the grounds. 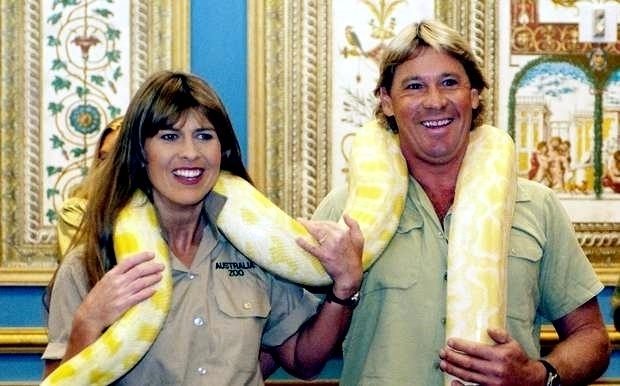 In 1991, Steve took over managing the wildlife park and met Terri Raines, a visiting tourist on October 6th. 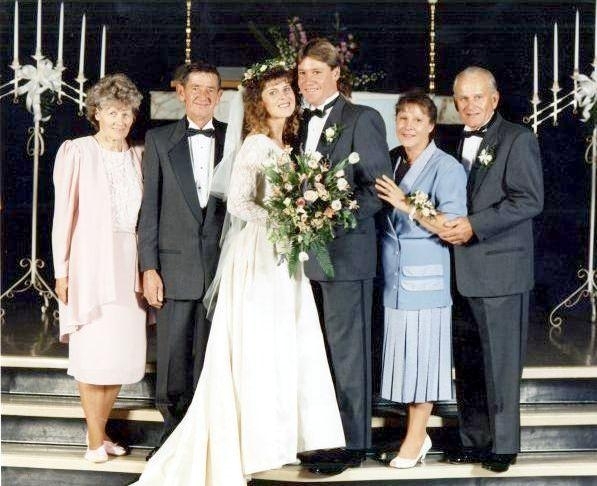 Steve & Terri were married in Eugene, Oregon on the June 4, 1992 at the Methodist Church Terri’s grandmother used to attend. 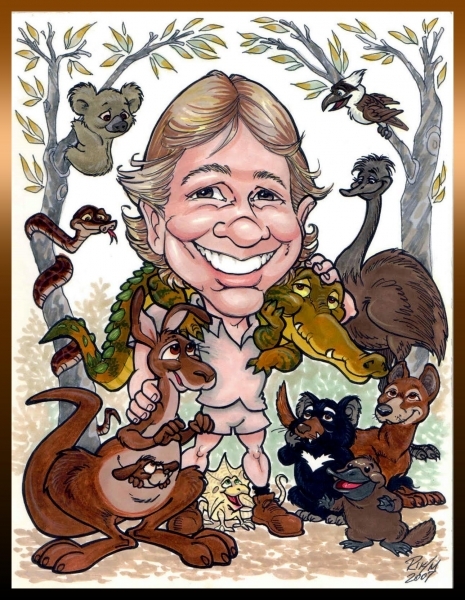 He always had an uncanny sixth sense when it came to wildlife and he spent his life honing that special gift. 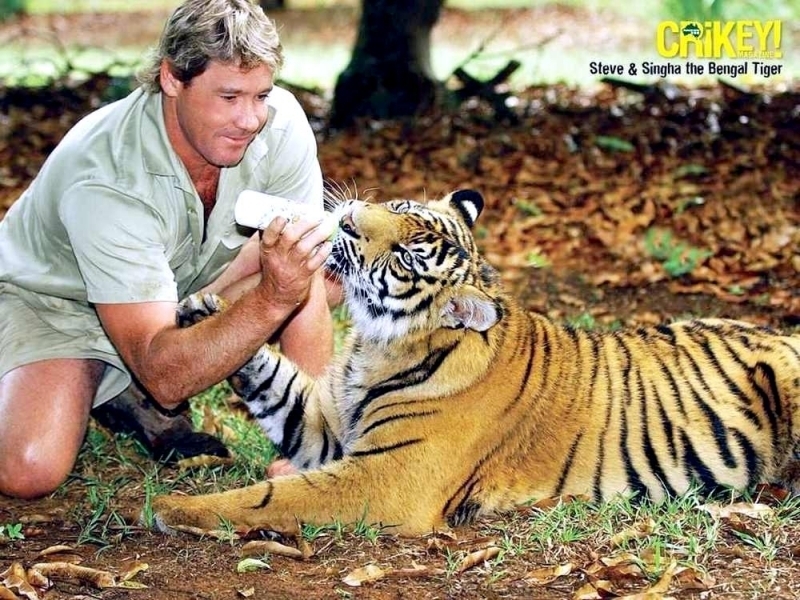 Instead of a honeymoon, the couple embarked on filming a wildlife documentary with his long-time friend & business manager John Stainton from the “Best Picture Show” company. 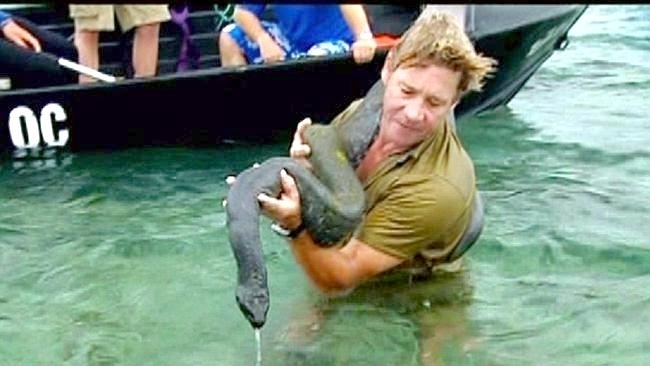 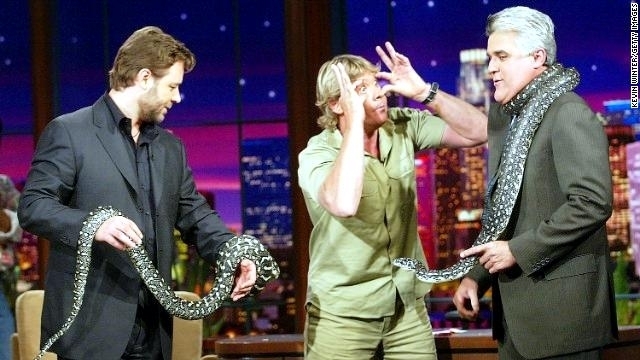 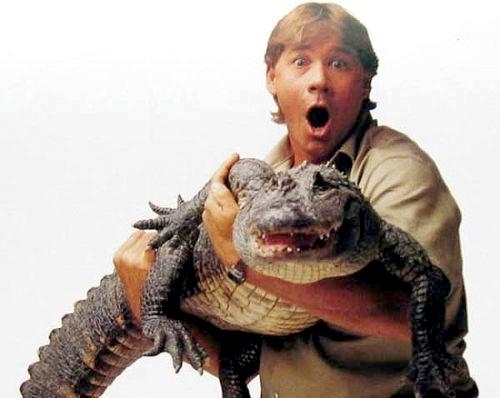 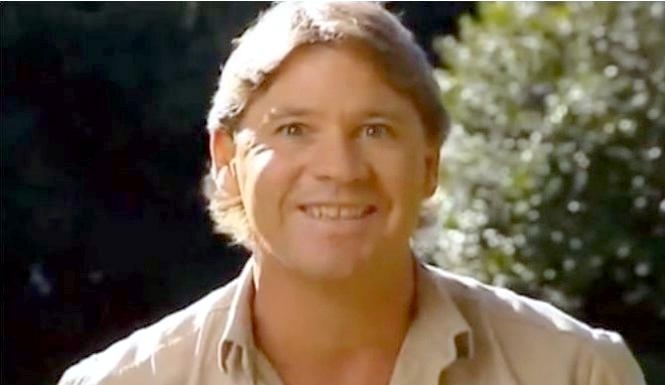 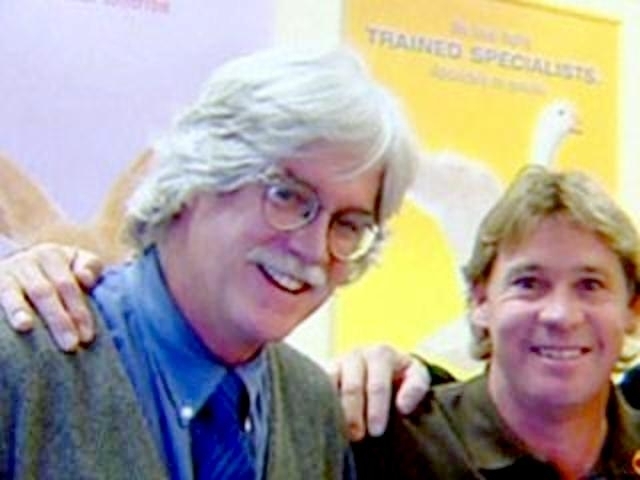 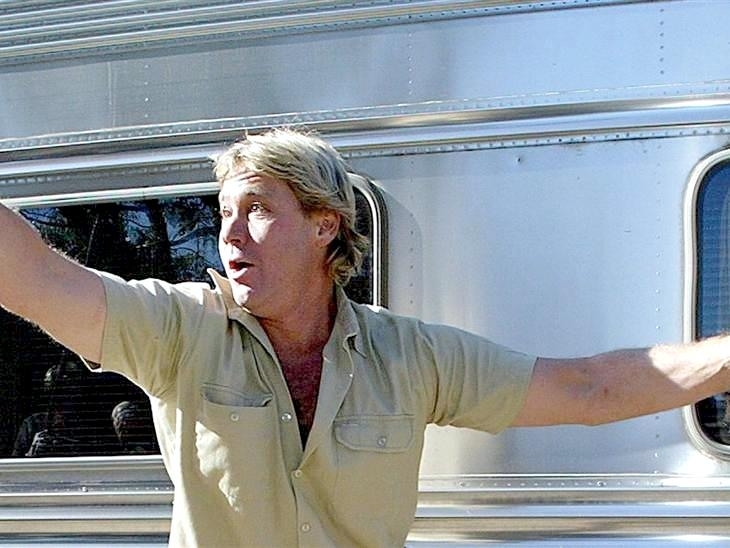 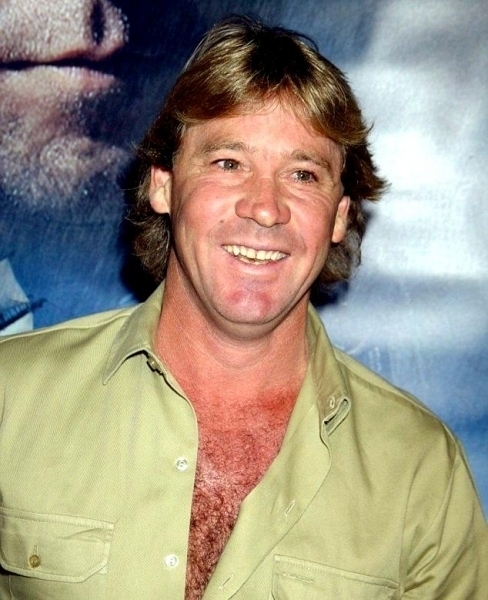 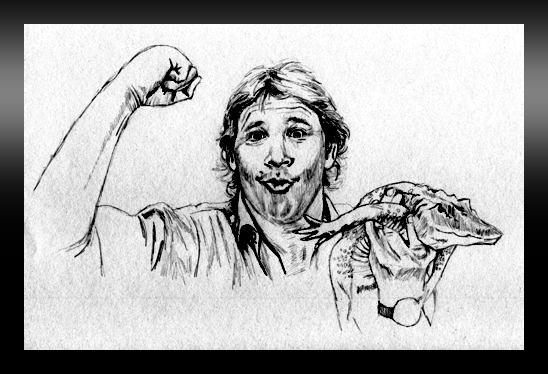 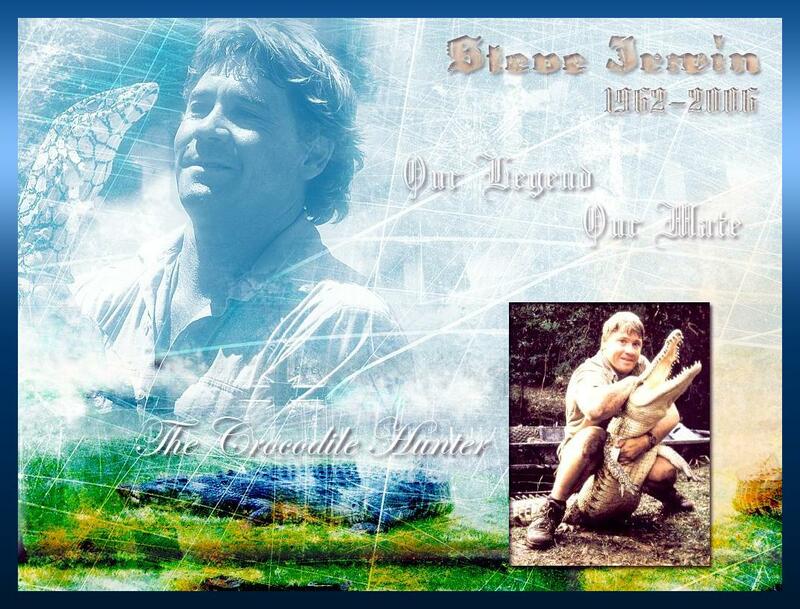 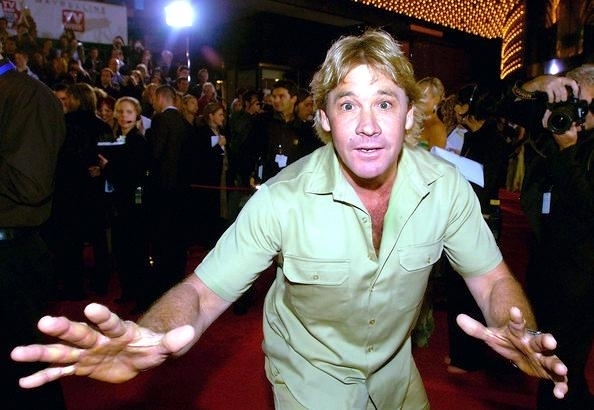 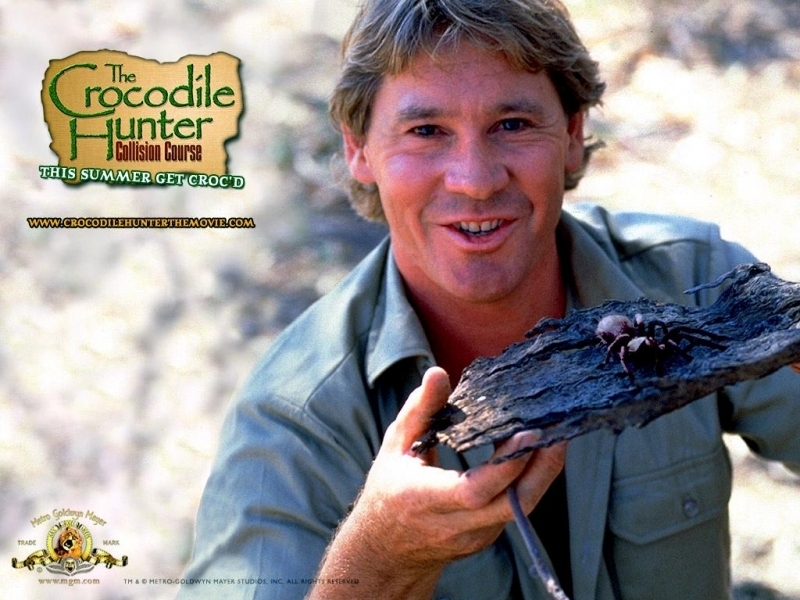 The show was so successful, it turned into a series and the “Crocodile Hunter” was born. 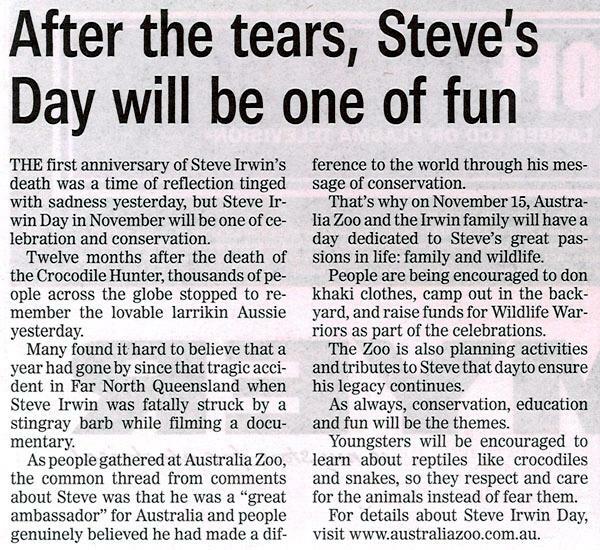 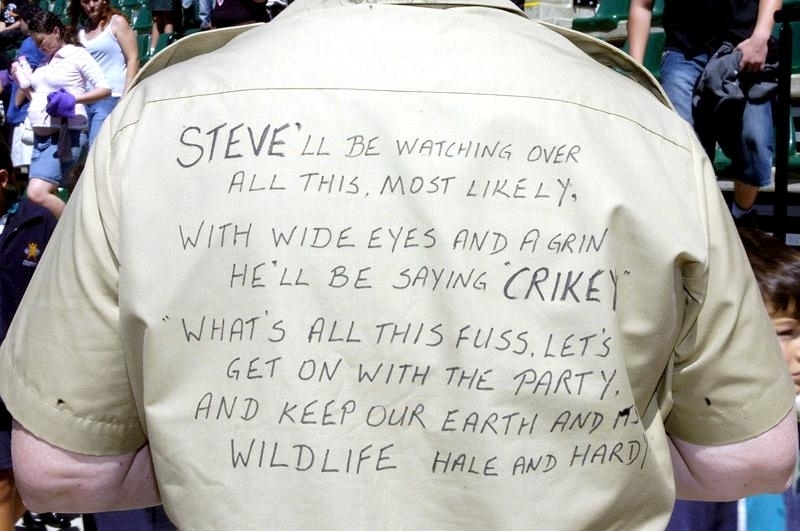 After Steve’s parents retired in the 1992, he worked tirelessly to improve and expand his wildlife park. 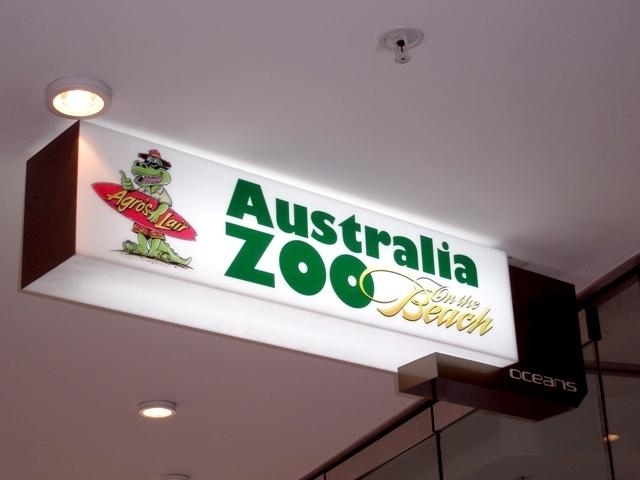 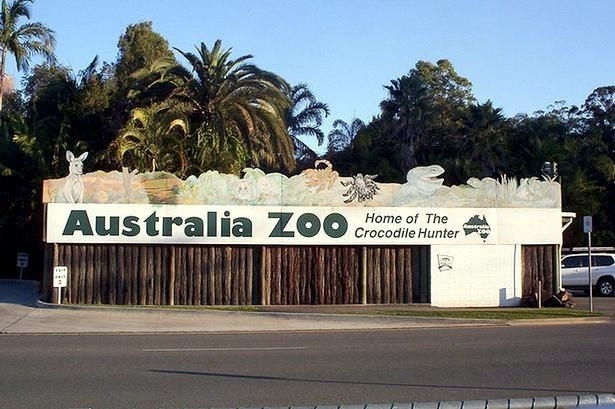 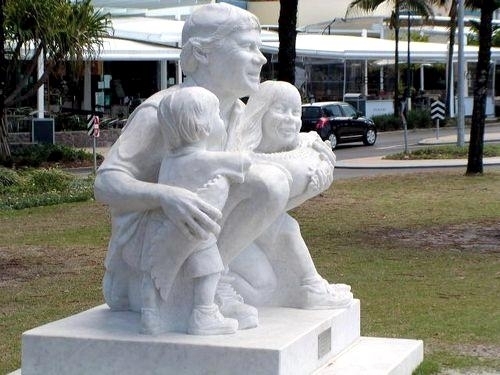 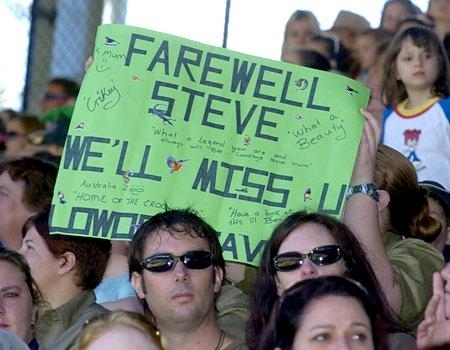 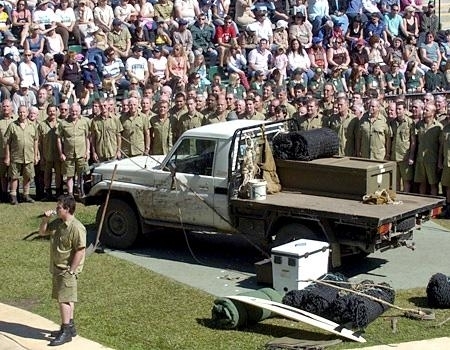 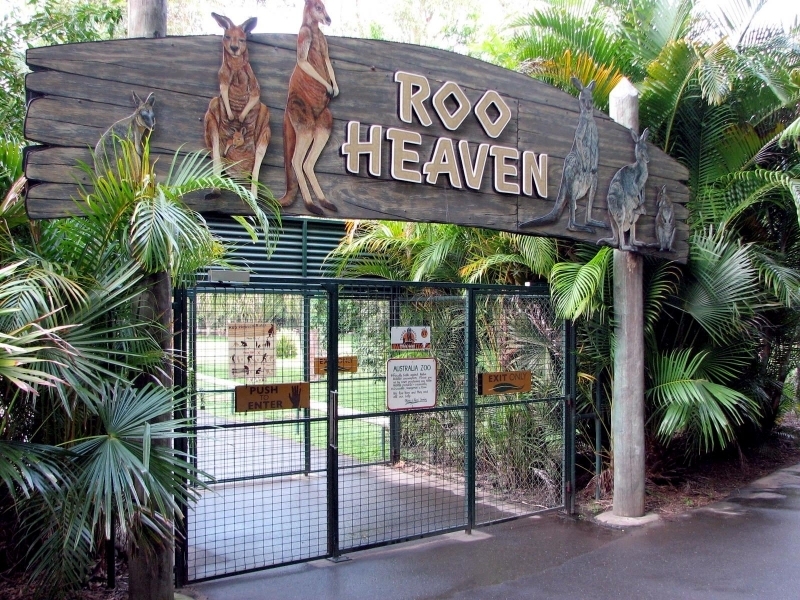 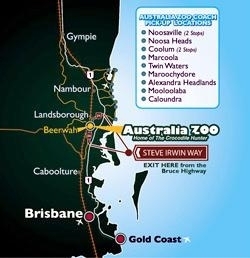 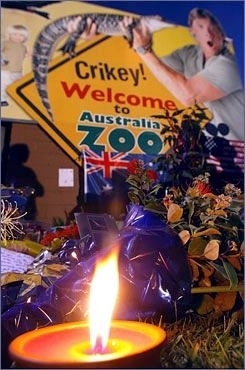 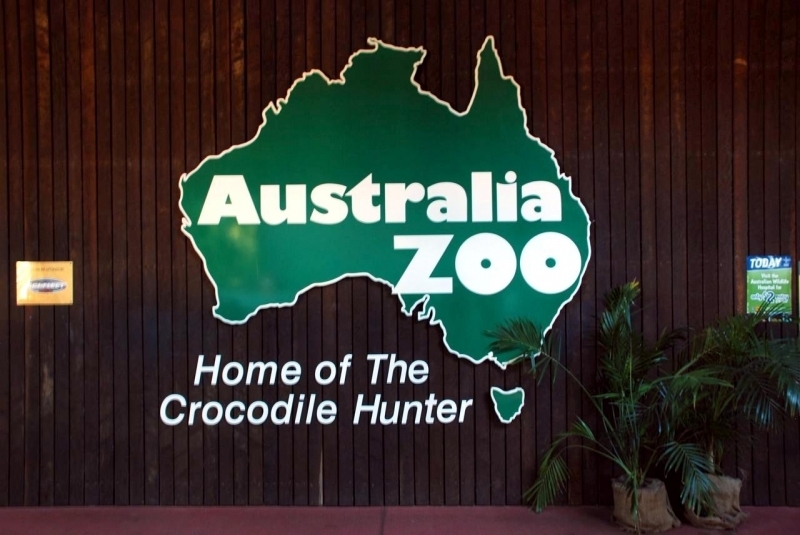 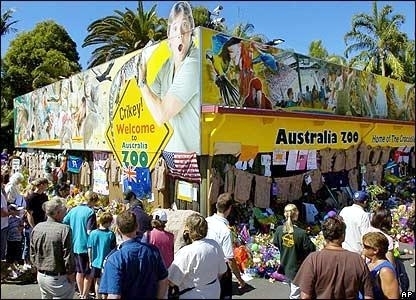 Renaming it the Australia Zoo in 1998, Steve’s vision for the world’s best Zoo was coming to fruition. 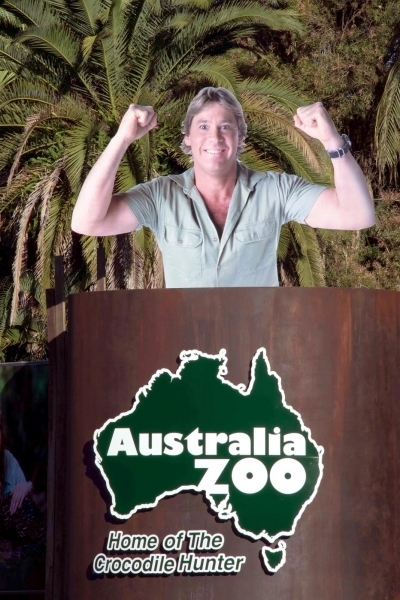 In July 2006, Steve set out his 10-year business plan for his beloved zoo. 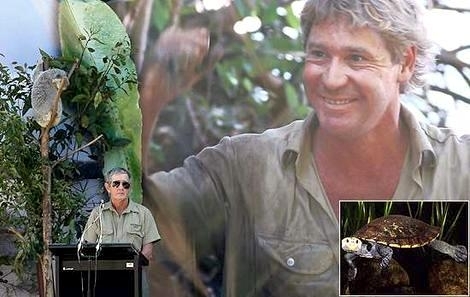 He couldn’t have known he would be gone just 2 months later, but he believed his conservation work would go on. 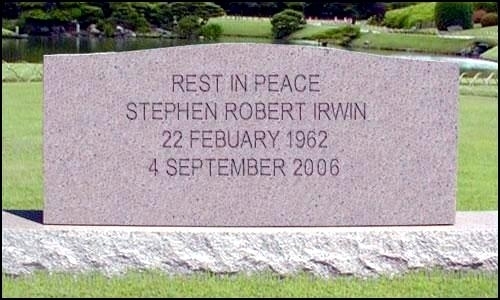 His lovely wife and 2 beautiful children will make sure it does. 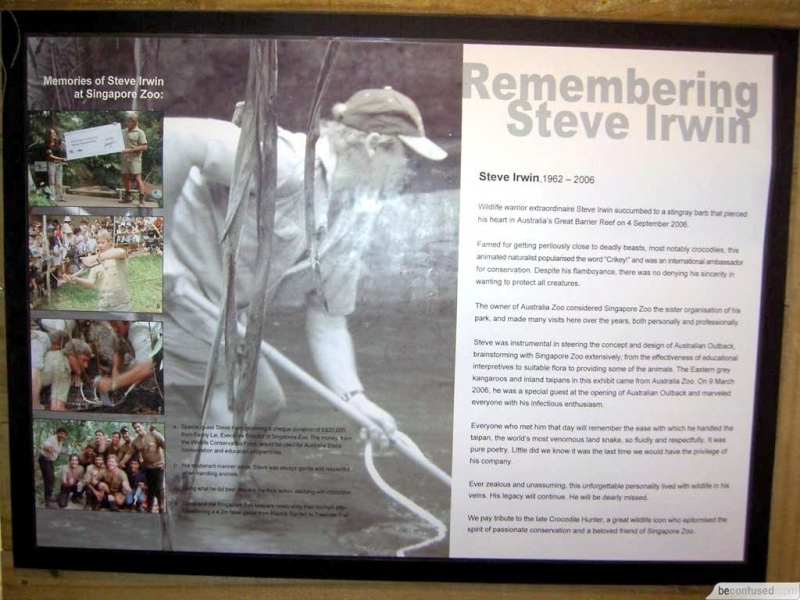 “Didgeridoo” tribute to the memory of Steve Irwin by the Mirrar People, an Australian Aboriginal clan from the Kakadu region in Australia’s northeast Northern Territory. 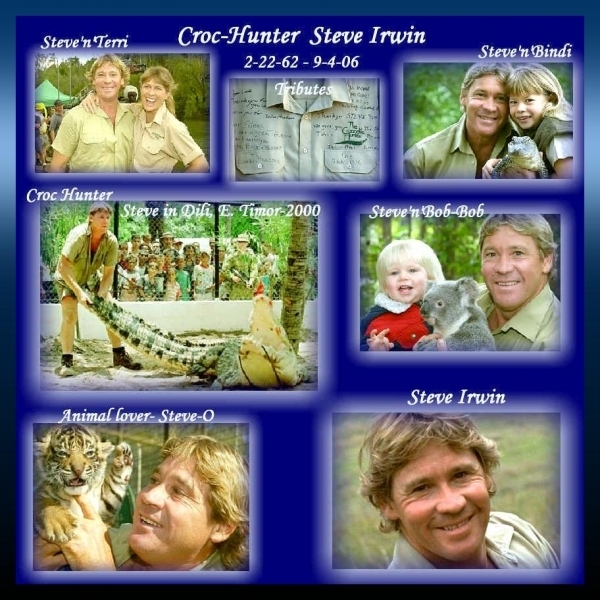 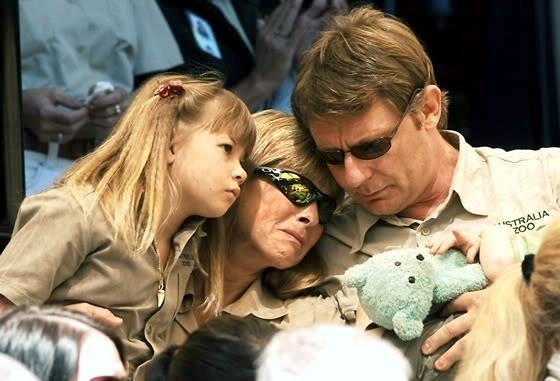 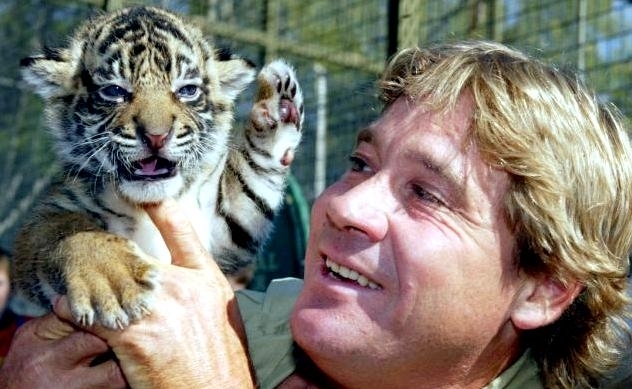 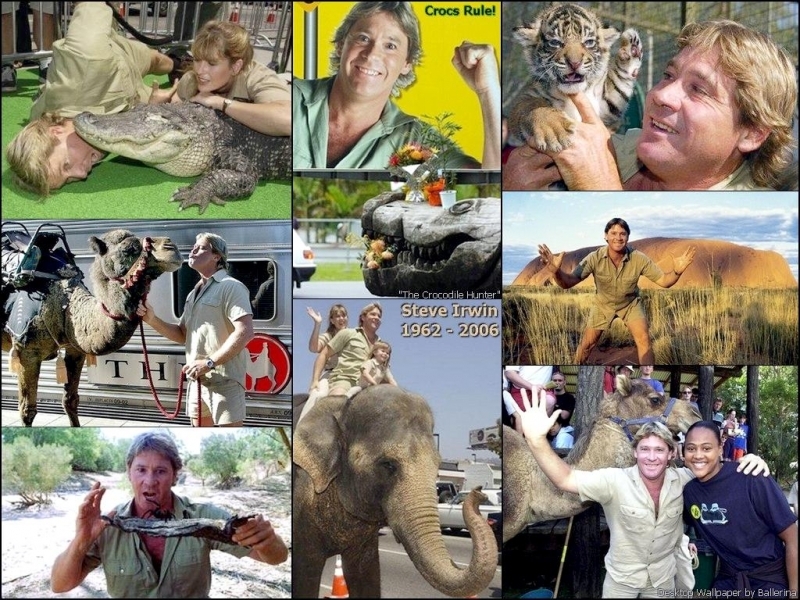 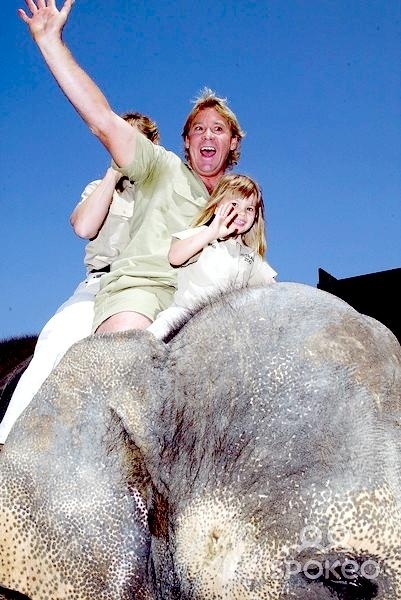 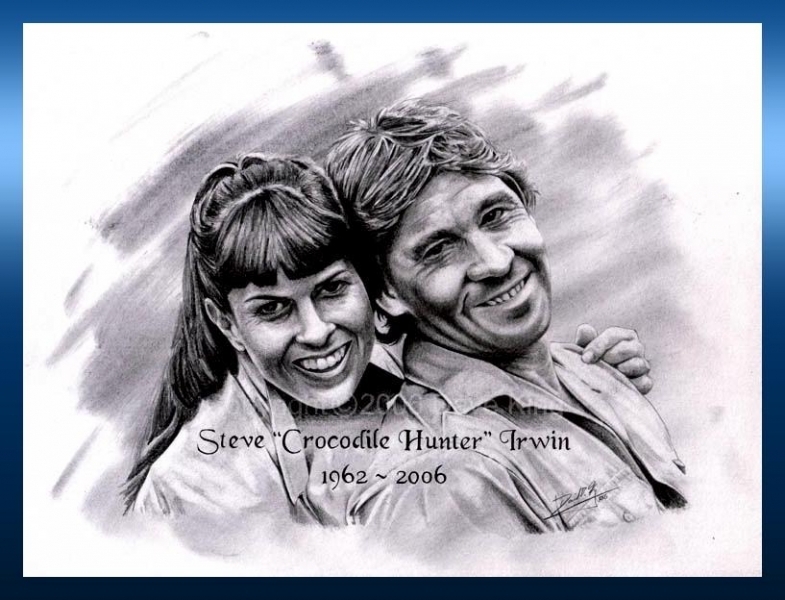 TERRI IS TRULY A WILDLIFE WARRIOR AND CONTINUES STEVE’S LEGACY! 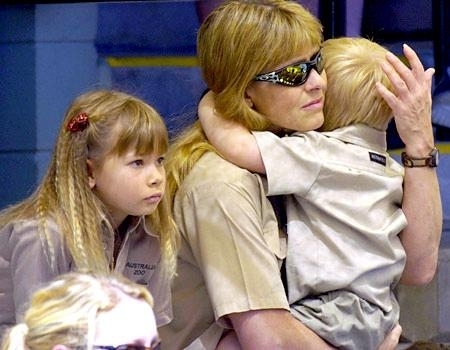 Terri Raines was born in Eugene, Oregon USA on July 20, 1964. 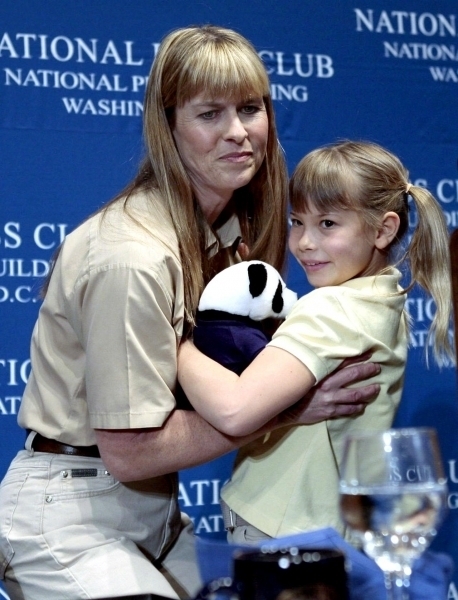 Her father drove heavy-haul trucks and would often bring home wildlife that had been injured on the road. 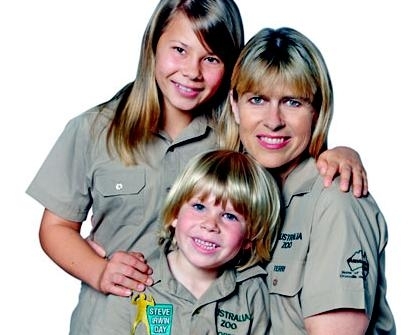 This instilled in Terri a love for wildlife and a desire to help animals from a very early age. 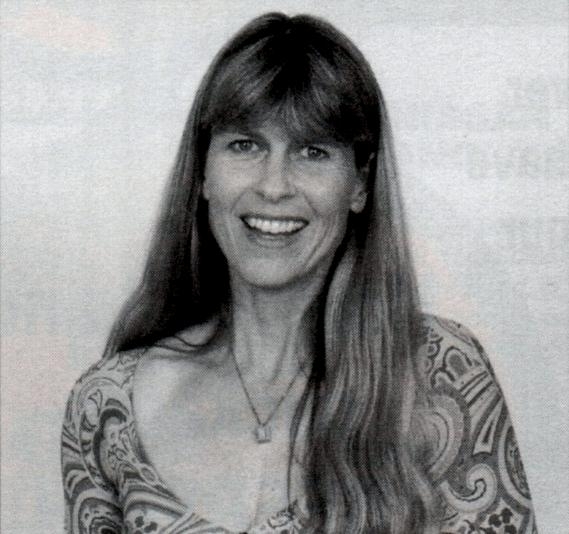 Theresa Penelope Irwin spent her childhood caring for and riding horses and spent her summers exploring the wilderness area in north-east Oregon on horseback. 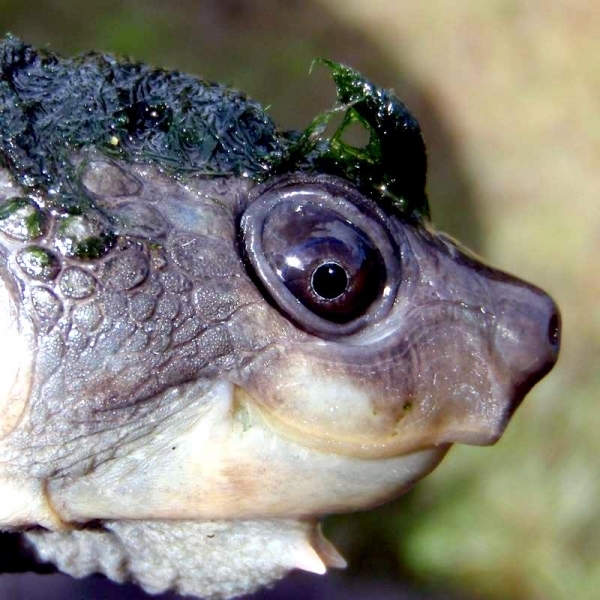 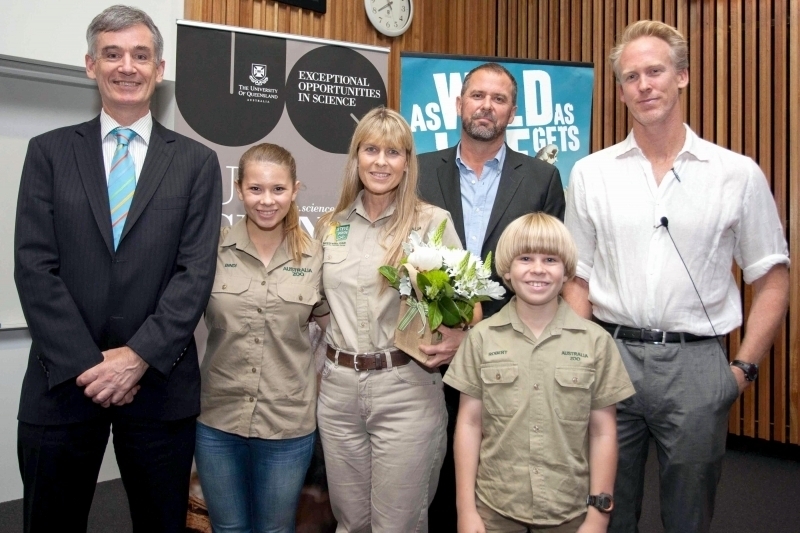 This further convinced Terri of the need to protect wildlife and conserve wild places. 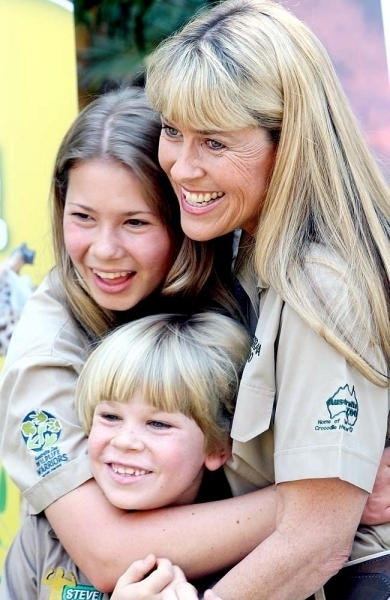 At 22, Terri was running the family business, working part-time at an emergency veterinary hospital and operating a wildlife rehabilitation organization called “Cougar Country”, rehabilitating and releasing predatory mammals such as cougars, bears and bobcats. 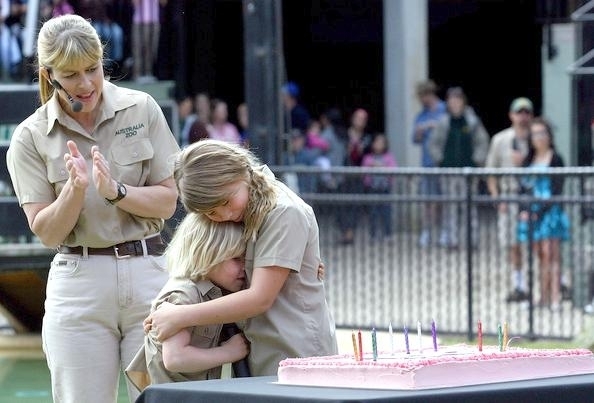 It was not long before she was caring for more than 300 animals a year. 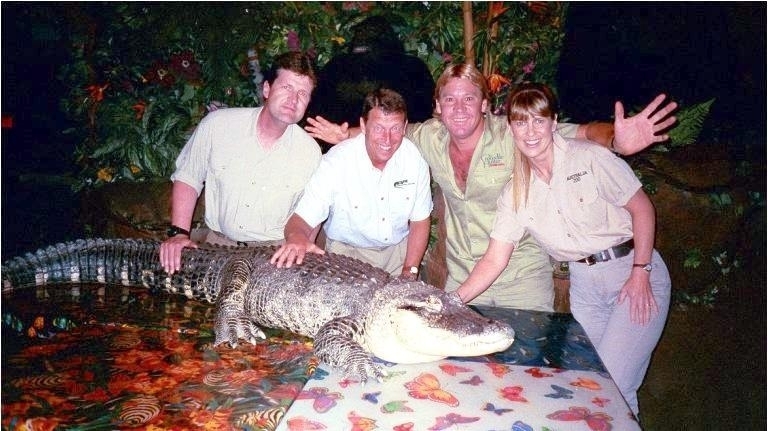 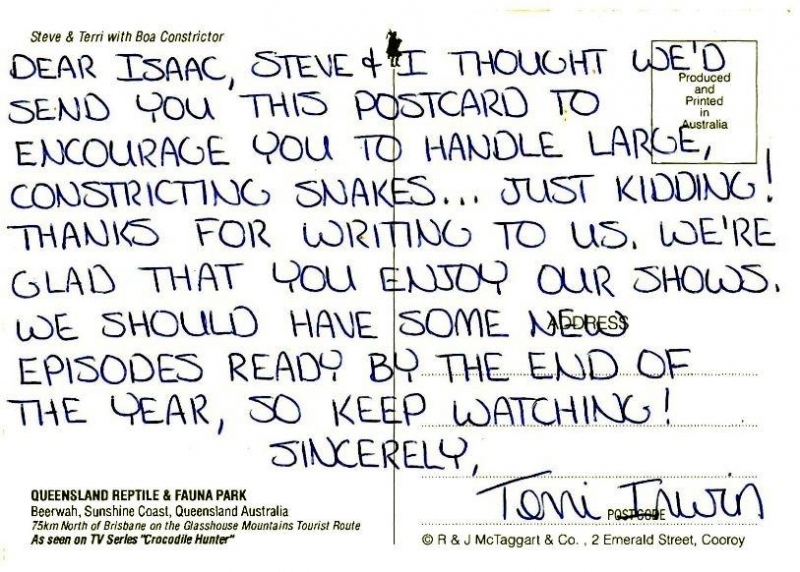 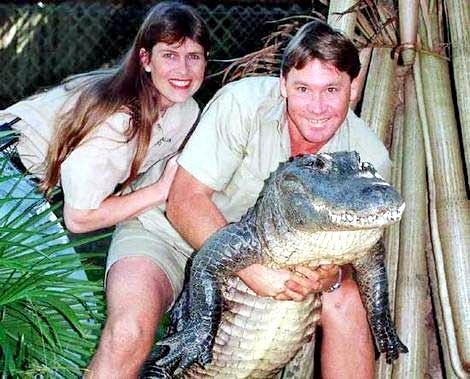 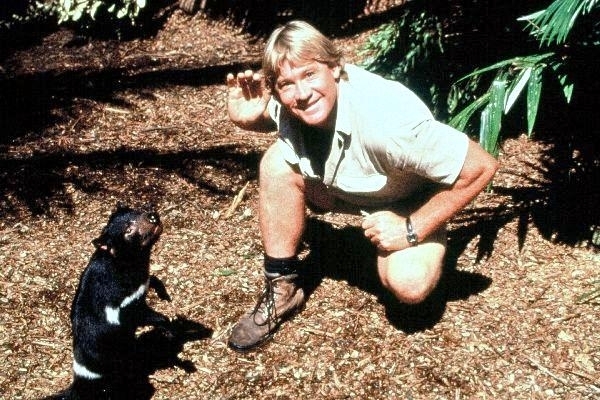 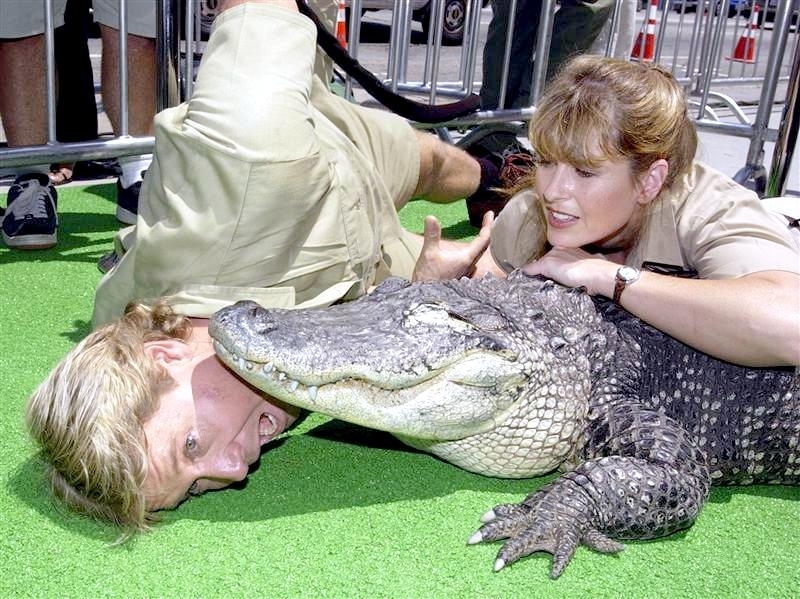 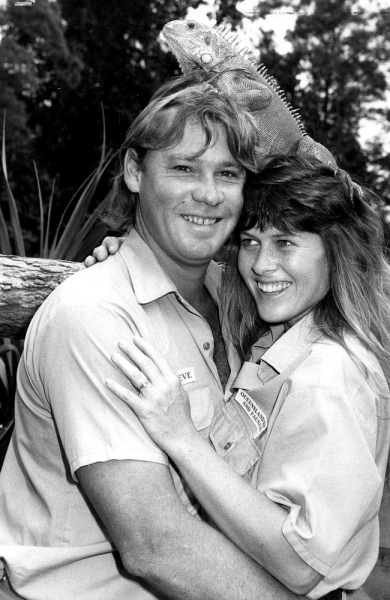 In 1991 during a holiday to Australia, Terri visited the Queensland Reptile and Fauna Park. 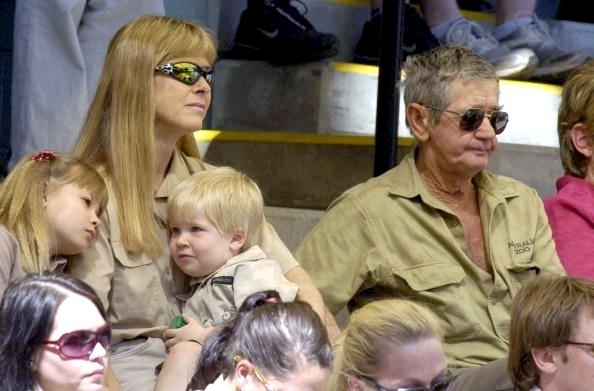 She was captivated by the enthusiastic man in the khakis talking so passionately about crocodiles and introduced herself, realizing they both had in common their passion for wildlife & conservation. 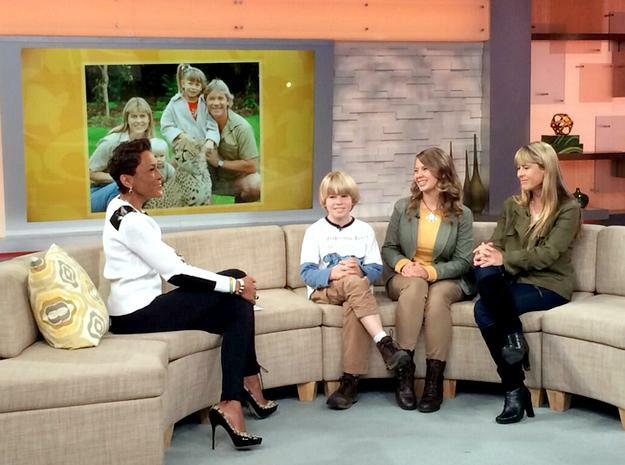 This chance encounter would change their lives forever. 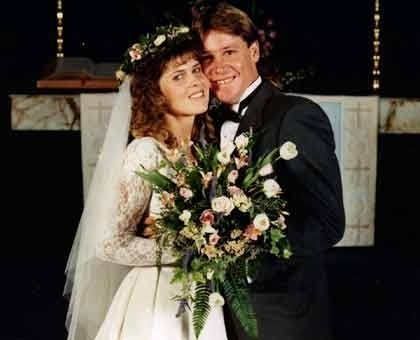 Steve & Terri married on June 4, 1992 in Eugene, OR. 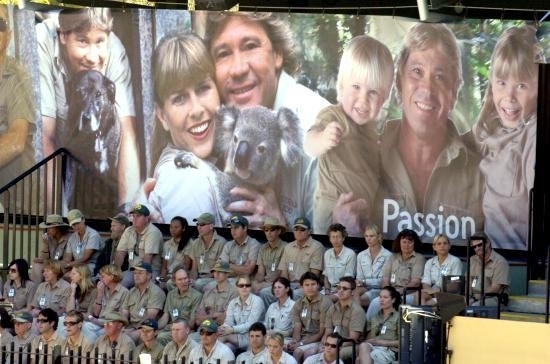 The wedding was a huge occasion with all of Terri’s friends, family and colleagues realizing they would be saying goodbye as she started her life in Australia with Steve. 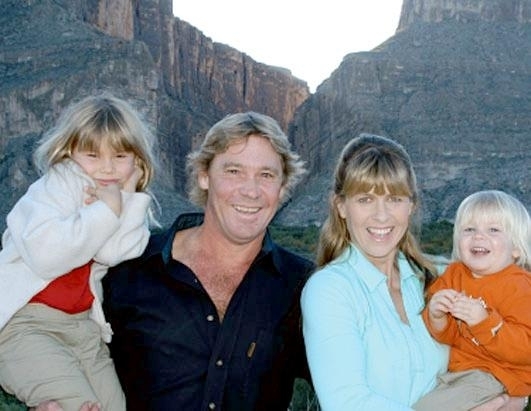 They immediately began their life together in Australia with wildlife documentary filming, an amazing zoo and later two incredible children and a stack of adventures. 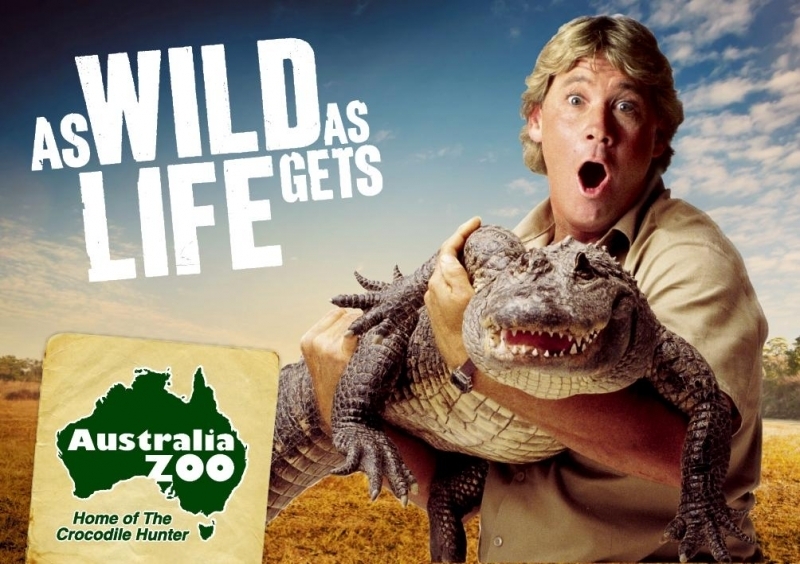 Steve & Terri’s wildlife documentaries have brought Australia Zoo to the world stage and have attracted visitors from across the world to the Sunshine Coast. 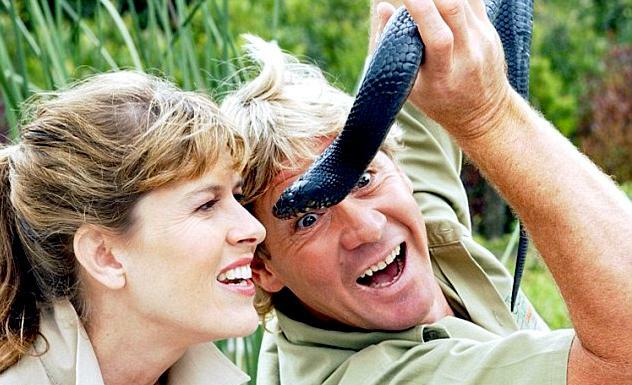 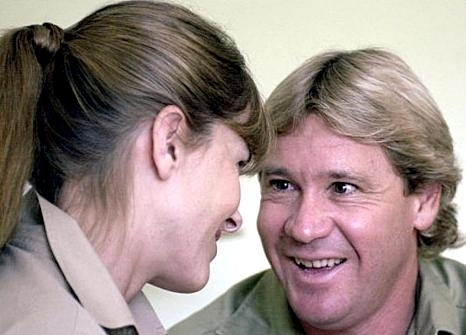 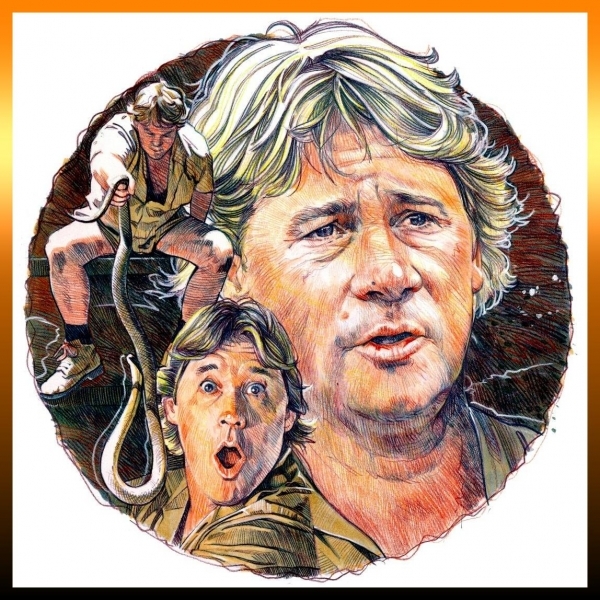 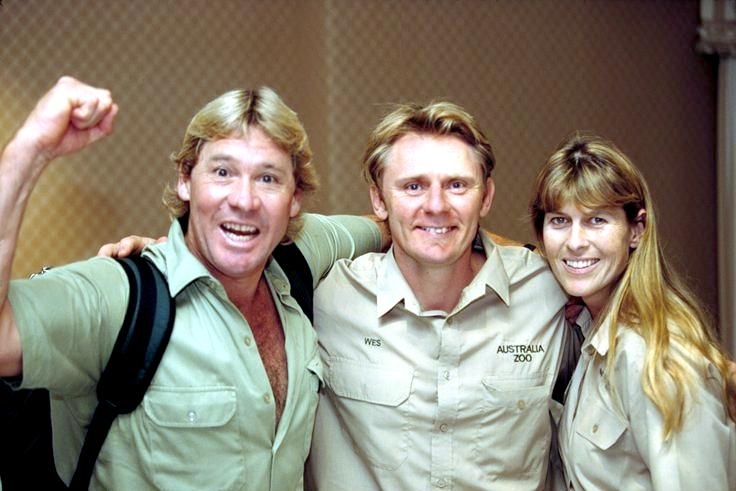 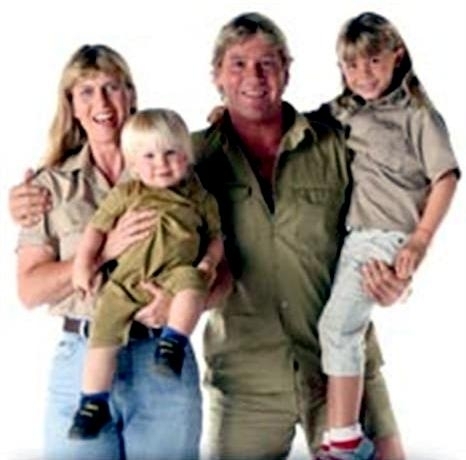 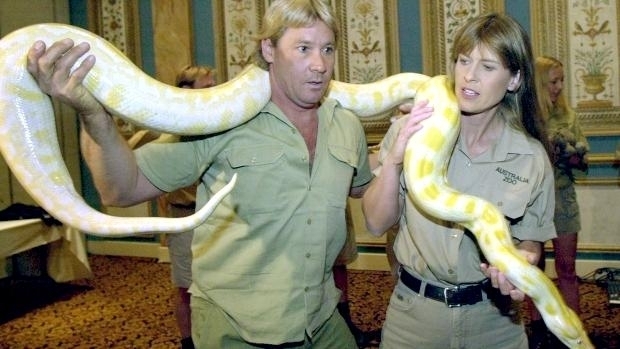 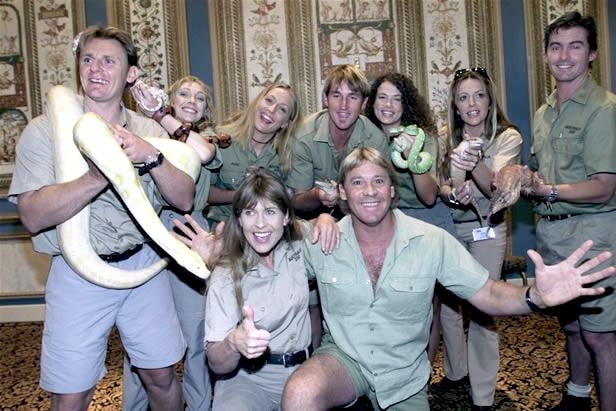 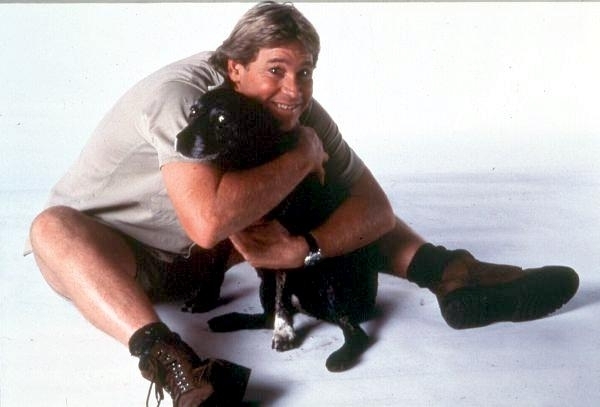 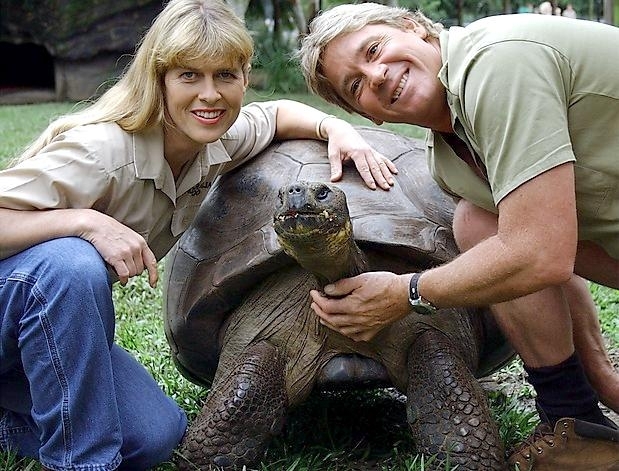 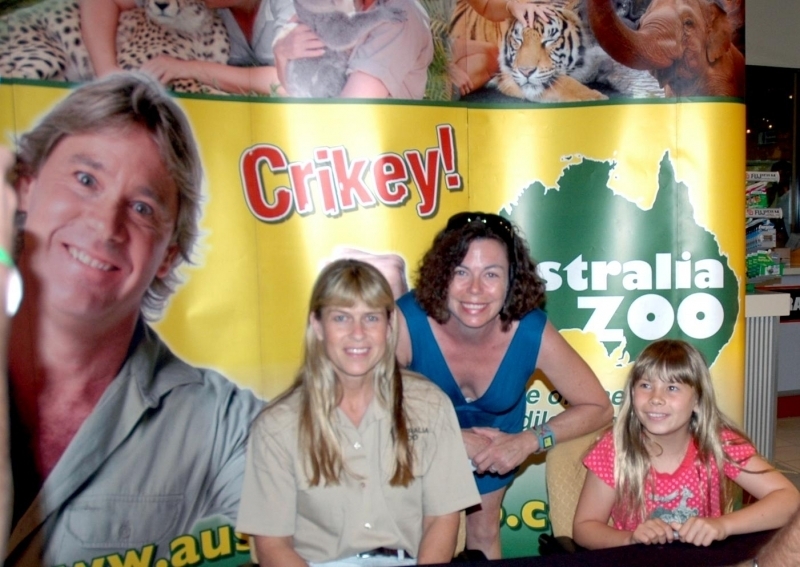 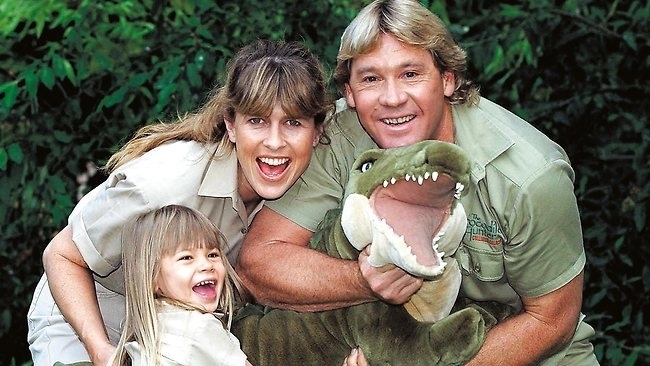 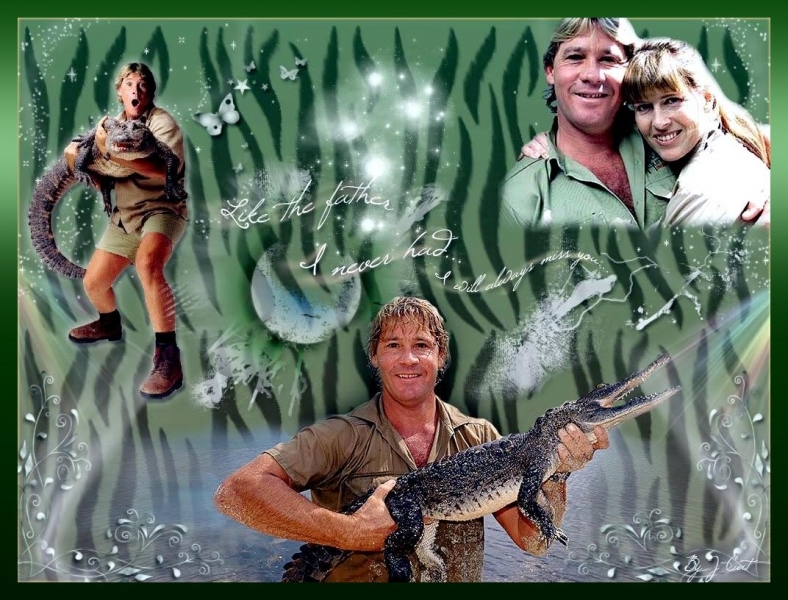 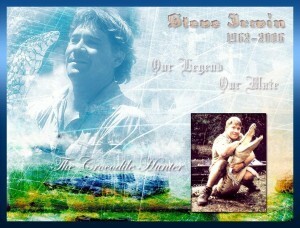 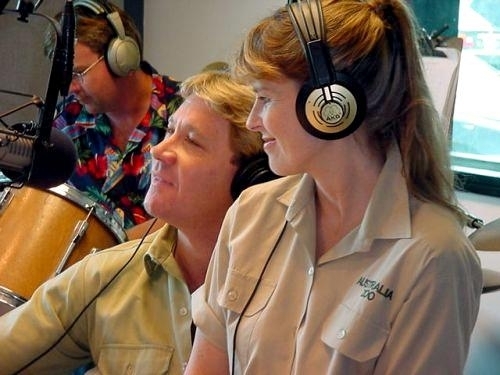 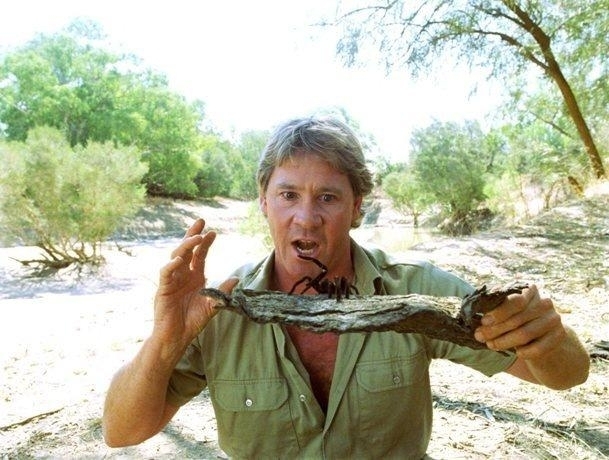 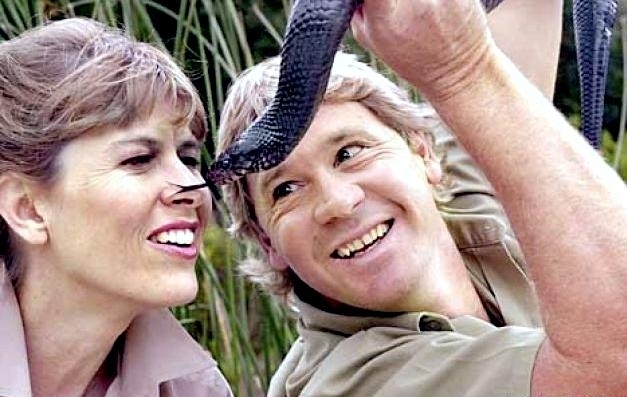 Steve & Terri have filmed over 300 episodes of The Crocodile Hunter, Croc Diaries, Croc Files, New Breed Vets, Ghosts of War and Bindi: The Jungle Girl and starred in the blockbuster movie The Crocodile Hunter: Collision Course. 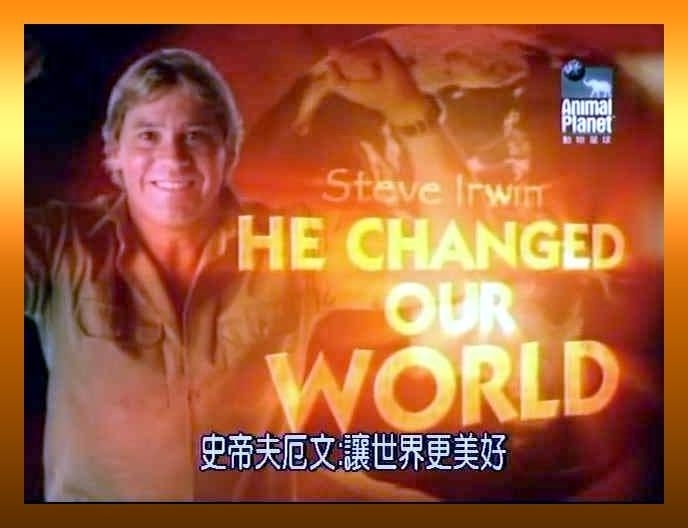 These programs are now seen by 142 countries and 500 million viewers worldwide. 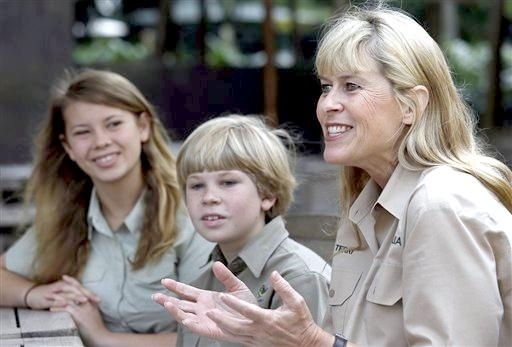 In 2006, Terri was awarded an Honorary Member in the General Division of the Order of Australia for her outstanding dedication to wildlife conservation and the tourism industry. 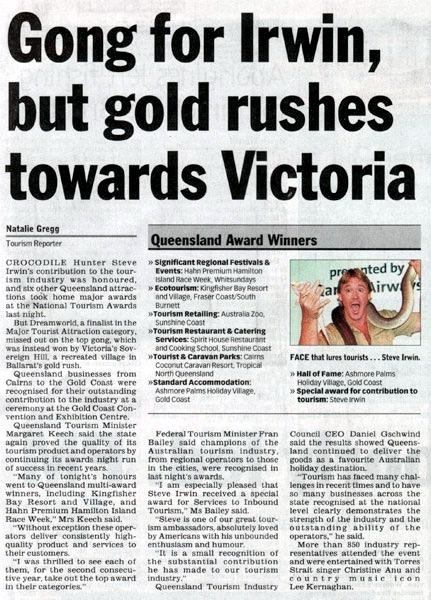 She was also the winner of the 2006 Ernst & Young Northern Region Social Entrepreneur of the Year, 2007 Queensland Telstra Business Women’s Award and the 2011 Marie Watson-Blake Award for Outstanding Contribution by an Individual at the Queensland Tourism Awards. 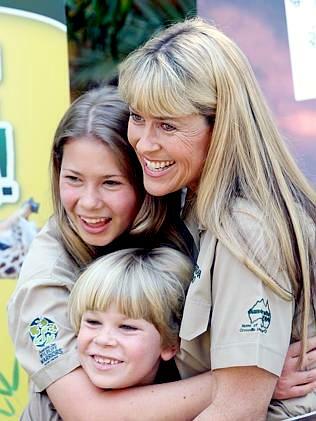 Becoming an Australian citizen in 2009, Terri continues to be a passionate wildlife spokesperson and conservation icon around the world. 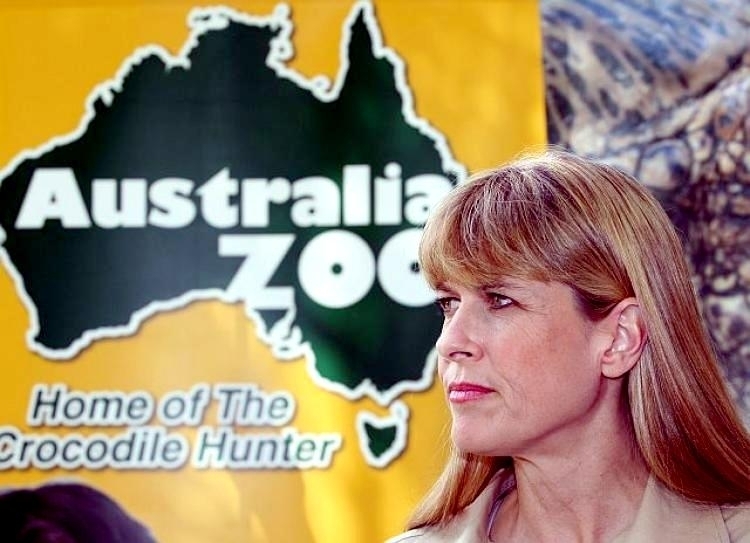 She actively speaks out and supports conservation issues, including the Steve Irwin Wildlife Reserve, a 135,000-hectare property in Cape York dedicated to Steve, threatened by strip mining for bauxite. 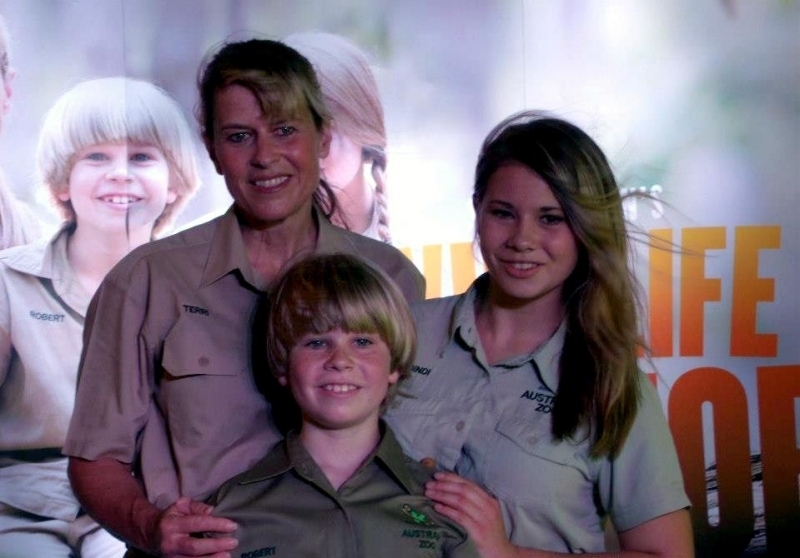 Terri is determined to dedicate the rest of her life to Bindi, Robert and her husband’s passion for conservation. 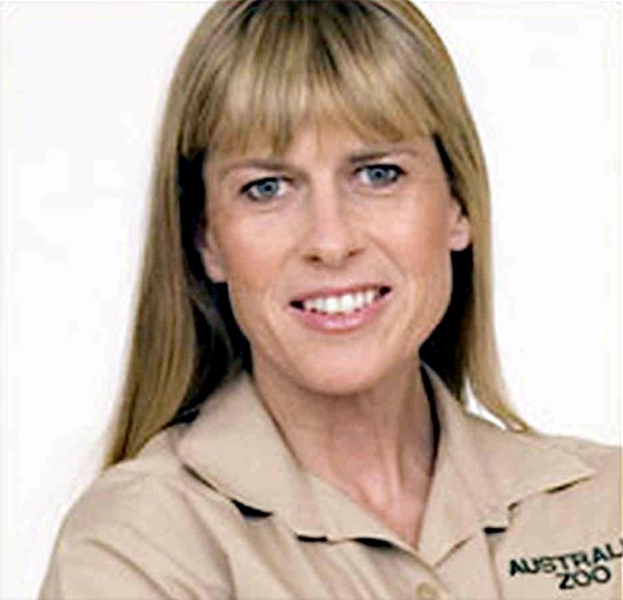 Like Steve, Terri is truly a Wildlife Warrior and will continue to work with the Australia Zoo family in managing the 100 acre, world-class, award-winning facility which is home to over 1,200 animals. 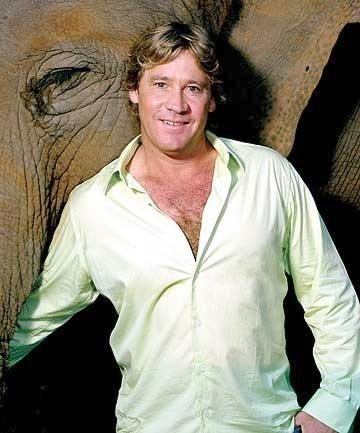 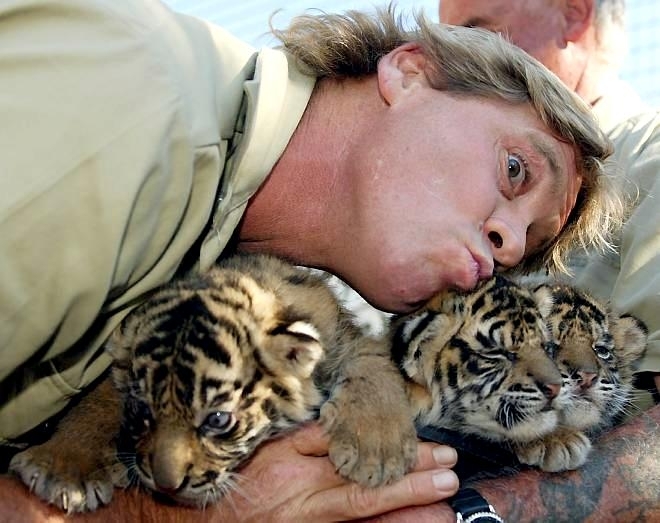 ENTHUSIASTIC WILDLIFE CONSERVATIONIST AND AWARD-WINNING INTERNATIONAL CELEBRITY! 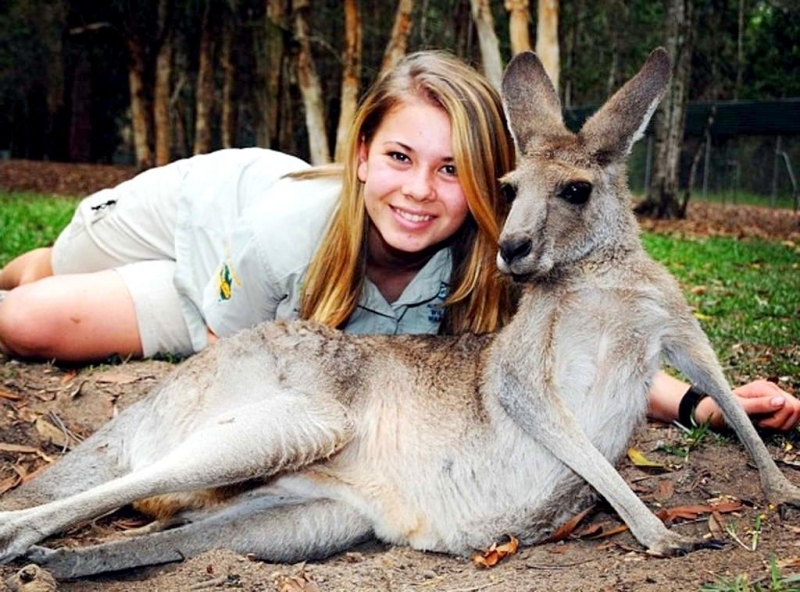 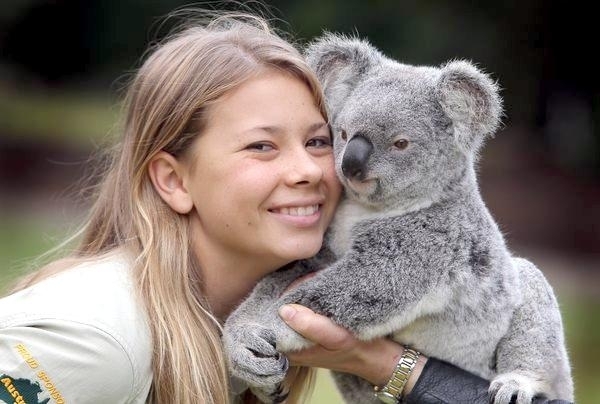 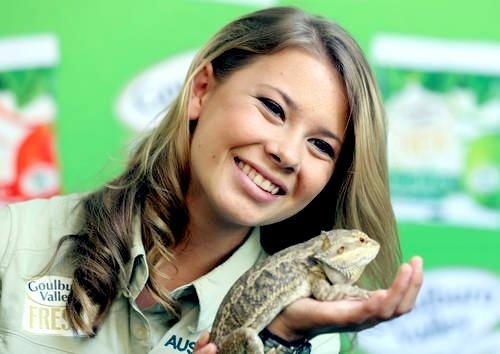 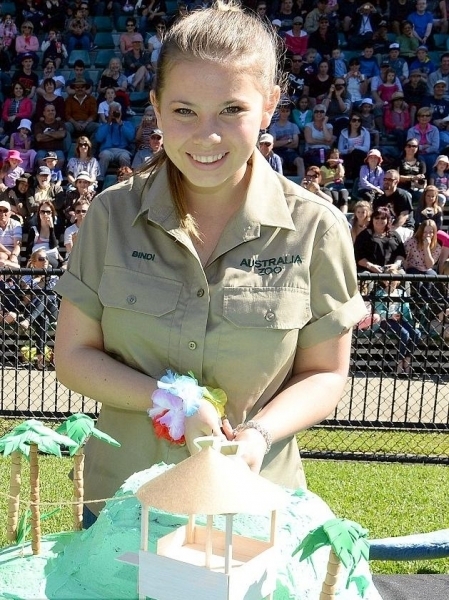 Bindi Sue Irwin is already an international award-winning celebrity who has inherited her father’s passion for wildlife and conservation. 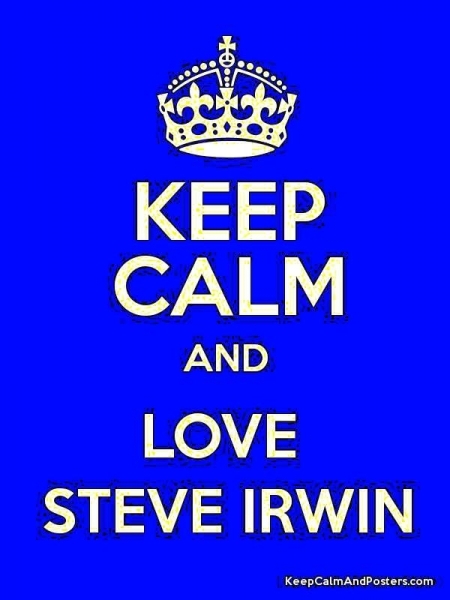 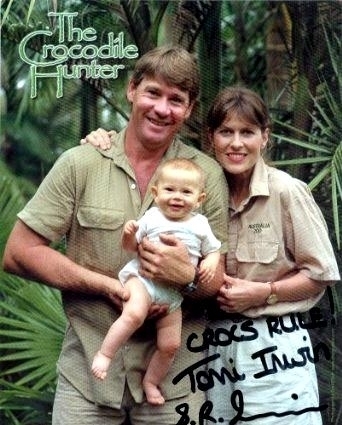 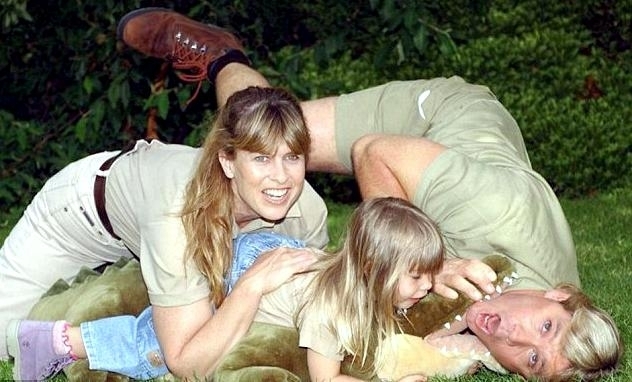 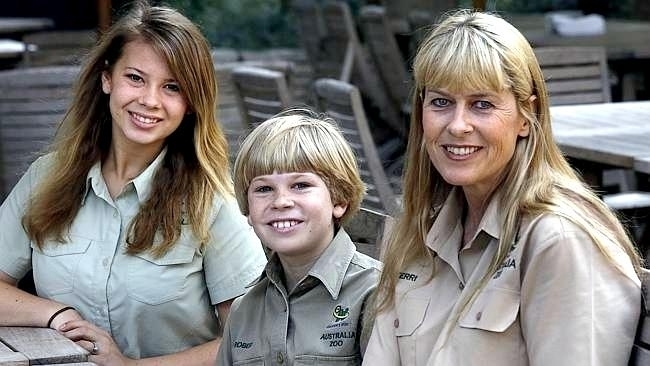 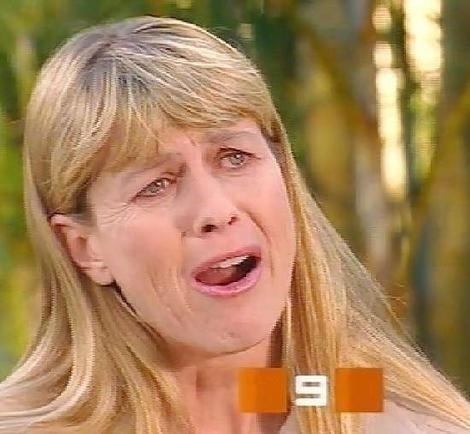 Born to enthusiastic wildlife conservationists Steve & Terri Irwin, Bindi was quite literally born on television! 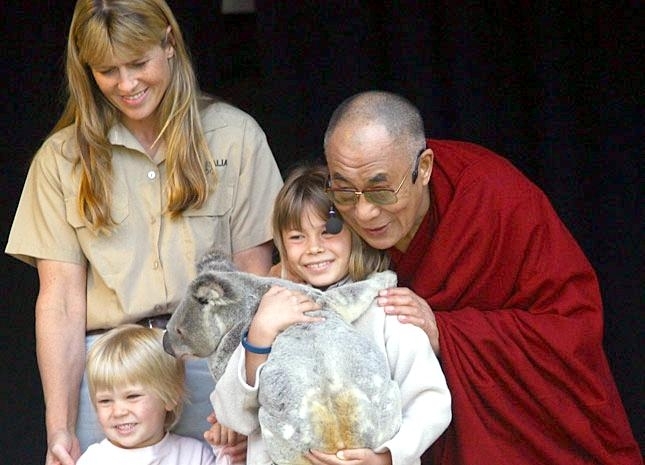 By the age of 9, Bindi had appeared on numerous American chat-shows including The Ellen DeGeneres Show, The Late Show with David Letterman, Oprah and Larry King Live. 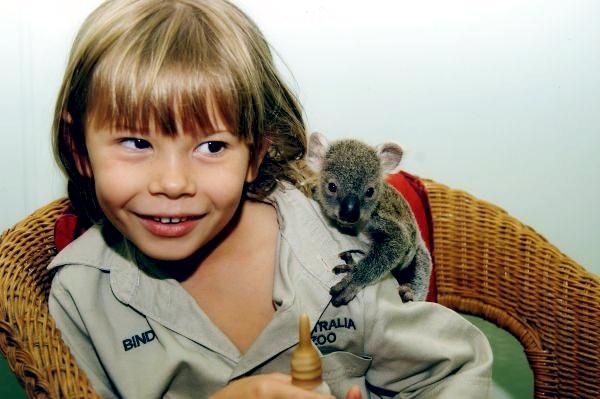 In 2007, Bindi launched her clothing range, Bindi Wear International in Las Vegas and that same year, she was awarded 2 Nickelodeon Kids Choice Awards, Fave Aussie and Biggest Greenie. 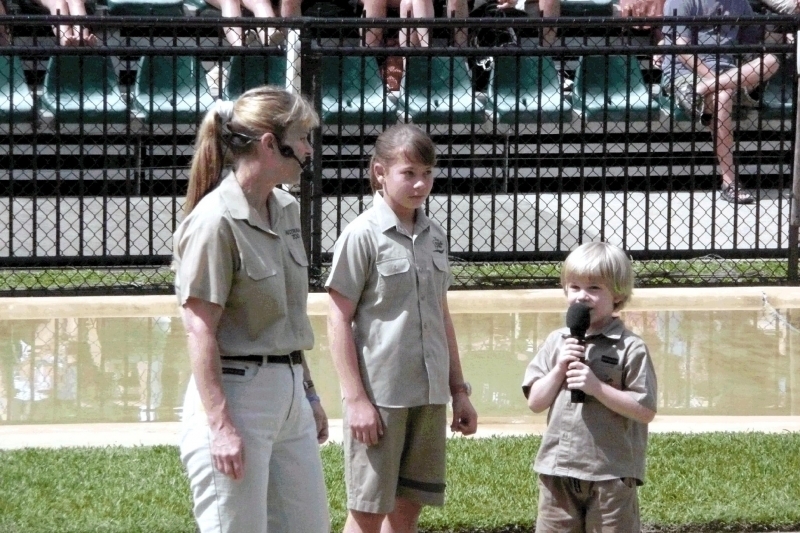 Bindi loves to sing and dance, particularly about wildlife and regularly performs songs from her popular and award-winning DVDs at Australia Zoo. 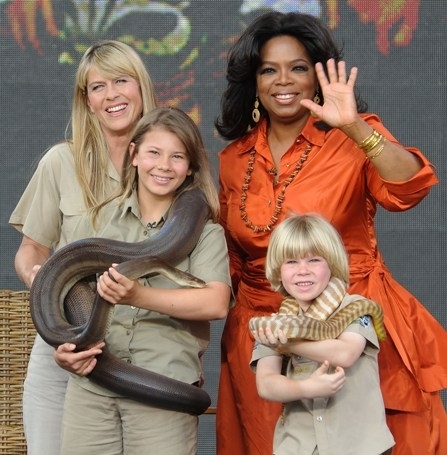 Bindi has also performed at special events such as ‘G’Day USA’ at the Music Center in LA and the New York City Center in 2007. 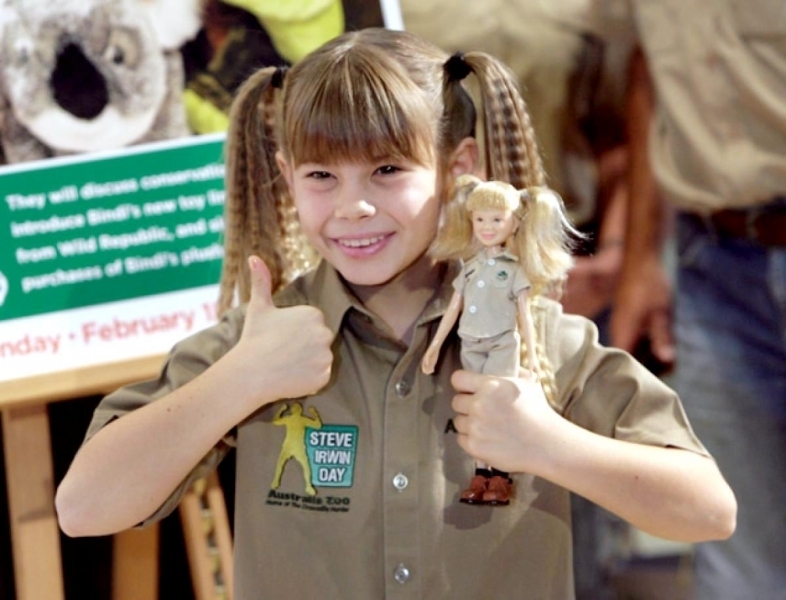 Also in 2007, Bindi launched her very own TV show Bindi: The Jungle Girl, which won an Emmy in 2008 and was nominated for an Emmy again in 2009. 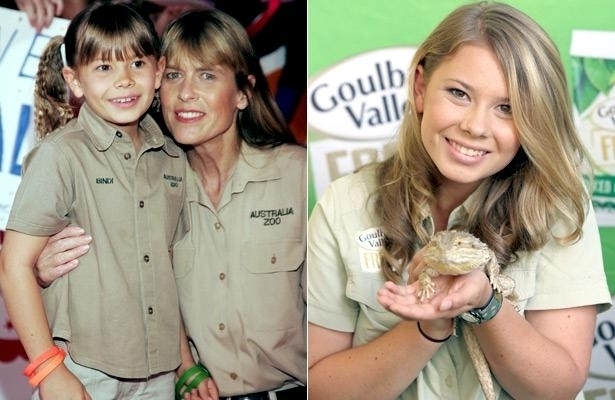 In 2008, Bindi won a Logie for ‘Most popular new female talent’ and in 2009 she was nominated for an ARIA (Australian Record Industry Award). 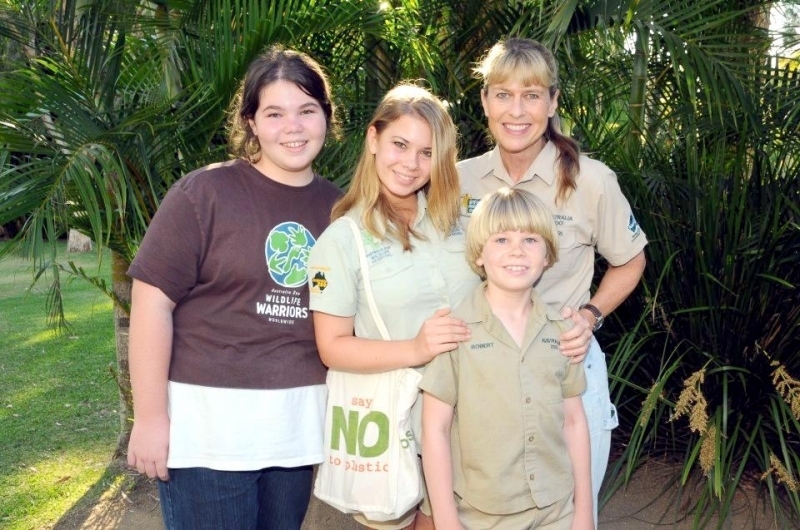 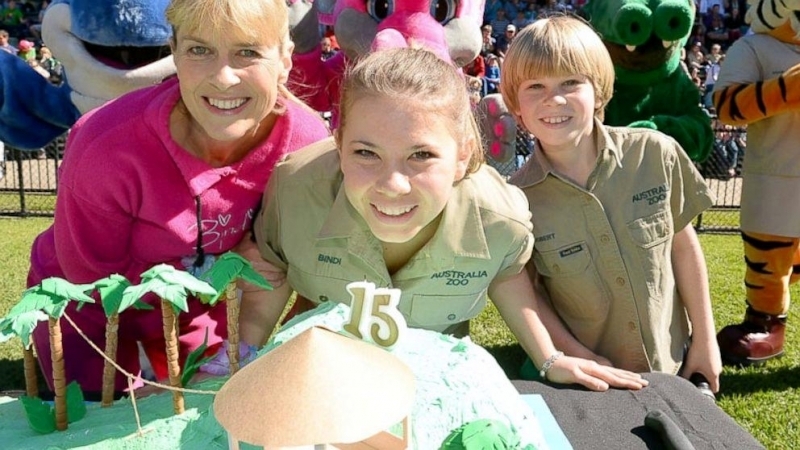 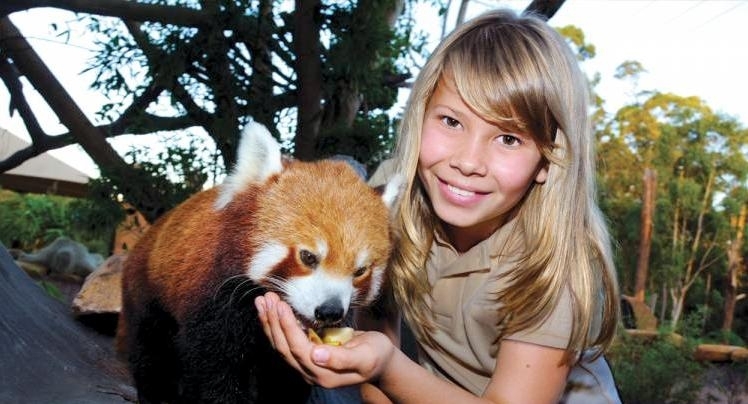 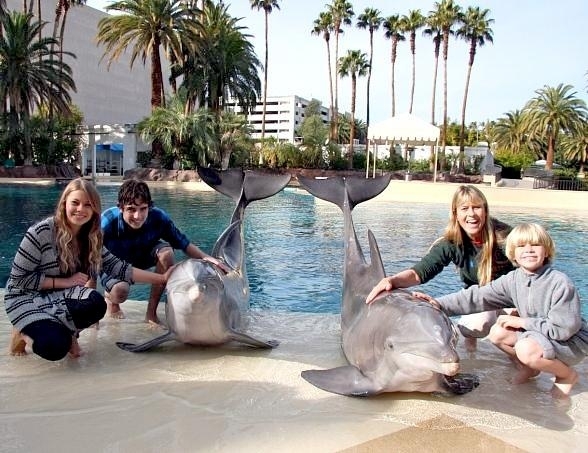 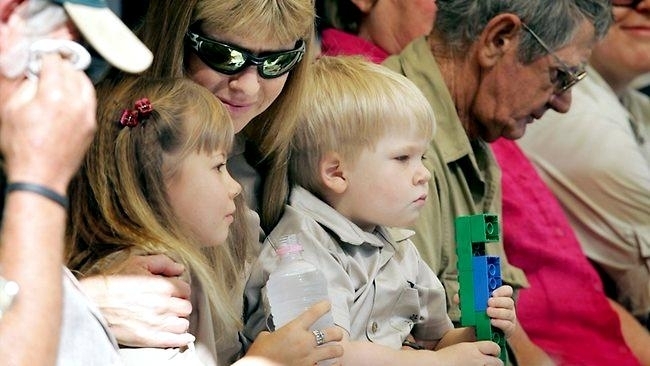 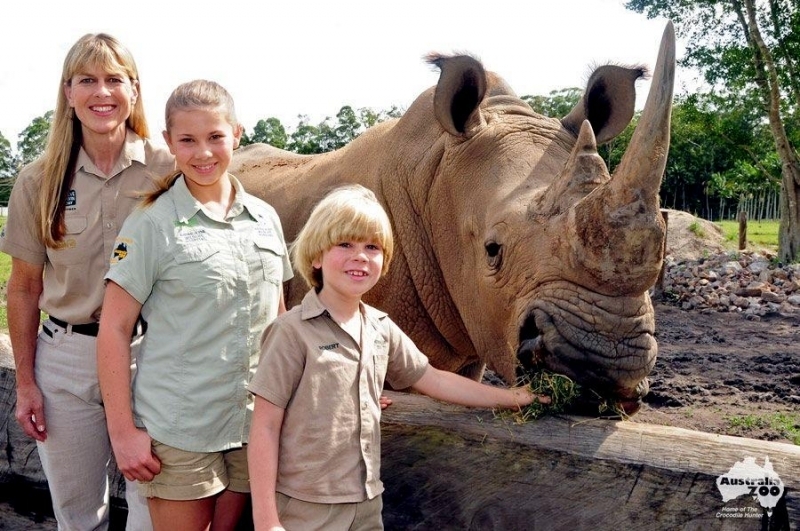 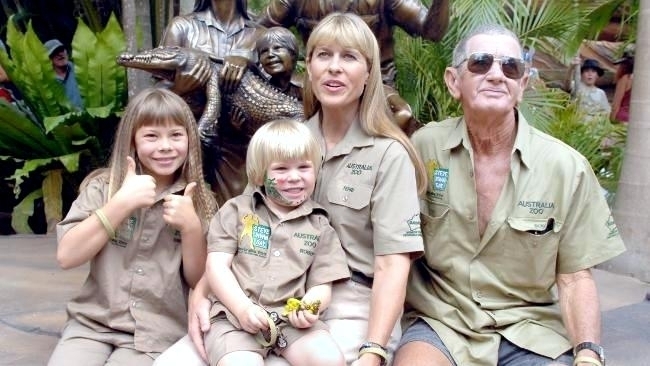 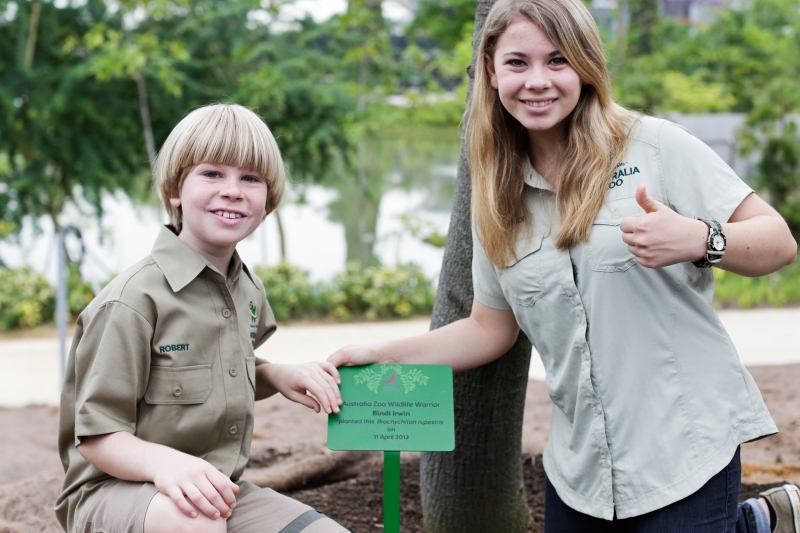 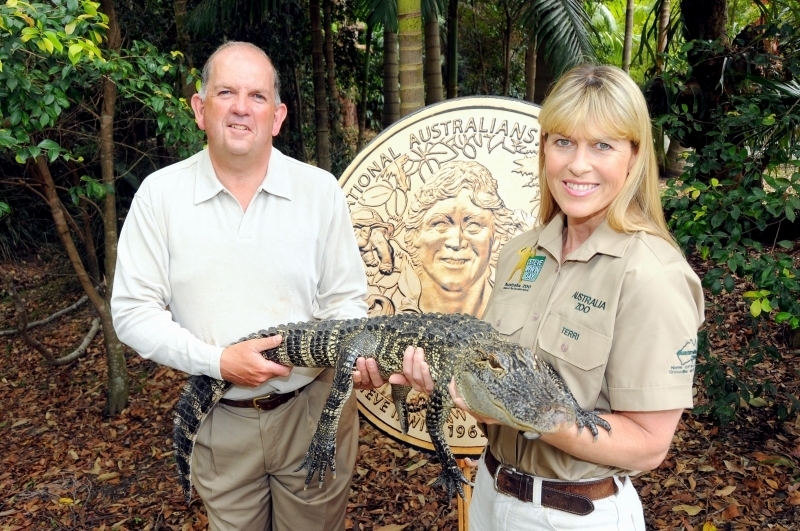 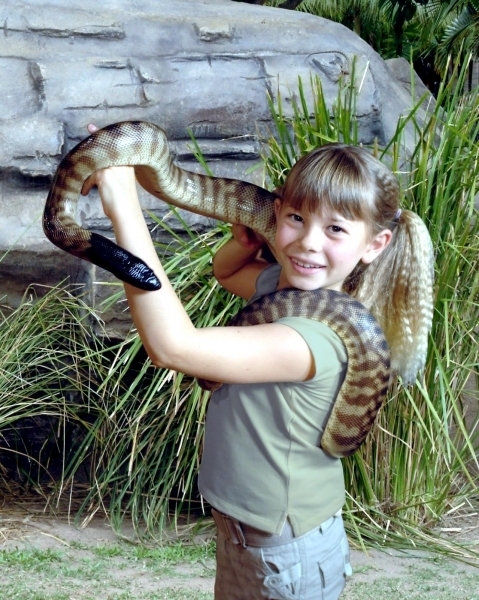 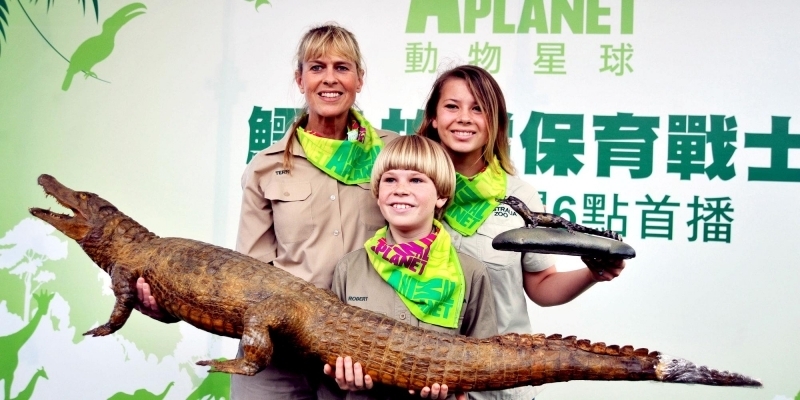 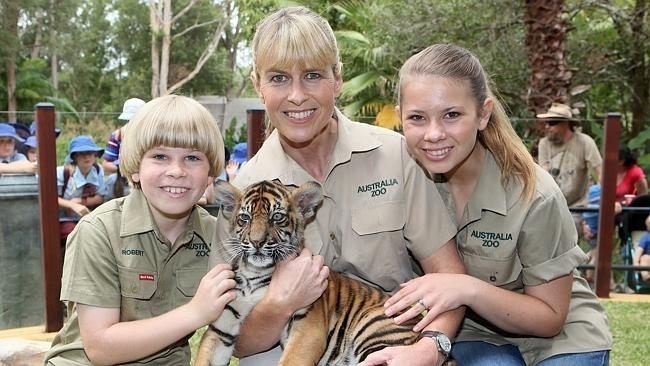 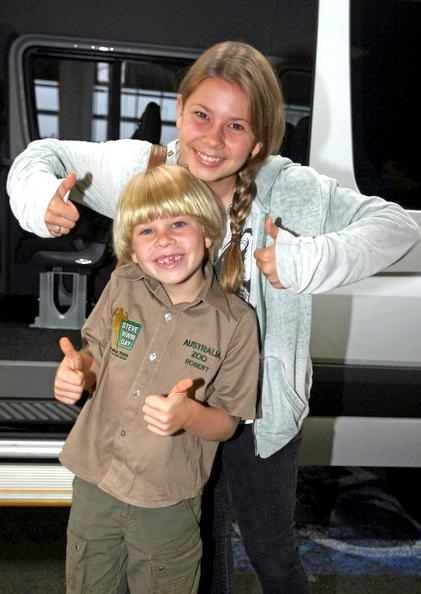 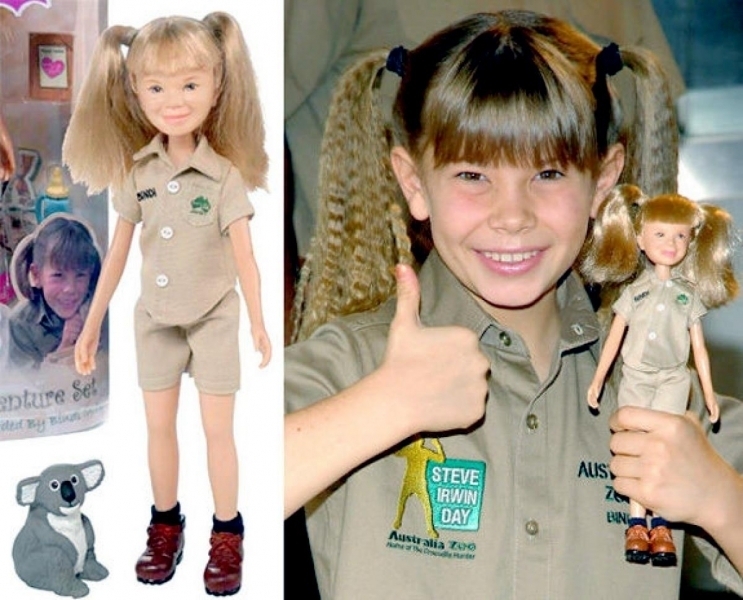 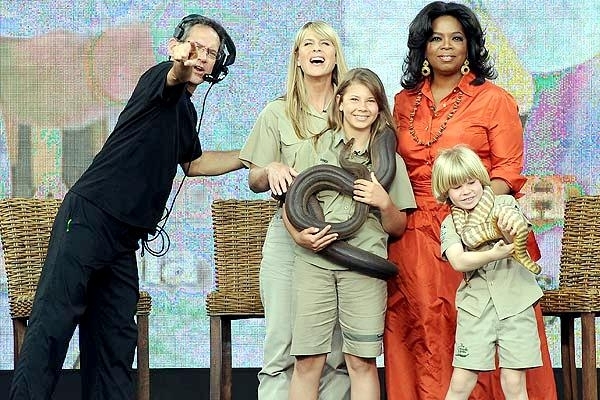 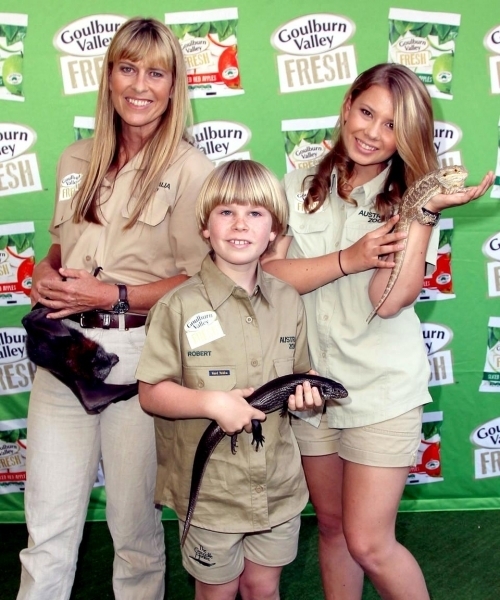 Both Bindi & Robert Irwin were awarded the Nickelodeon Kids Choice Award for Biggest Greenies in 2009. 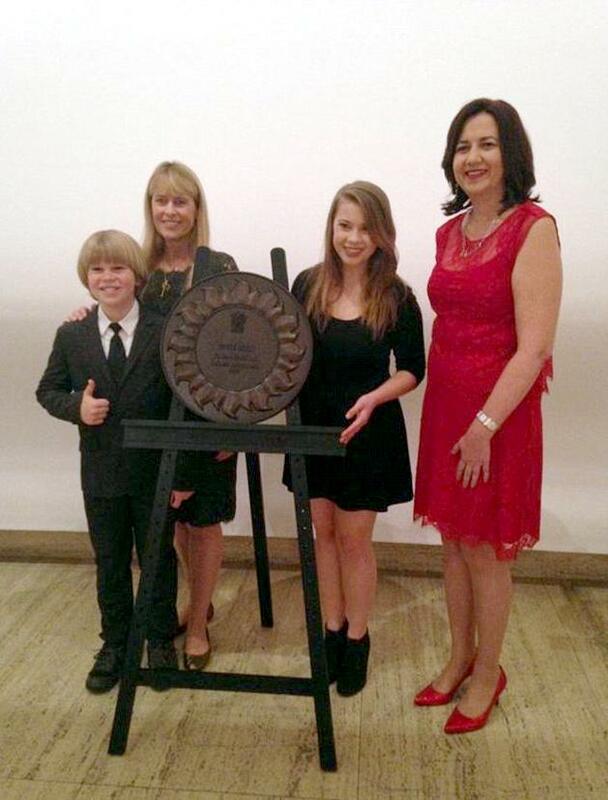 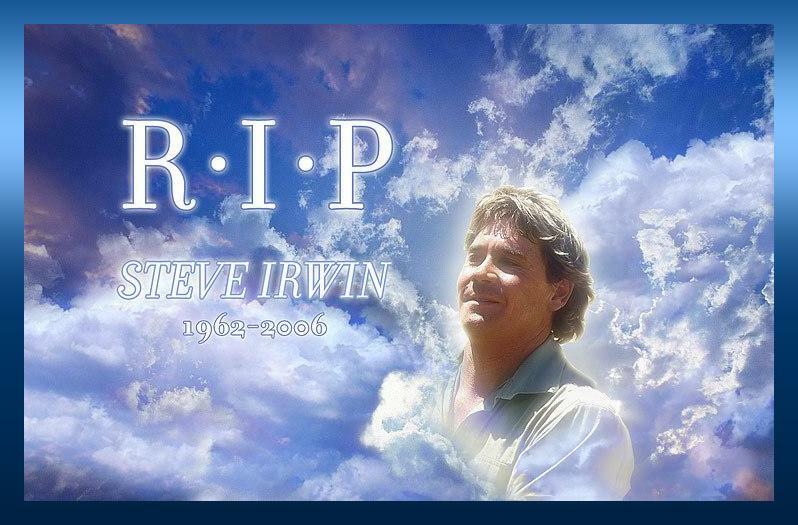 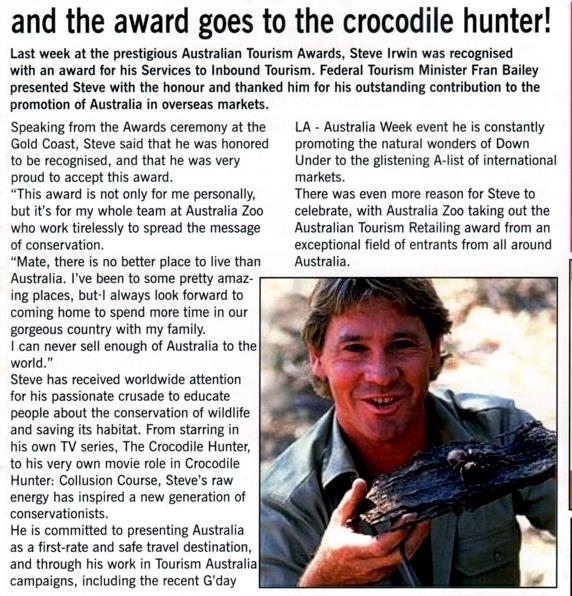 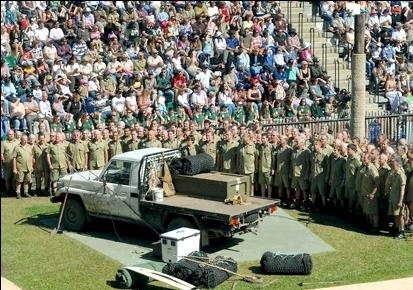 They accepted this award together and dedicated it to their father Steve and the Steve Irwin Wildlife Reserve. 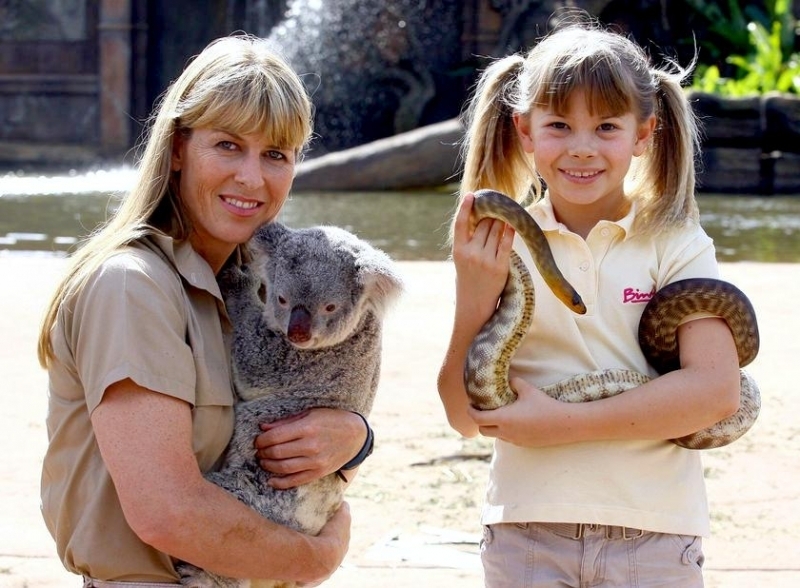 Bindi has also co-created a range of books called Bindi Wildlife Adventures which have been launched in Australia, New Zealand in 2010 and the US in 2011. 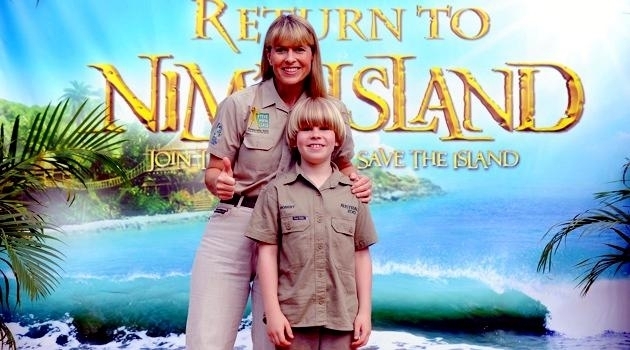 Released early 2010, Bindi played the lead-role in her first full-length feature film, Free Willy: Escape from Pirate’s Cove and starred in her first cinema release film Return to Nim’s Island in 2013! 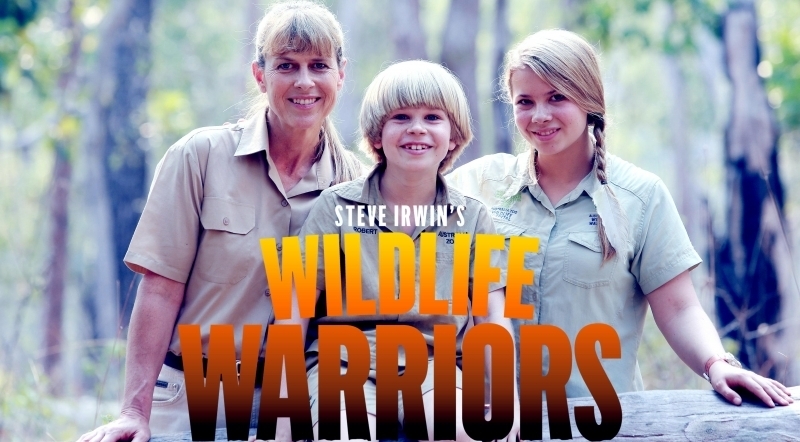 Bindi and Robert are both so passionate about wildlife – Steve shines through in them both. 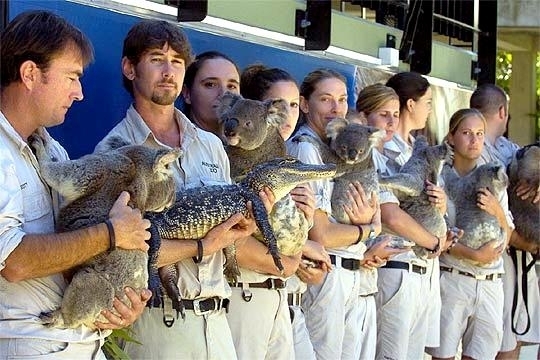 They are caring and sensitive about wildlife or people who need help. 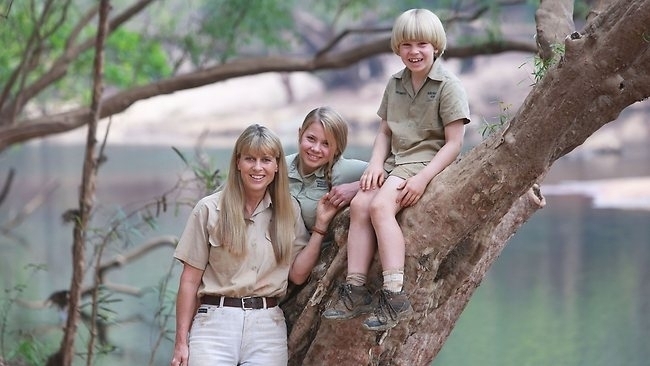 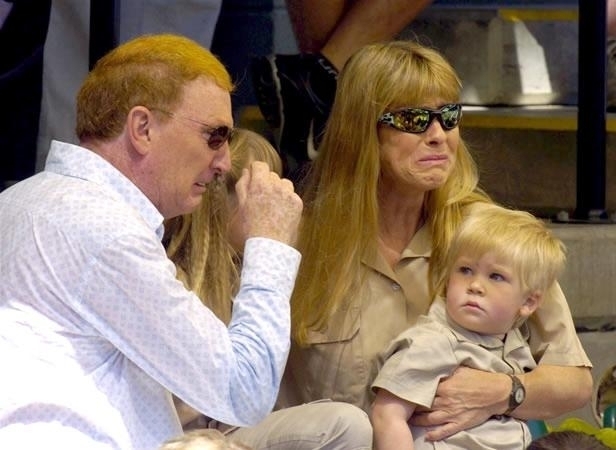 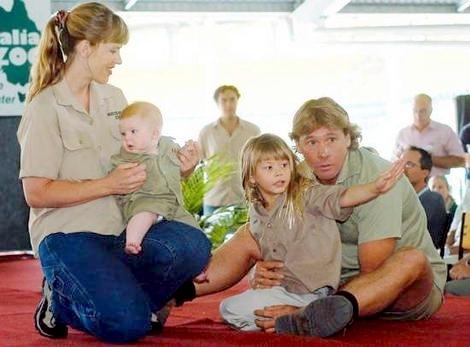 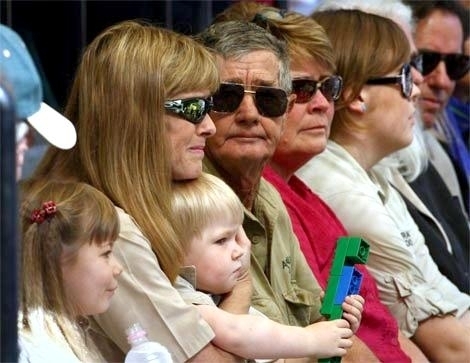 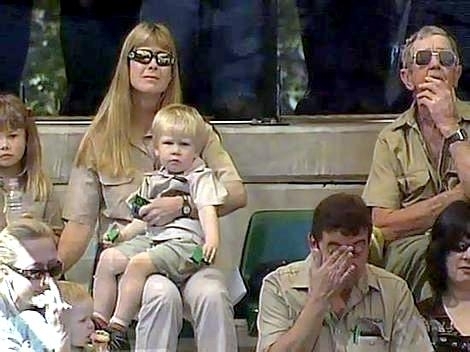 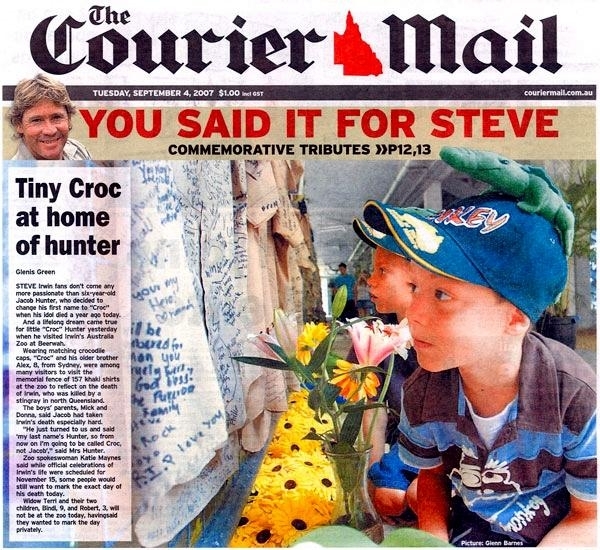 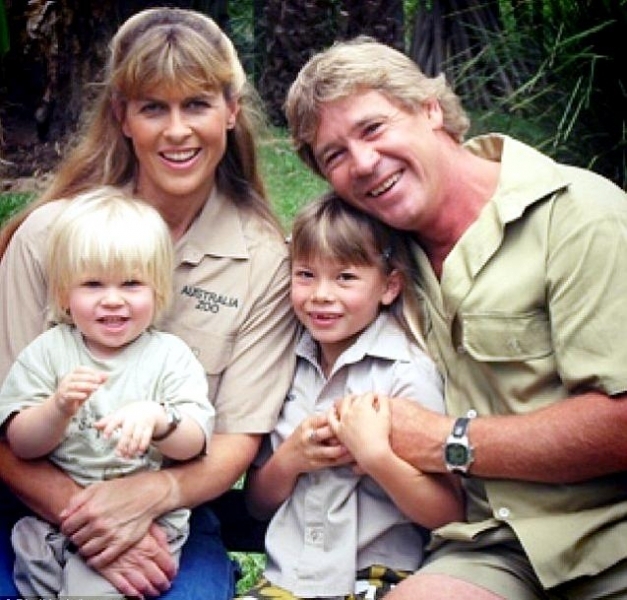 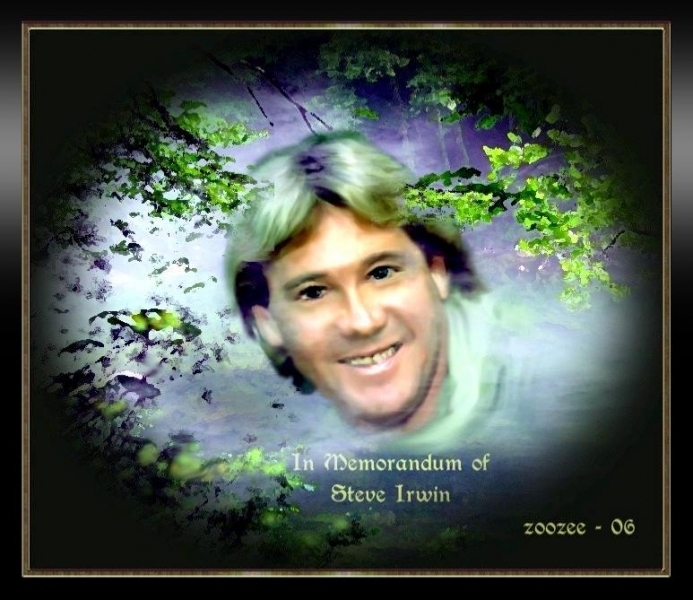 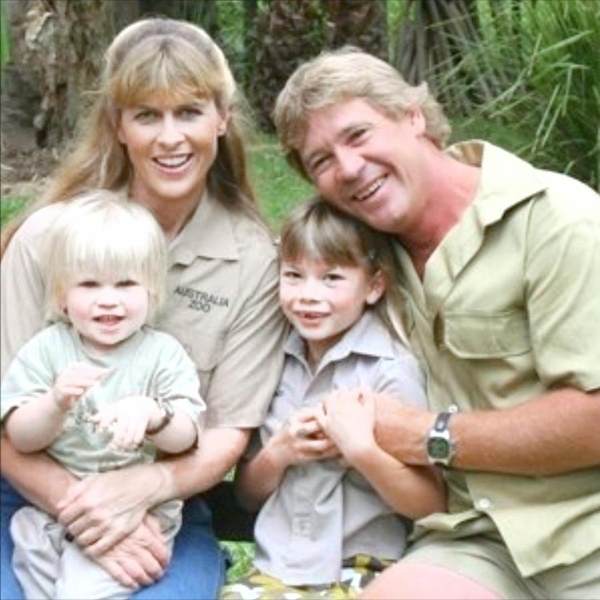 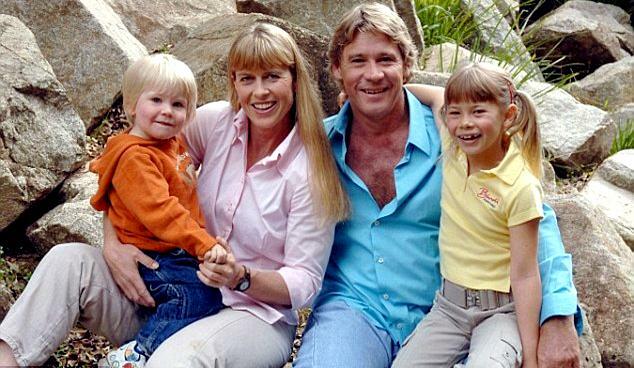 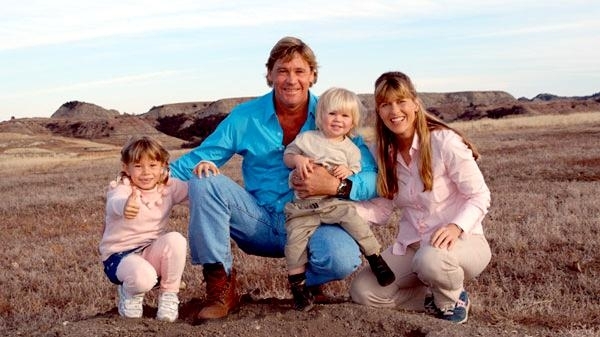 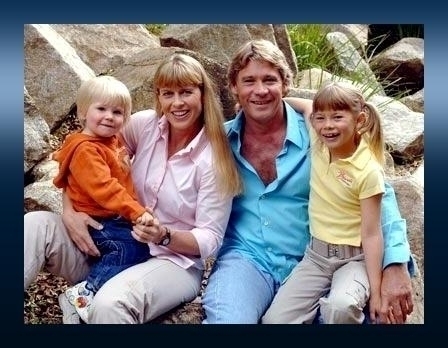 The greatest reward for Bindi & Robert would be to have the Steve Irwin Wildlife Reserve – a special conservation property dedicated to Steve – protected from mining. 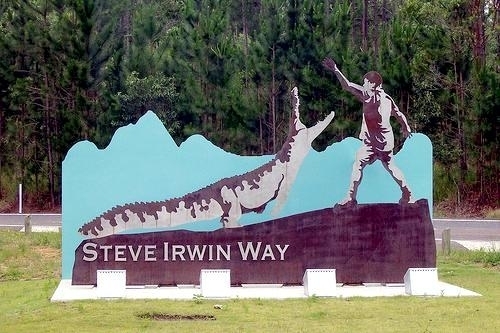 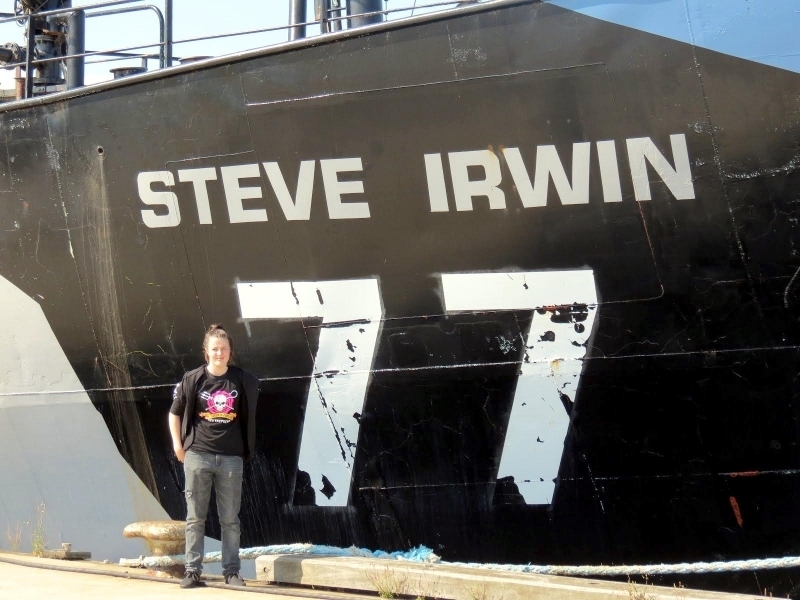 It is a living tribute to Steve and a place that is very dear to them. 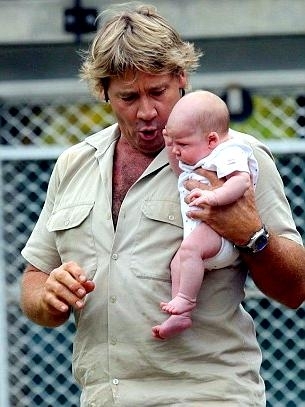 A CHIP OFF THE OLD BLOCK WITH HIS CHEEKY GRIN AND NATURAL CURIOSITY! 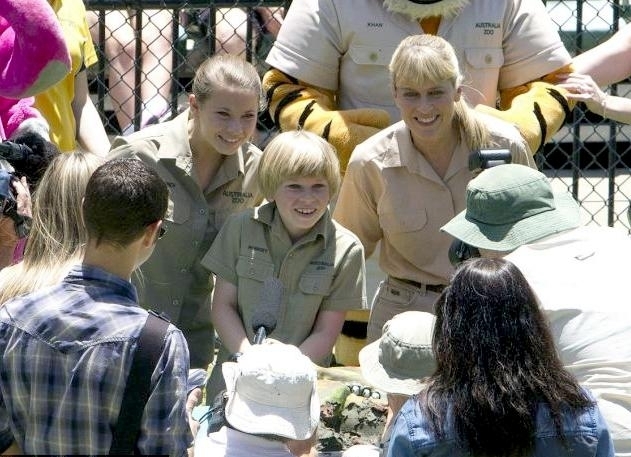 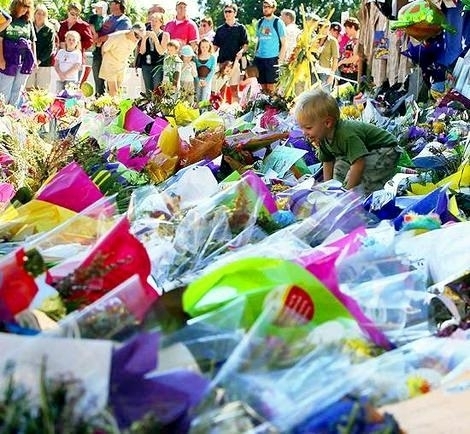 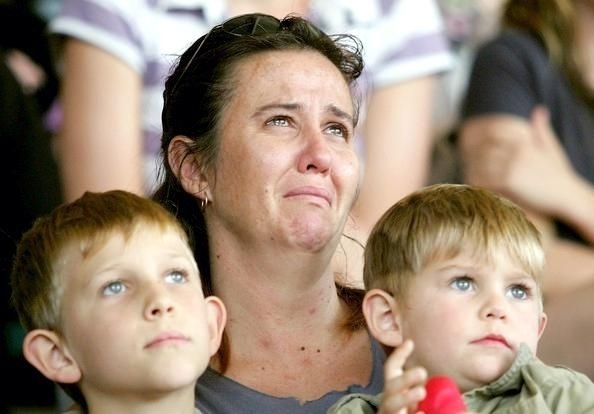 Robert Clarence Irwin was born on December 1, 2003 and his abundance of energy at Australia Zoo is contagious. 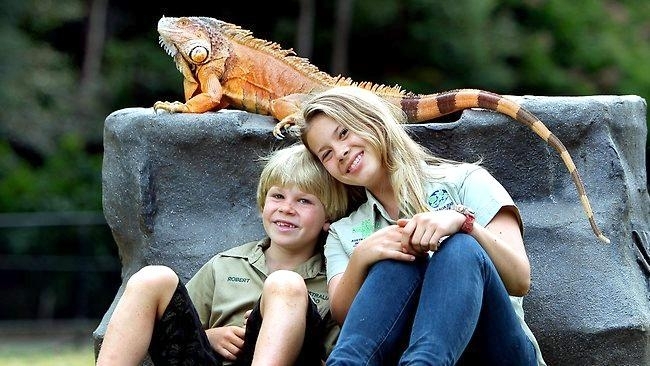 At only 10 years old, Robert is a chip off the old block and with his cheeky grin and natural curiosity, he loves nothing more than catching lizards & skinks, learning about wildlife and the Australian bush and hanging out with his much-adored sister Bindi. 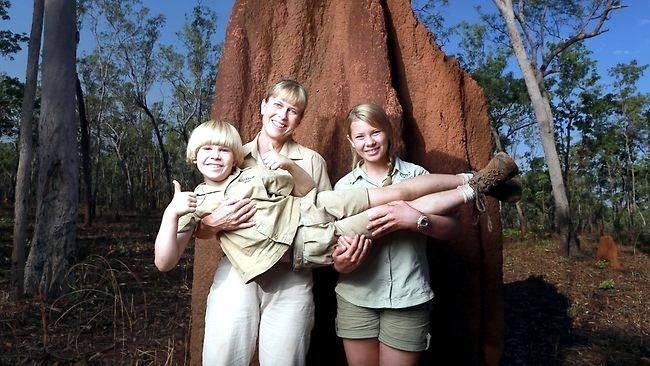 Like his mum and sister, Robert has also been quite the jet-setter & traveled all over the world attending events like the Emmy’s and the Nickelodeon Kid’s Choice Awards. 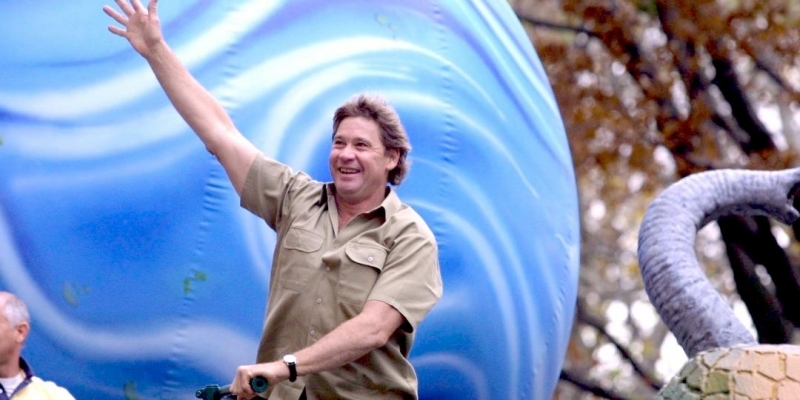 Robert also traveled to South Africa in 2009 for an exciting filming project, making his cameo appearance, alongside star sister Bindi in the full-length feature film Free Willy: Escape from Pirate’s Cove. 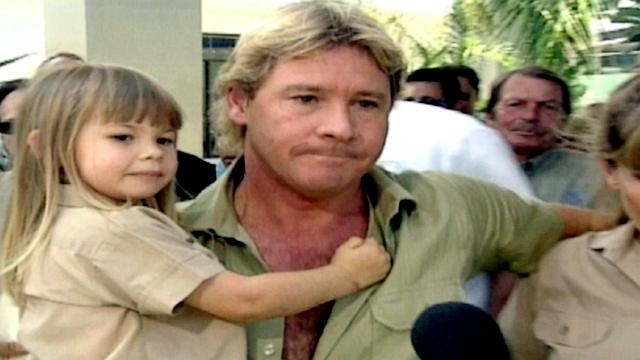 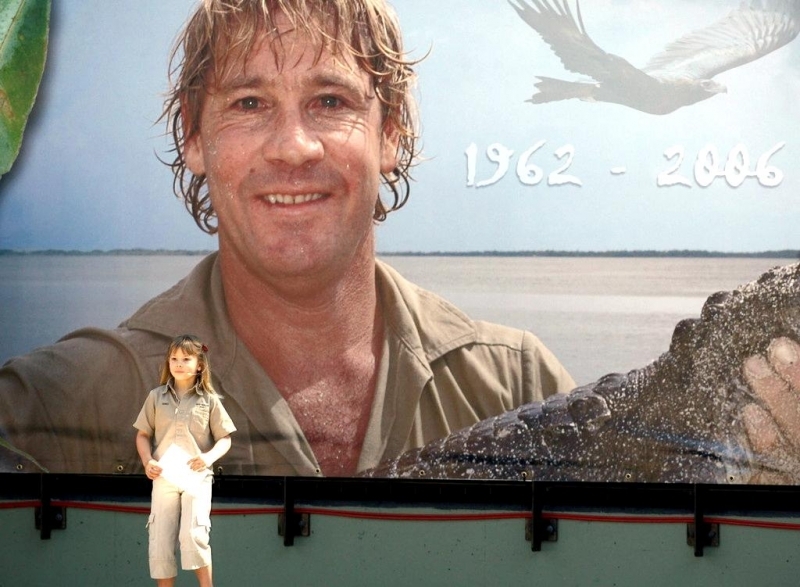 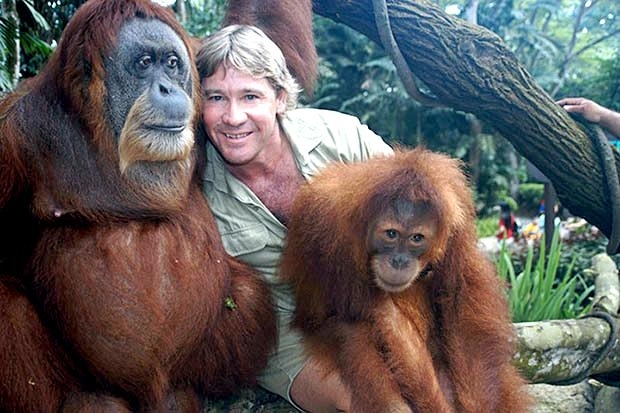 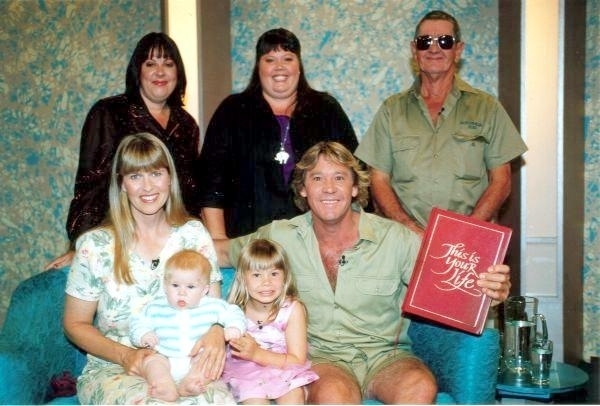 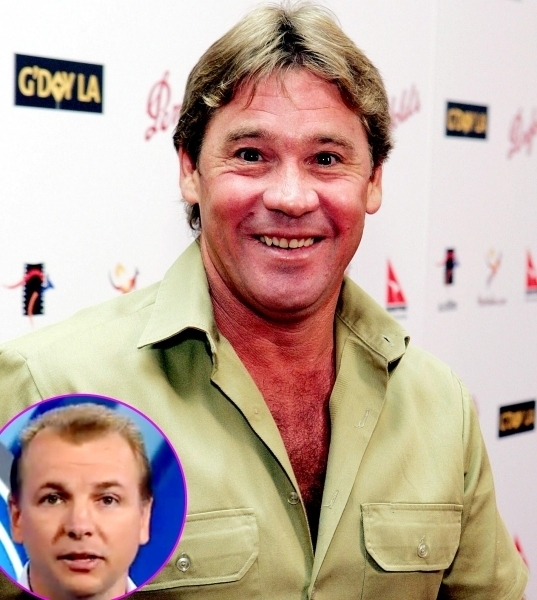 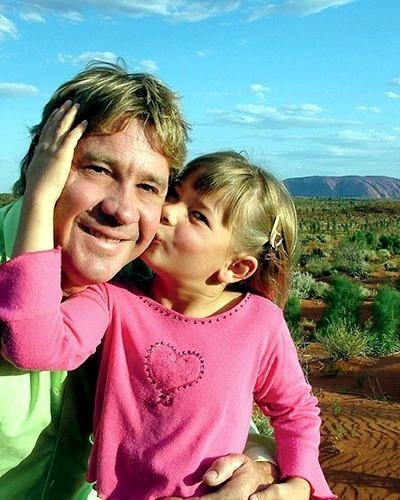 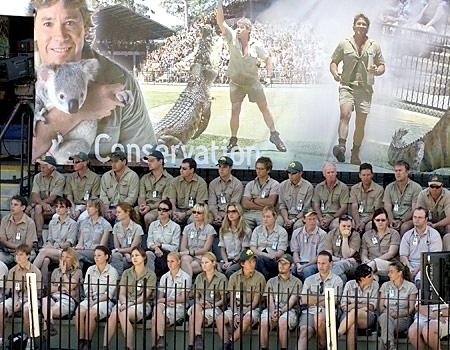 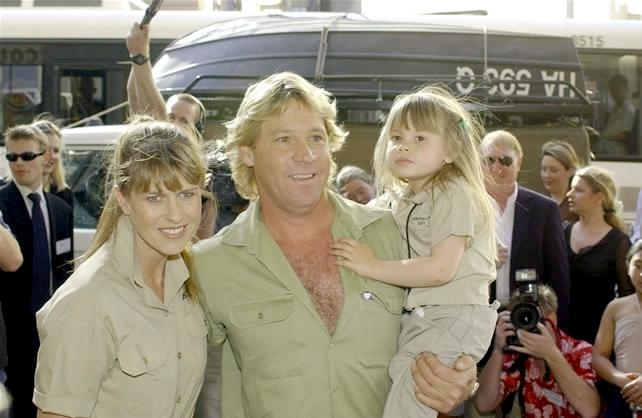 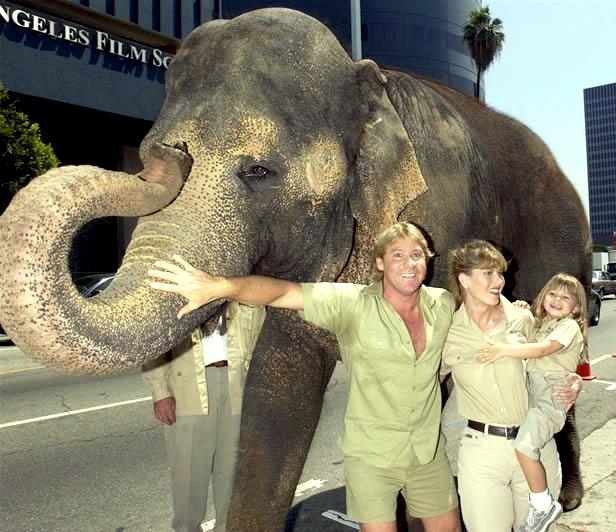 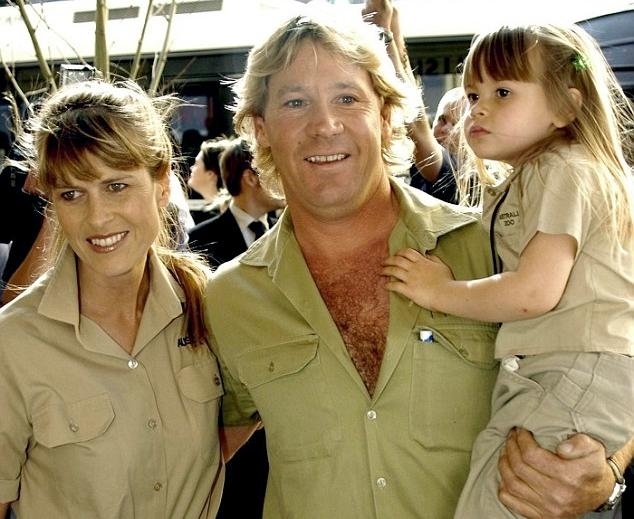 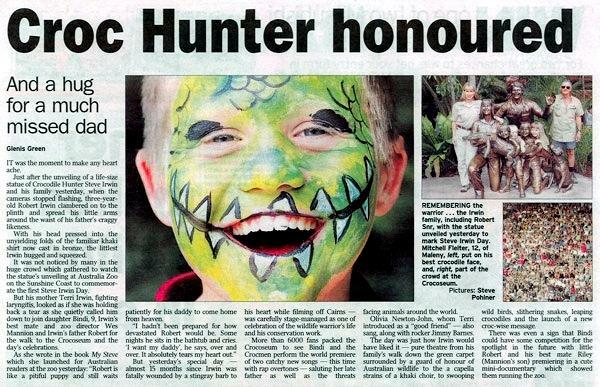 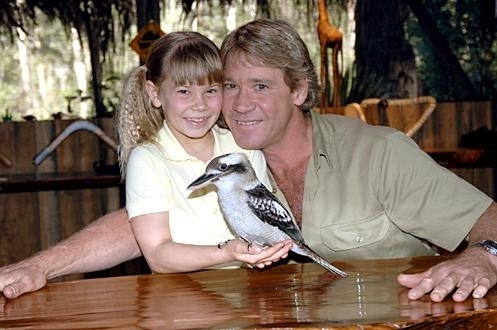 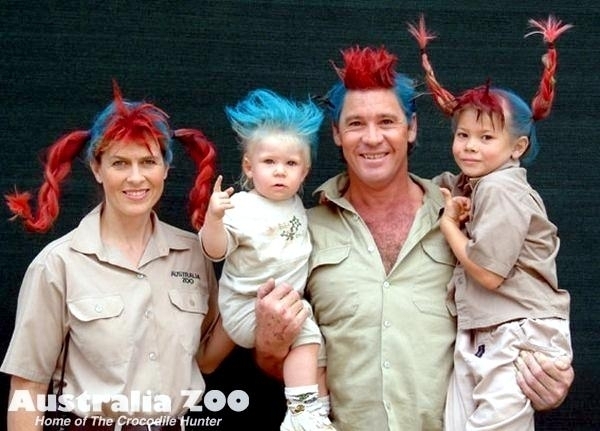 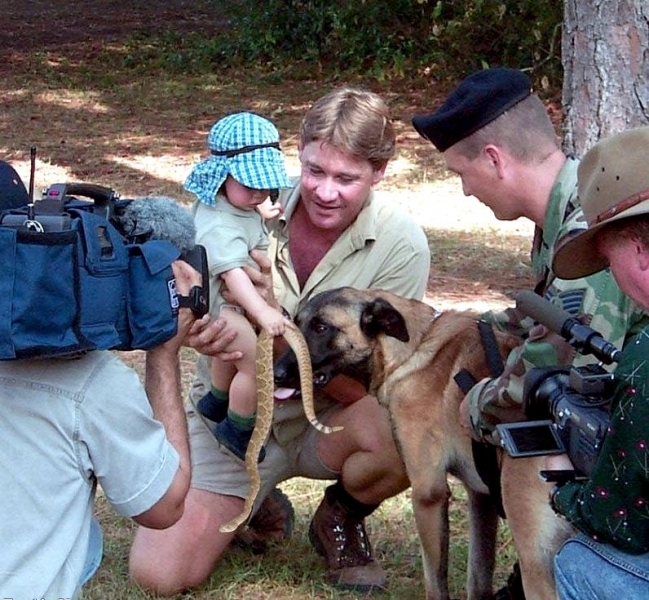 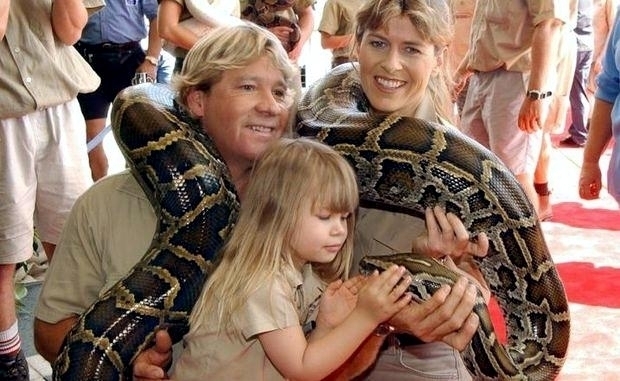 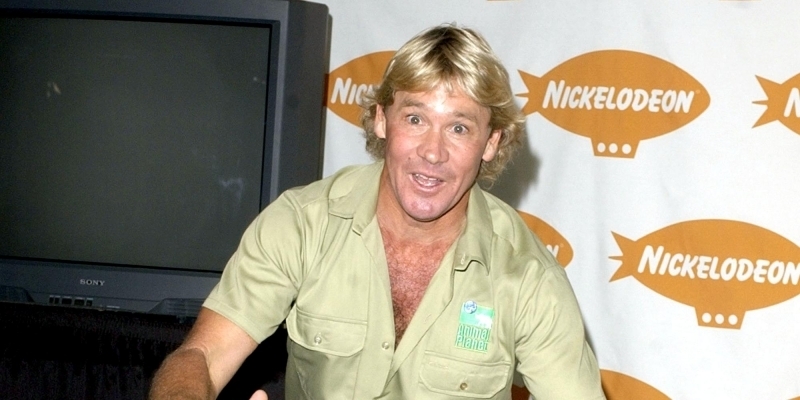 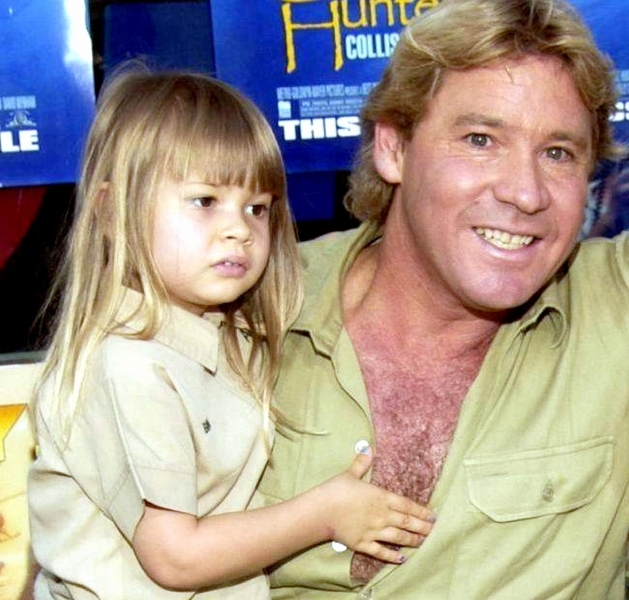 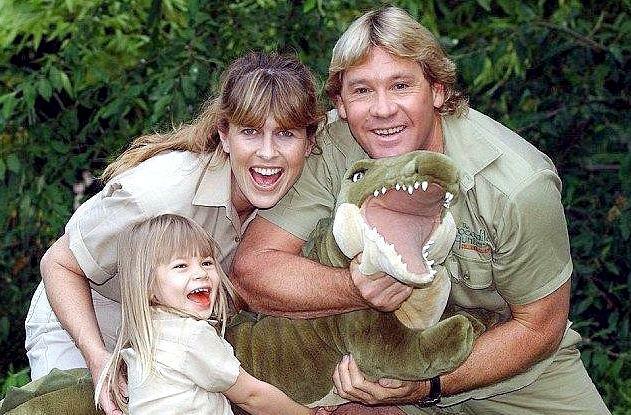 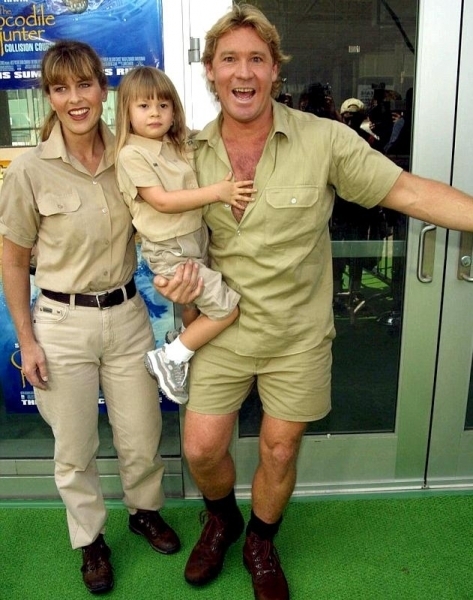 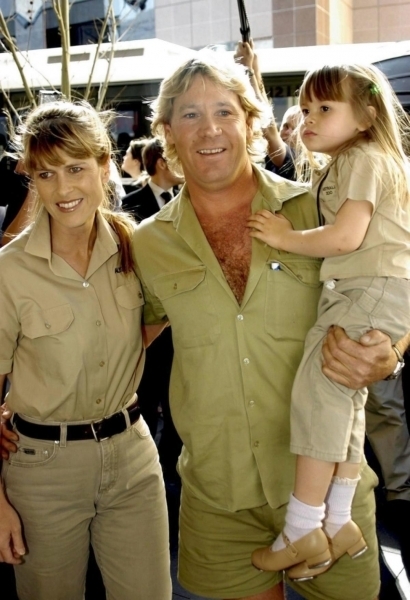 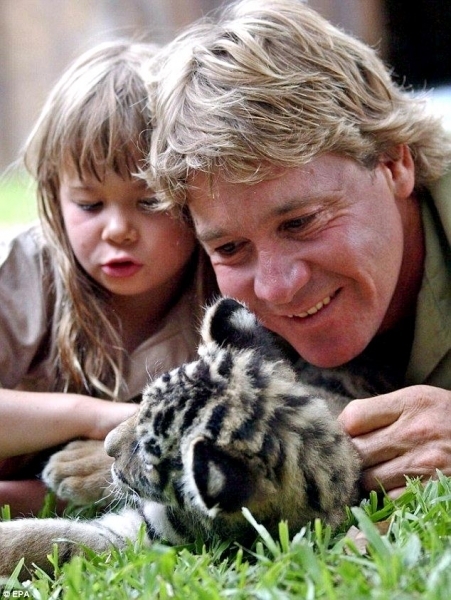 Both Wildlife Warriors, Bindi and Robert received the ‘Biggest Greenies’ award at the Nickelodeon Kids Choice Awards in 2009, dedicating it to their dad Steve and the Steve Irwin Wildlife Reserve (SIWR) in Cape York. 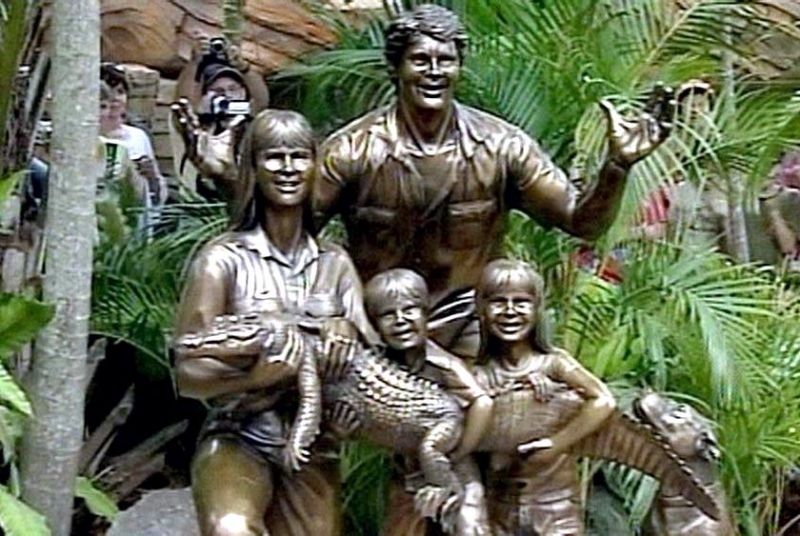 This was topped off by their induction into the “Hall of Slime” in 2011. 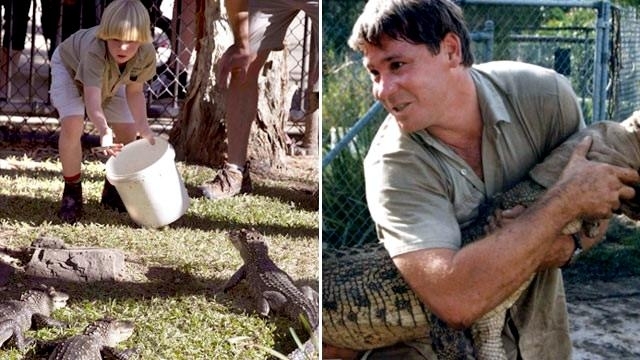 Every year, Robert is a part of the annual Australia Zoo croc research trip up in far north Queensland, helping the experienced croc team catching & tagging crocodiles with tracking devices before releasing them back into the wild. 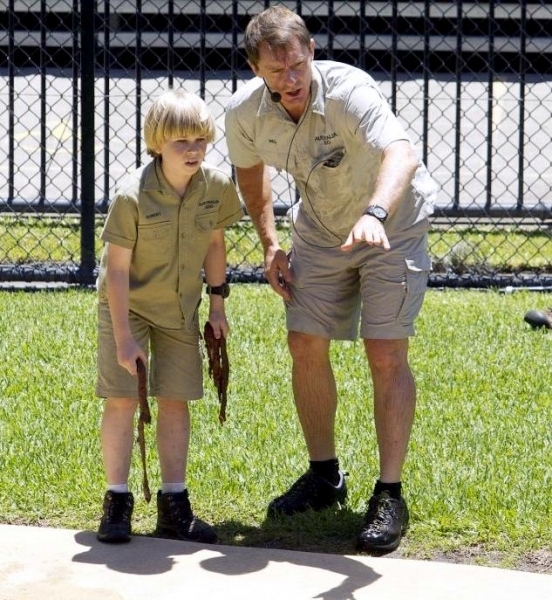 Robert is super keen to learn all he can about the natural behaviors & migratory patterns of these modern-day dinosaurs. 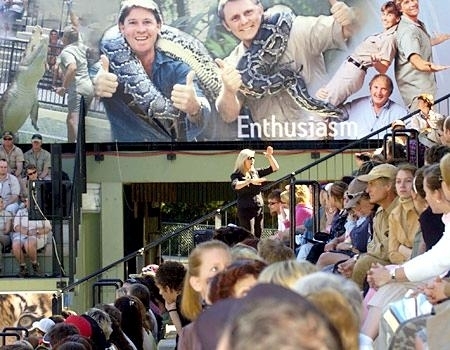 Robert is excited to share his worldwide wildlife journeys, so much so that he stars on his own Australia Zoo TV channel ‘Robert’s Real Life Adventures’. 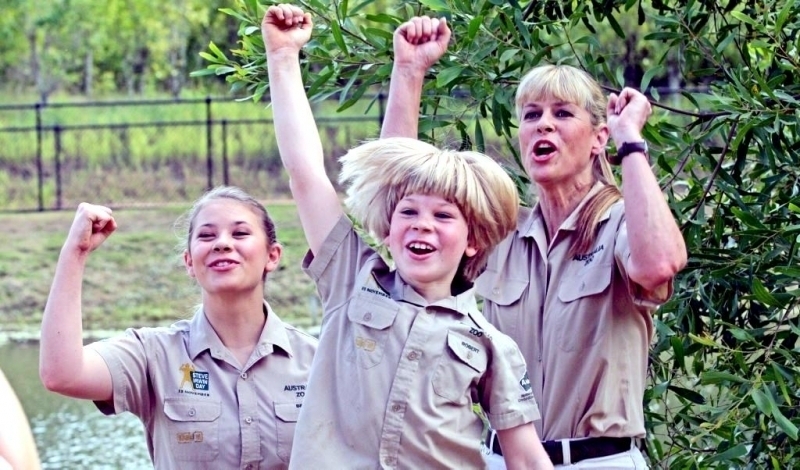 When Terri, Bindi and Robert are on the road traveling together, you can follow their exciting adventures online. 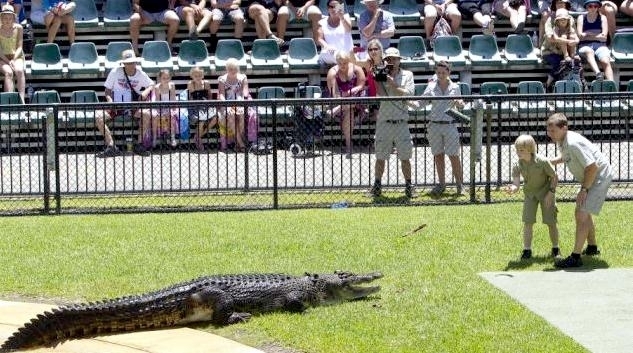 Australia Day 2012 was a very exciting day for Robert, as he publicly fed Australia Zoo’s American alligators for the very first time, much to the delight of zoo guests. 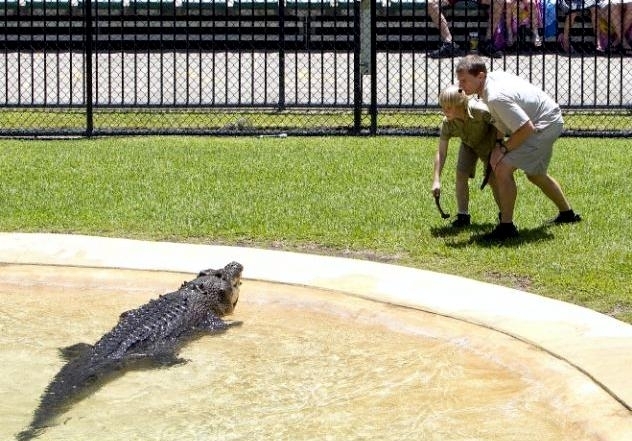 Robert had such a great time feeding the alligators, he can’t wait until he is a little bit older and able to feed the crocs. 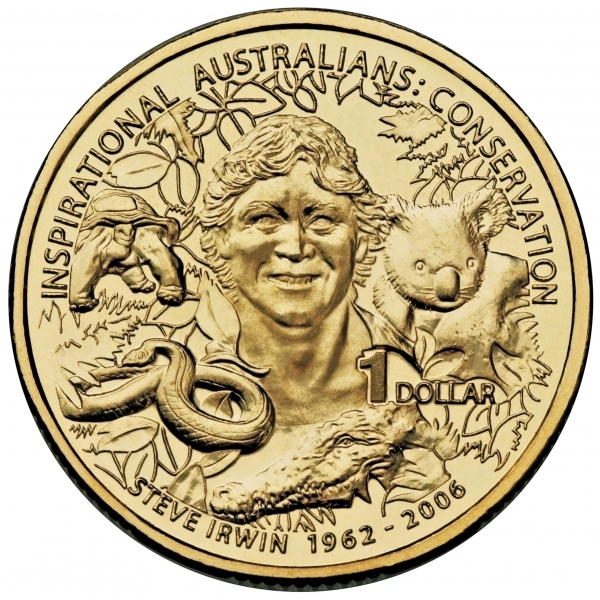 Robert also co-created his own book series: “Robert Irwin: Dinosaur Hunter” for which he is also doing the illustrations.